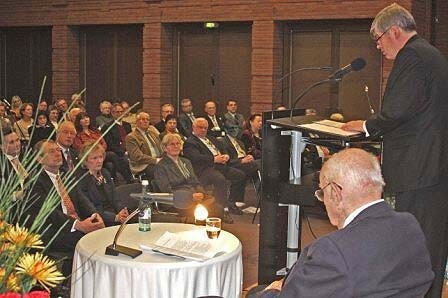 This section only contains some highlights with an English summary. 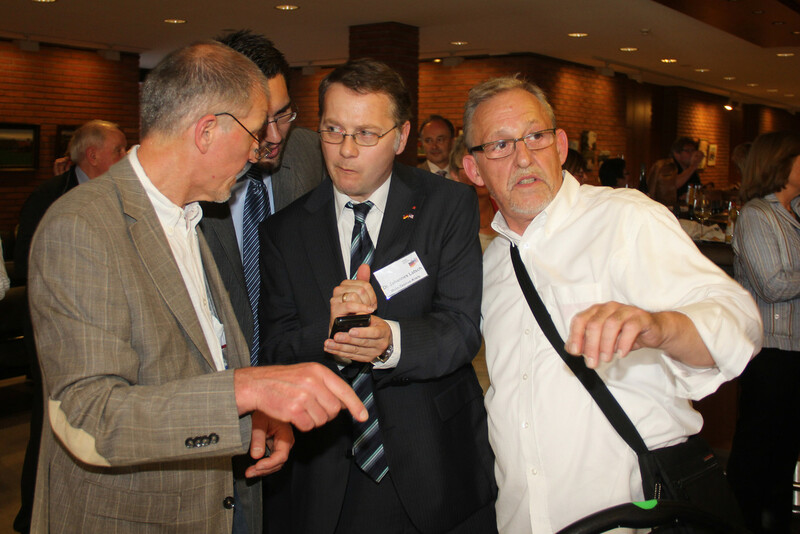 The press releases are all in German. 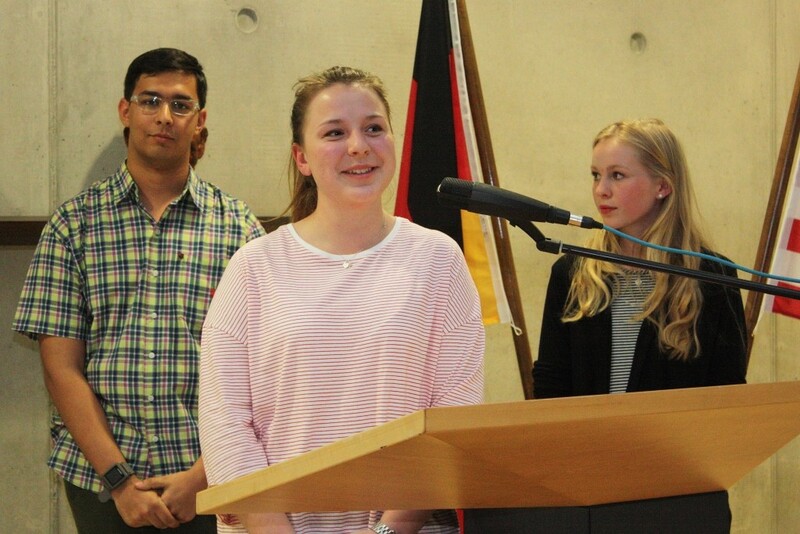 To read them, please change to the German version of this website (flag button in the right column) and go to the section "Nachrichten". 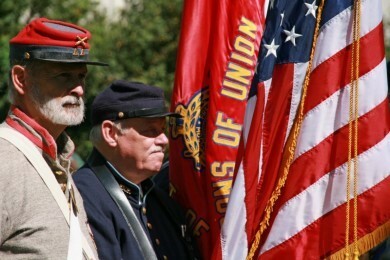 After this, you can return to the English version by pressing the flag button again. 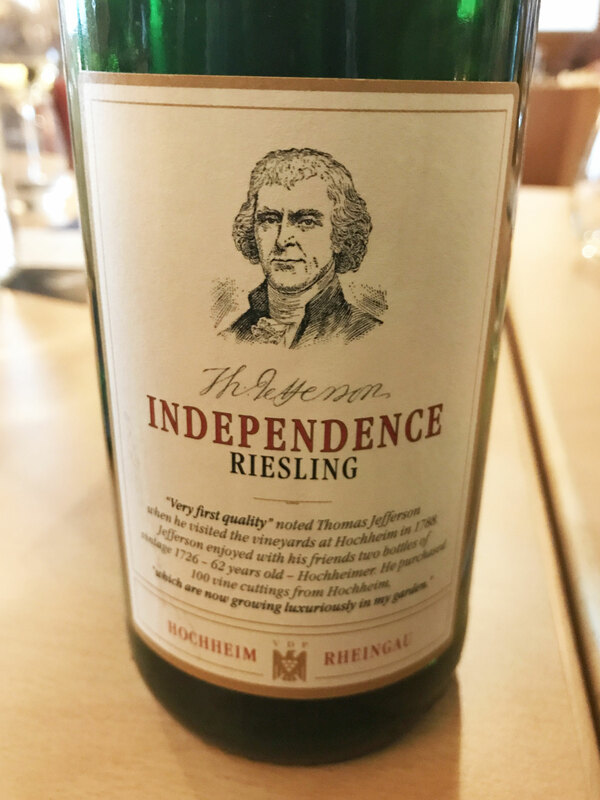 Hosted by the City of Hochheim and the George Marshall Society, an evening in Hochheim focused on former US president and wine connoisseur Thomas Jefferson. 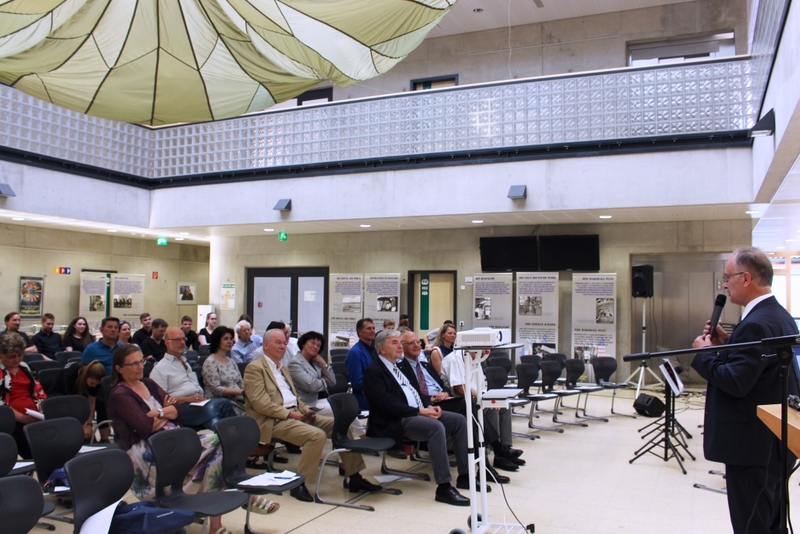 "Marshall Plan no patent remedy"
The series of events celebrating the coming into effect of the Marshall Plan 70 years ago has started. 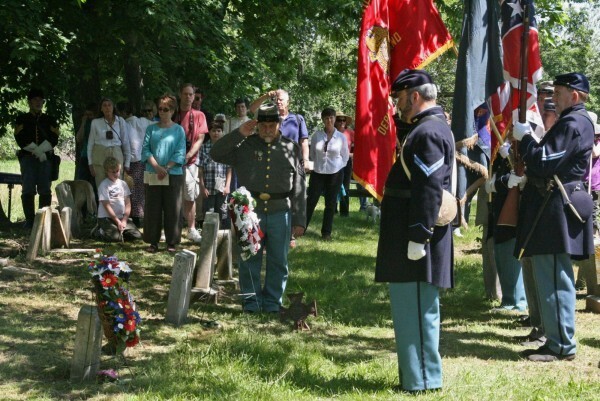 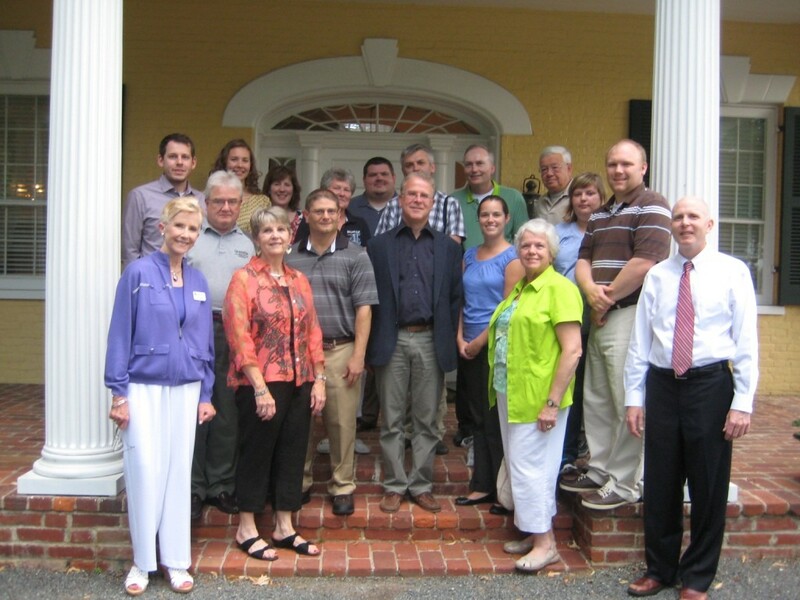 A lecture with various participants took place at the George Marshall House in MTK. 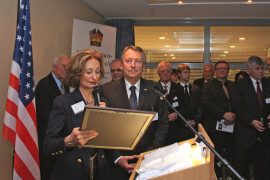 (See the attached press release and the Picture Gallery with photos by MTK). 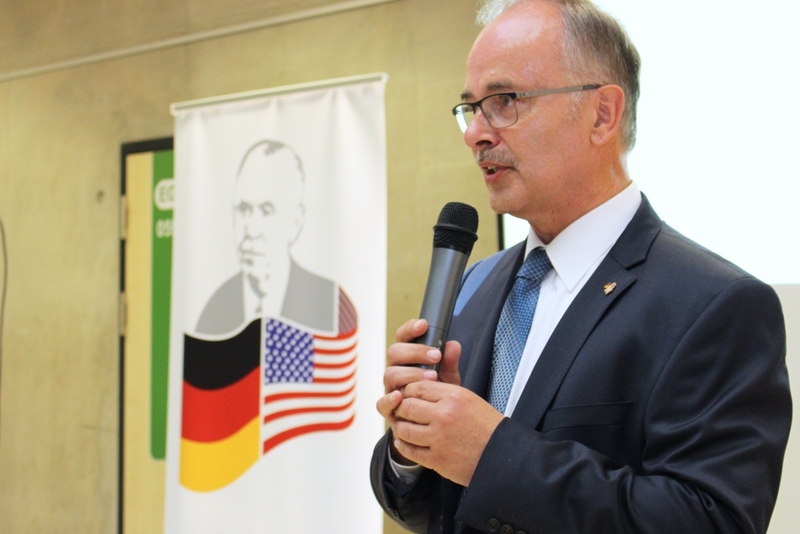 To commemorate the Marshall Plan and its meaning for German-American partnership the Marshall Society plans a series of Events starting May 29, 2018. 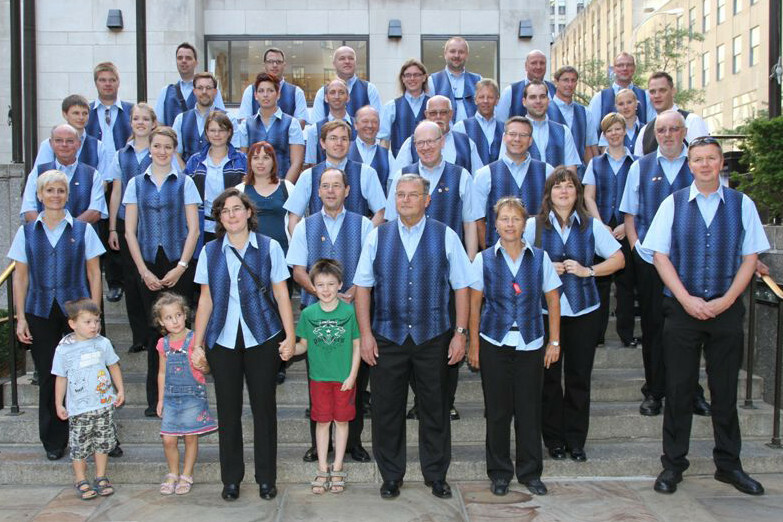 They take place in the towns and cities of Frankfurt, Bad Soden, Kriftel and Bad Homburg. 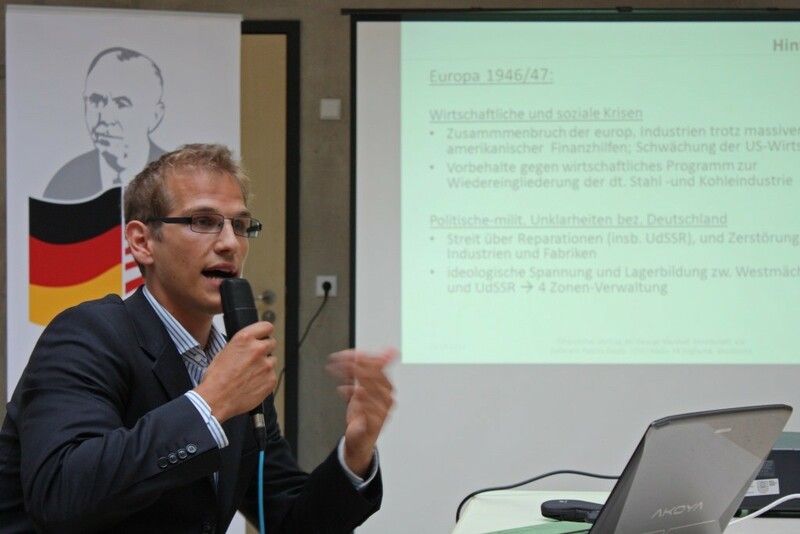 70 years ago the Marshall Plan came into being. 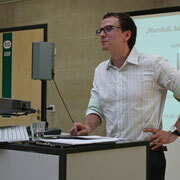 In an English Thesis at the University of Mayence, Patrick Rauda analyzes discussions in the State Department of that time. 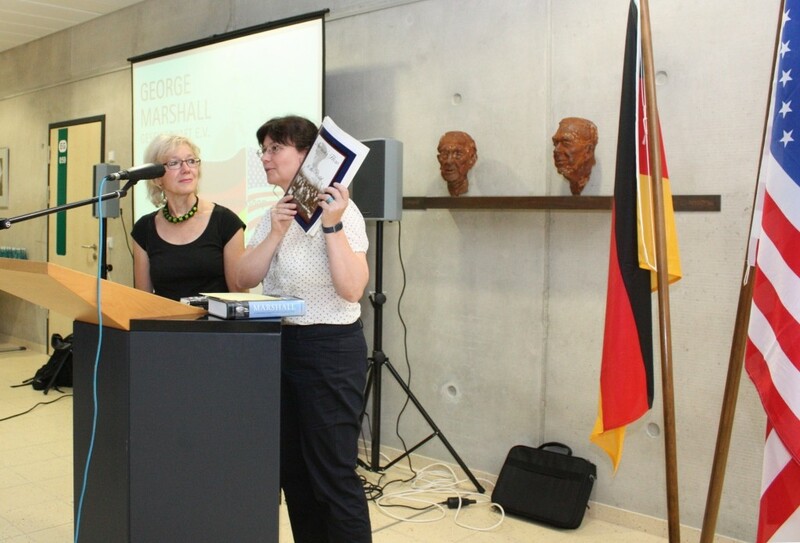 The Thesis was supported by the George Marshall Society. 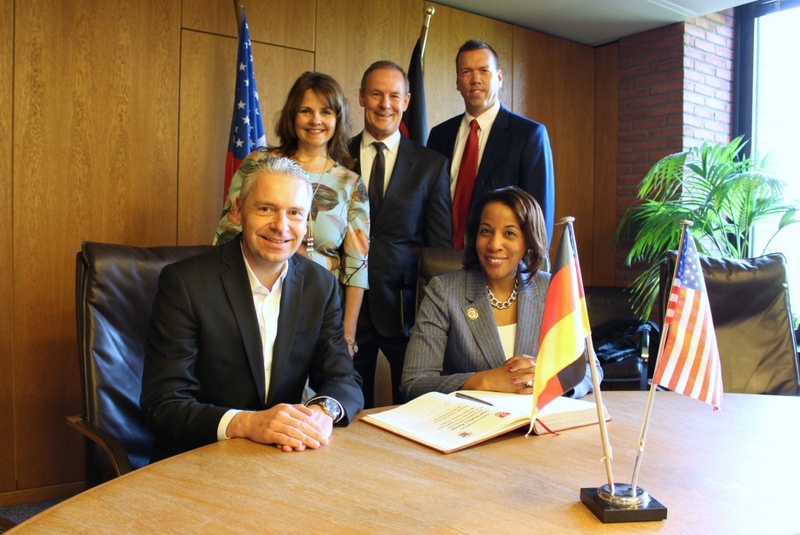 The partnership between Main-Taunus Kreis and Loudoun Country will be continued – this promise gave Loudoun’s new Chair of the Board of Supervisor, Phyllis Randall, during her first visit to MTK where she has been hosted by County Executive Michael Cyriax. 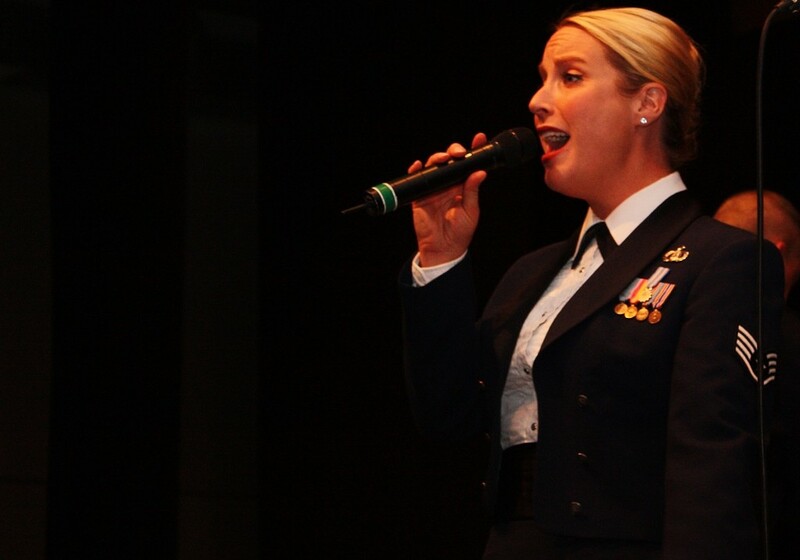 During her stay, she visited various schools and businesses. 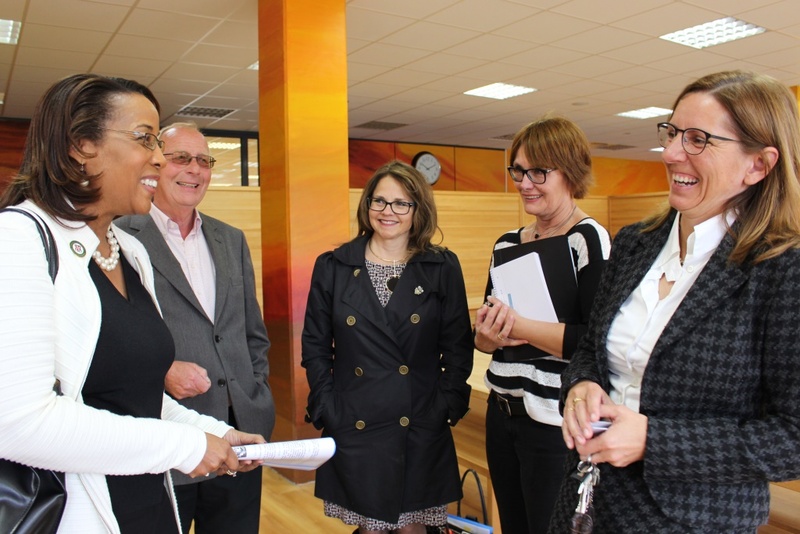 She was accompanied by tourism and business development staff. 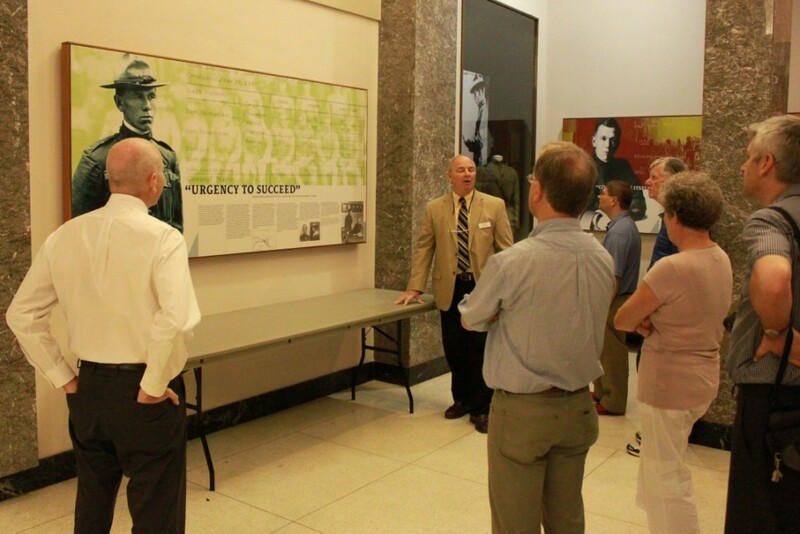 Also a theme was the support of the partnership by the George Marshall Society and the SPEP exchange. 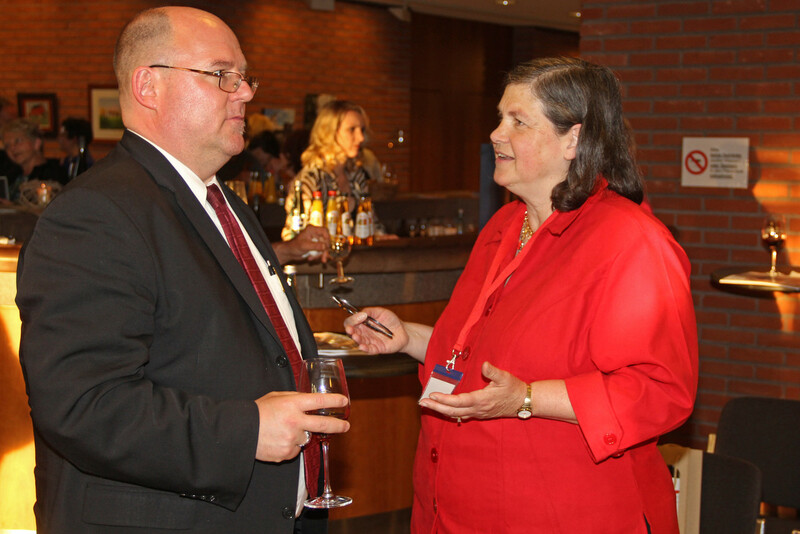 SPEP coordinator Edgar Nebel and Albert-Einstein School principal Anke Horn (also am member of our Society) informed about the exchange, and Phyllis Randall hat the chance to meet past and future SPEP students. 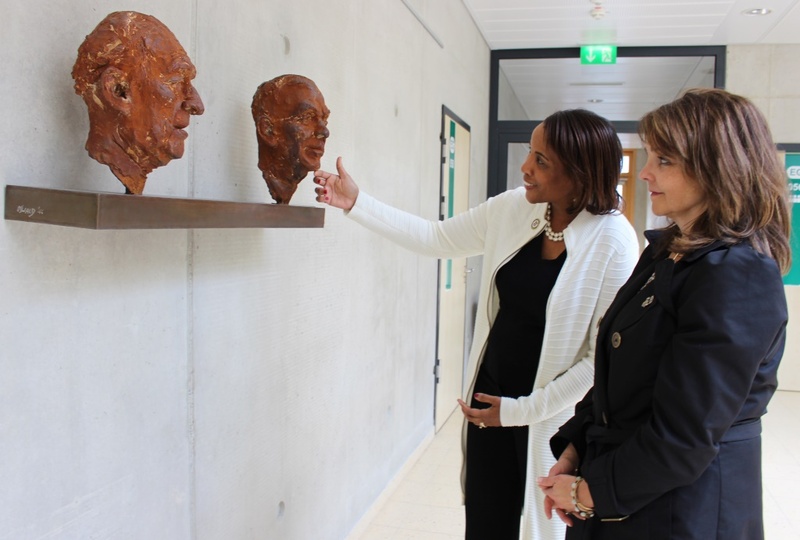 At Konrad-Adenauer School she visited the George-Marshall House, where a bust portraits Marshall. 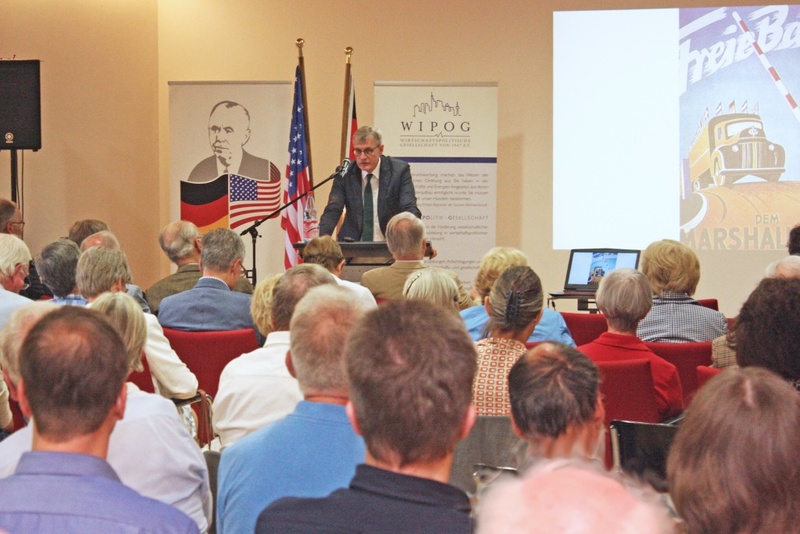 His plan for a reconstruction of Western Europe after WW II has been presented 70 years ago. 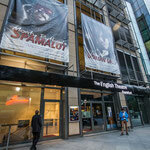 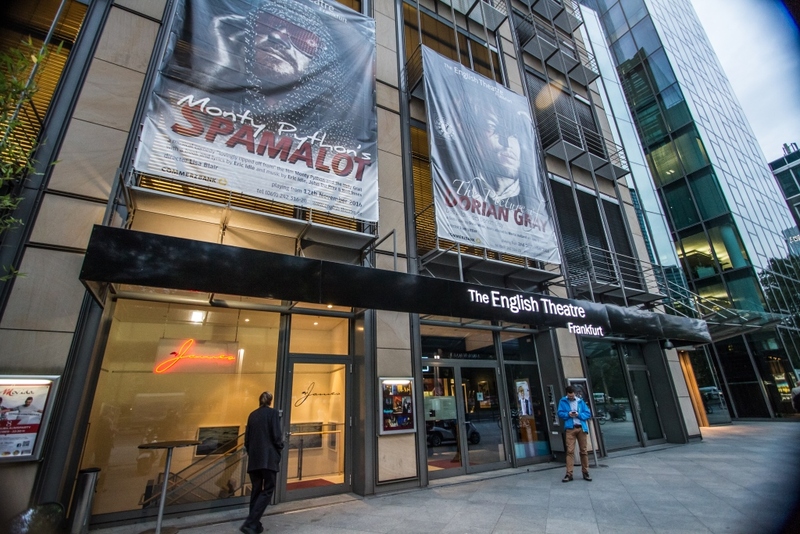 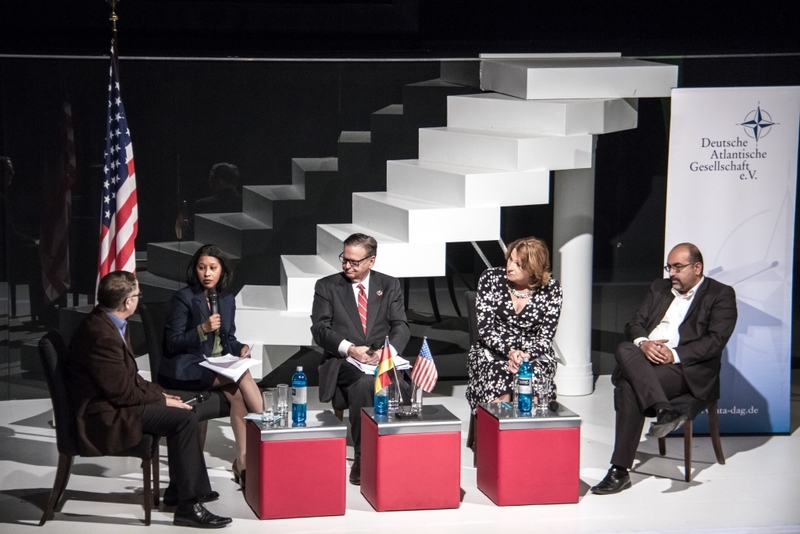 Theatre (Frankfurt). 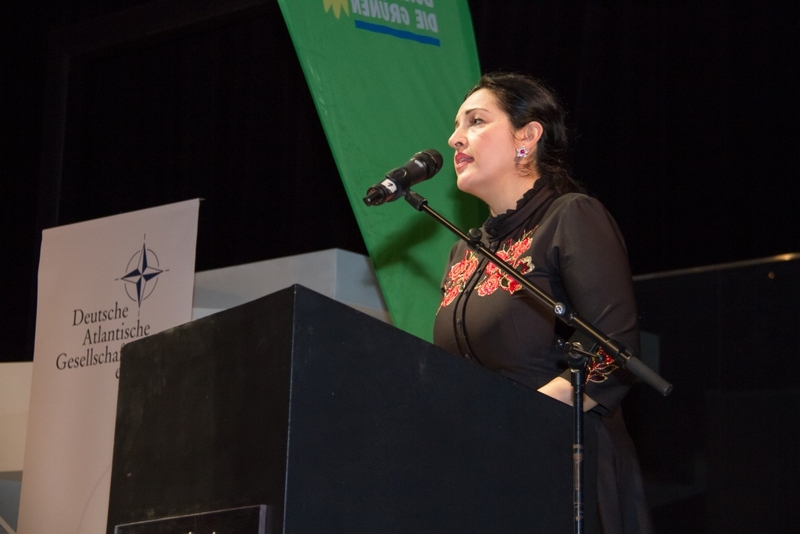 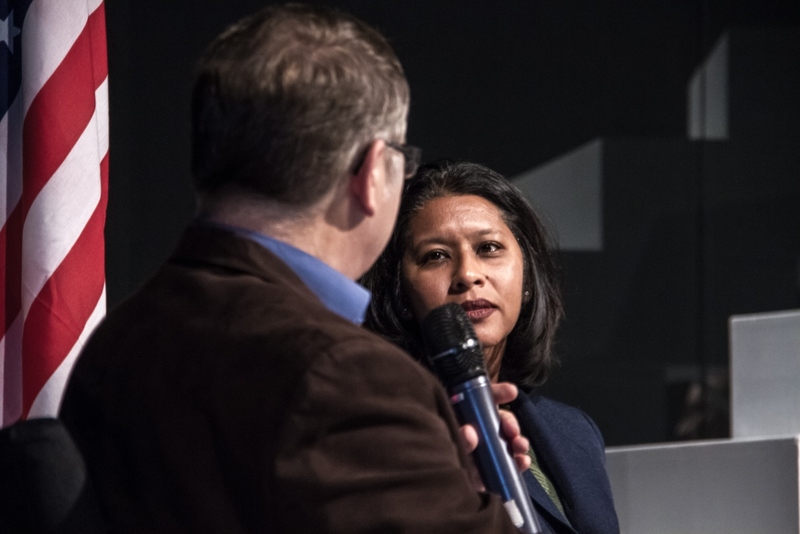 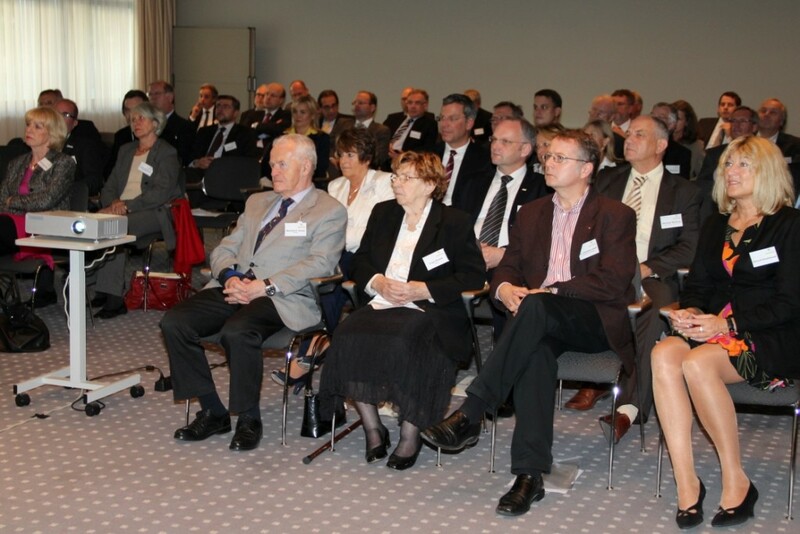 The event had been organized as part of the “International regulars’ table” which is hosted by various institutions in Frankfurt. 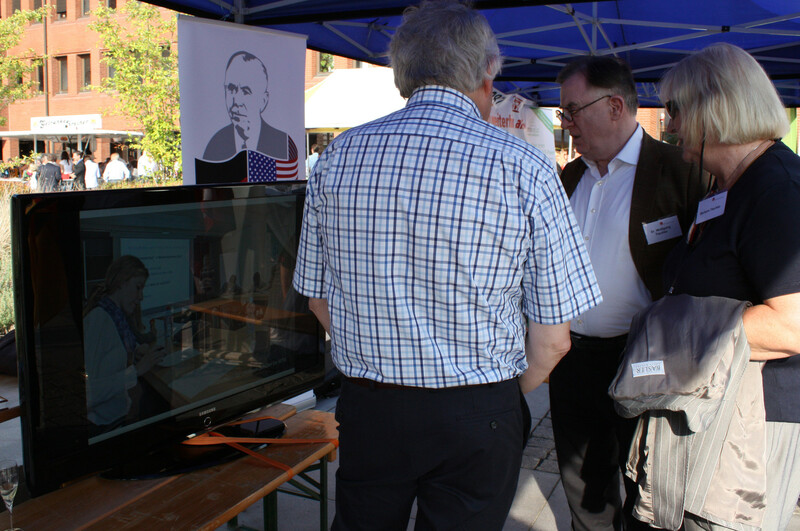 This time the George Marshall Society also took part. 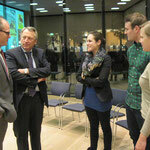 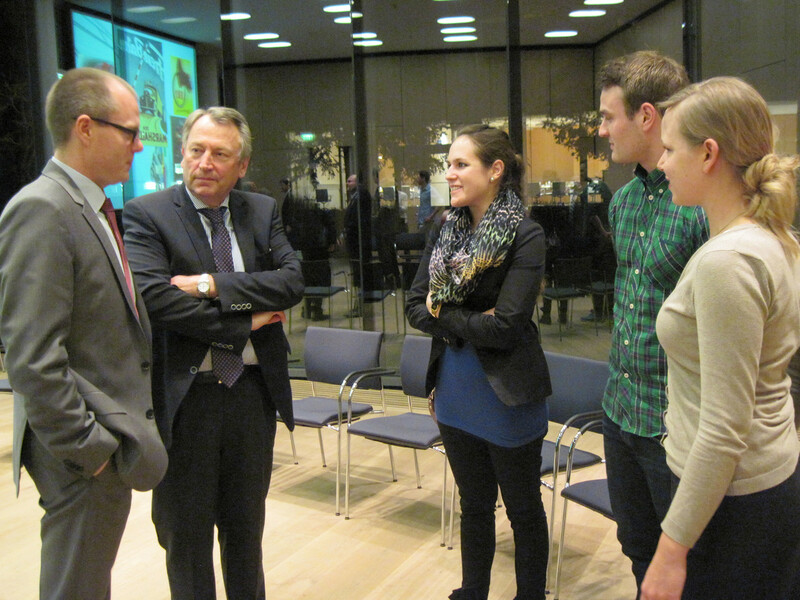 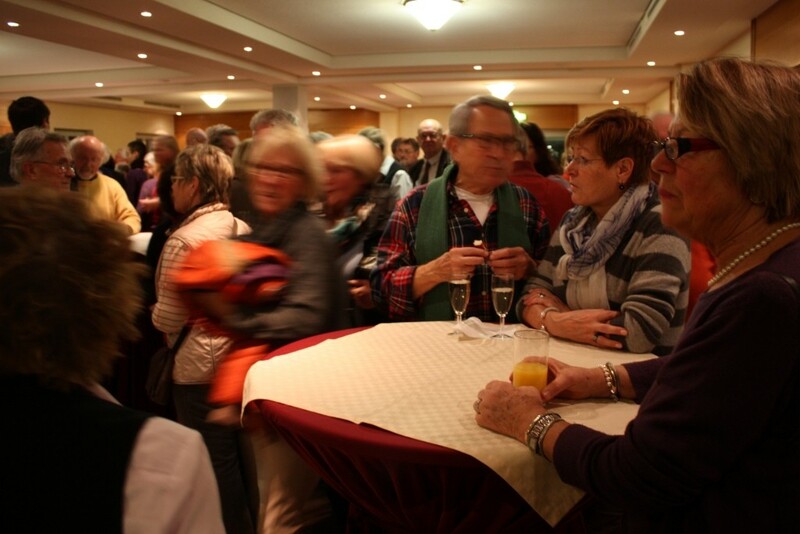 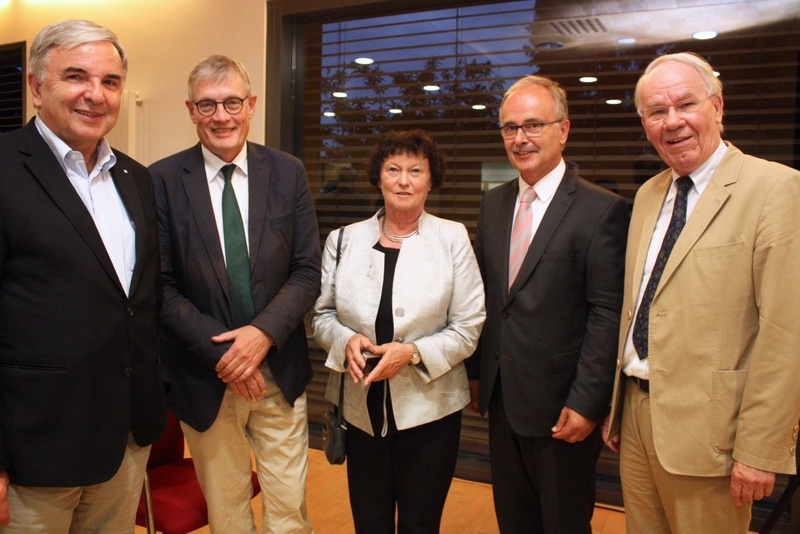 The program focuses on ex-pats living in the Frankfurt region. 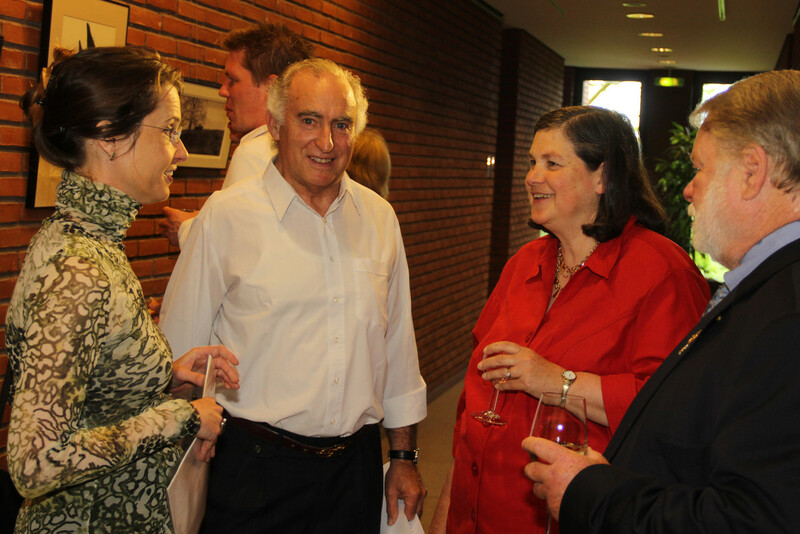 After some introduction words by Ava Nouripour of the German Atlantic Association a debate and discussion took place featuring Thomas Leiser of the Republicans Overseas, Marjorie Sudrow of the Democrats Abroad, Sudha David-Wilp of the German Marshall Fund and Omid Nouripour, Foreign policy speaker of the Green Party in the German parliament. 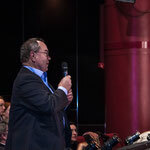 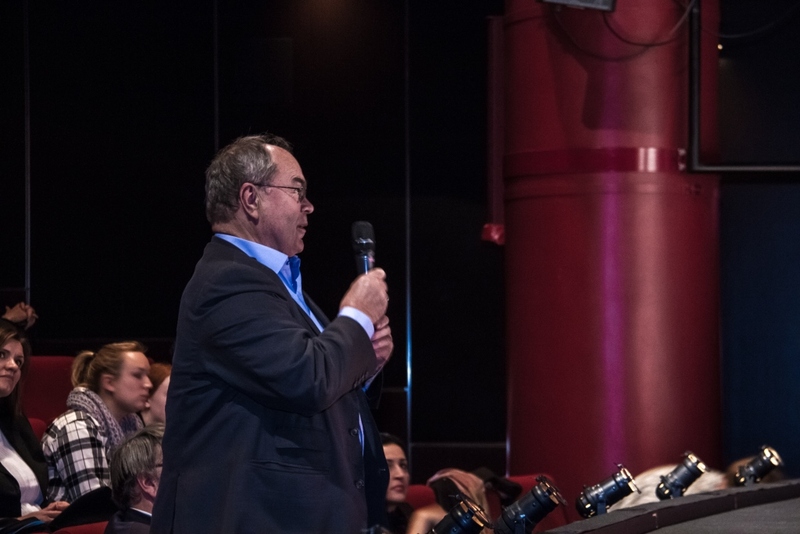 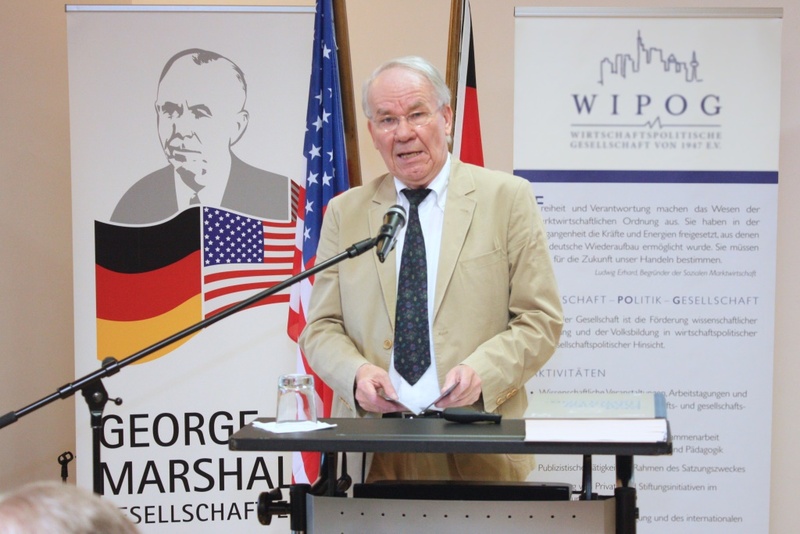 The discussion was presented by Dr Johannes Latsch, Managing Chairman of the George Marshall Society. 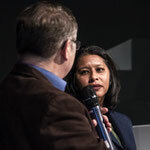 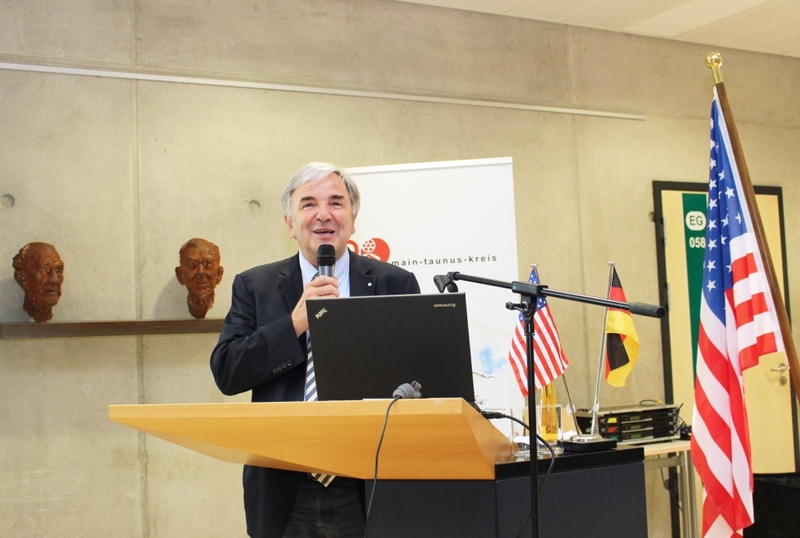 Dennis Phillips (picture above) of the "Democrats Abroad" talks about mobilizing US voters overseas in Germany. 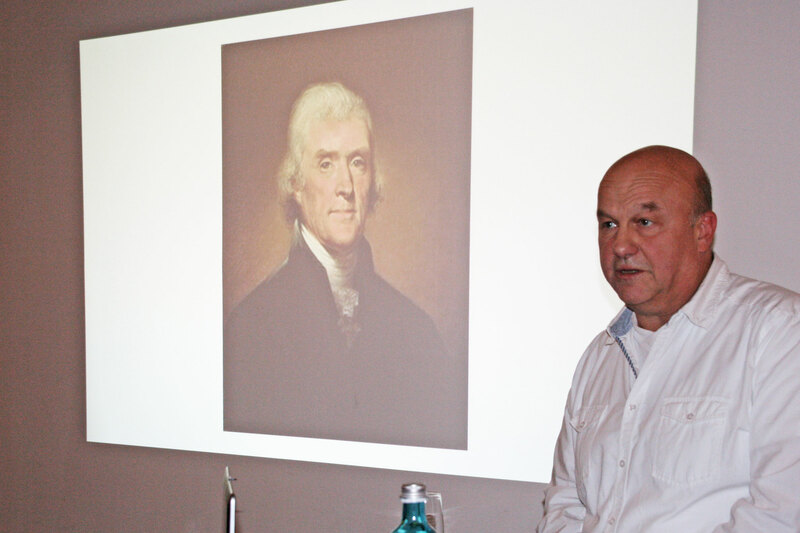 visit of US President Thomas Jefferson. 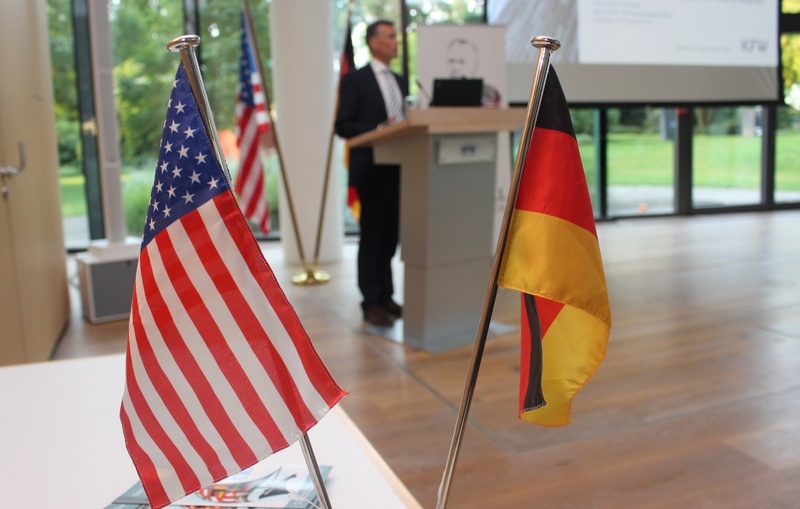 The partnership between Konrad-Adenauer School (KAS) in Kriftel/Main-Taunus-Kreis and CS Monroe Technology Center in Leesburg, Loudoun County (USA) continues. 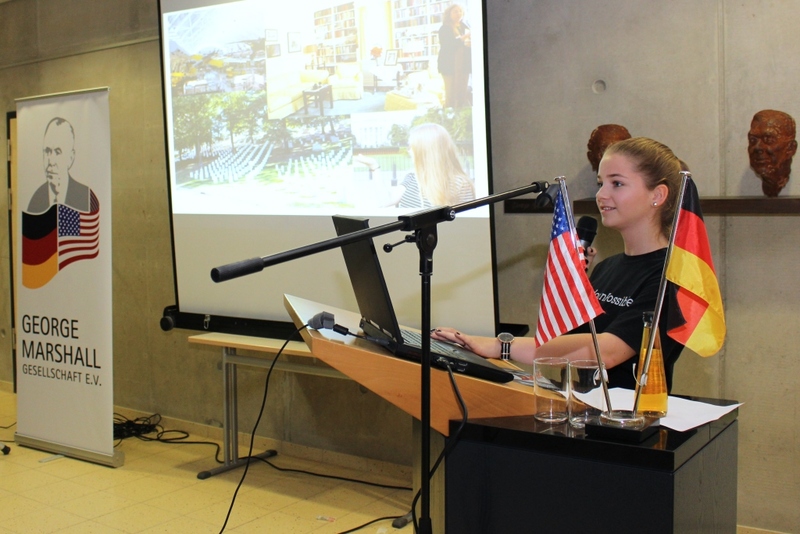 A student group from Konrad Adenauer together with school representatives was currently visiting CS Monroe and thus continued with the exchange program which is running for a couple of years. 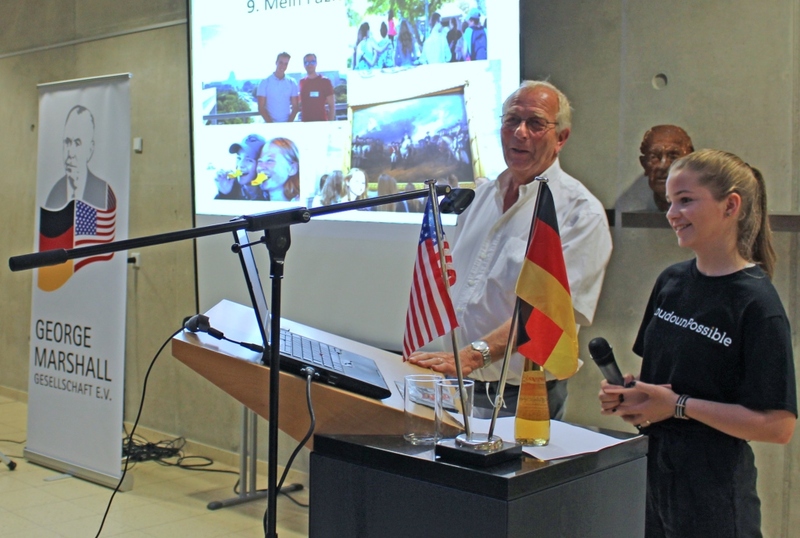 From KAS principal Stephanie Philipp and the teachers Frank Härdtlein and Alexander Mai joined the trip. 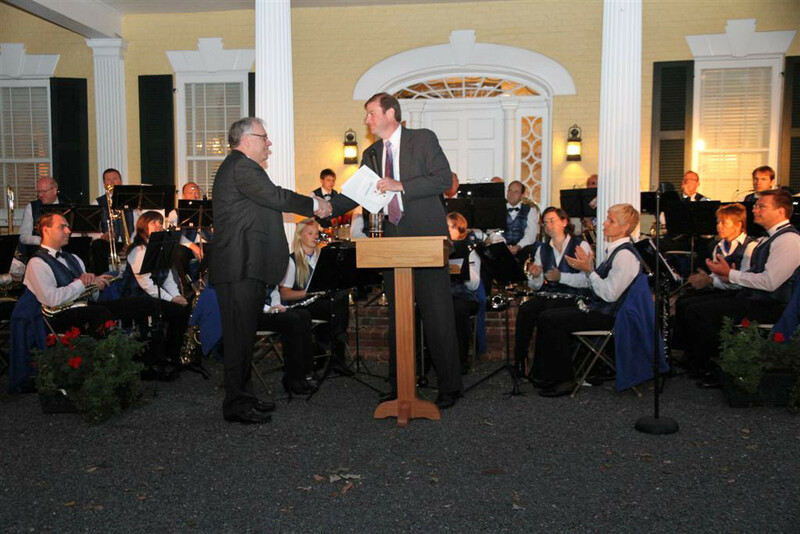 They met CS Monroe’s principal Wagner Grier who, for his commitment to the partnership, has been awarded by the George Marshall Society in MTK. 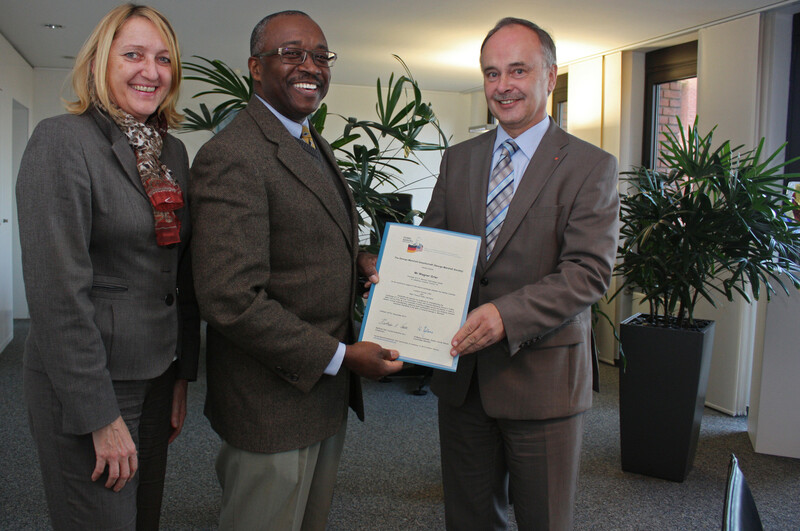 Deputy Wolfgang Kollmeier, also a Committee member to the Marshall Society, handed him over a certificate s support. 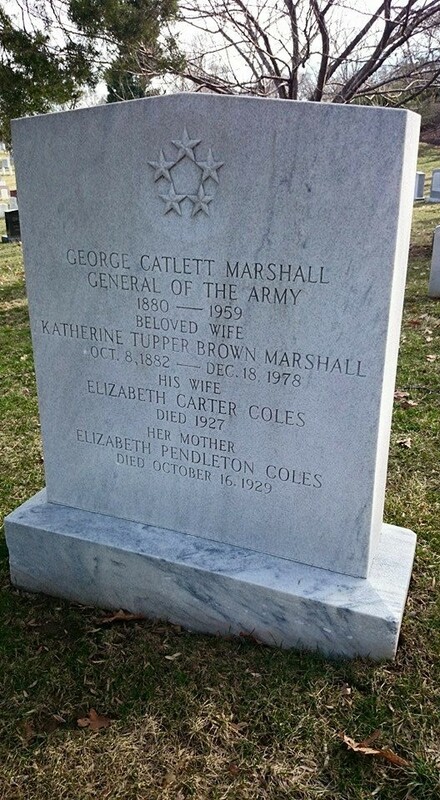 The group also visited General Marshall’s grave at Arlington National Cemetery. 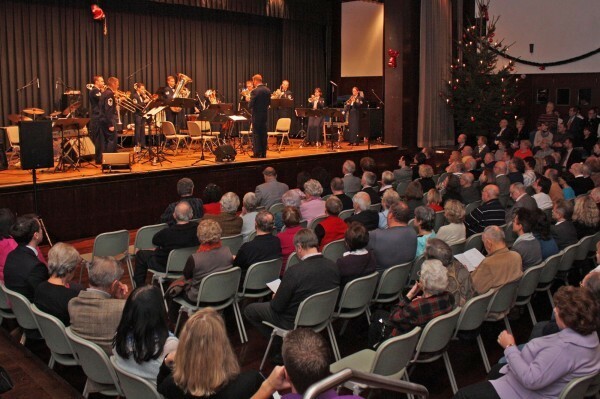 Under the title „Christmas Dreams in MTK“ the USAFE Concert Band performed in the Kelkheim City Hall, by invitation of the George Marshall Society. 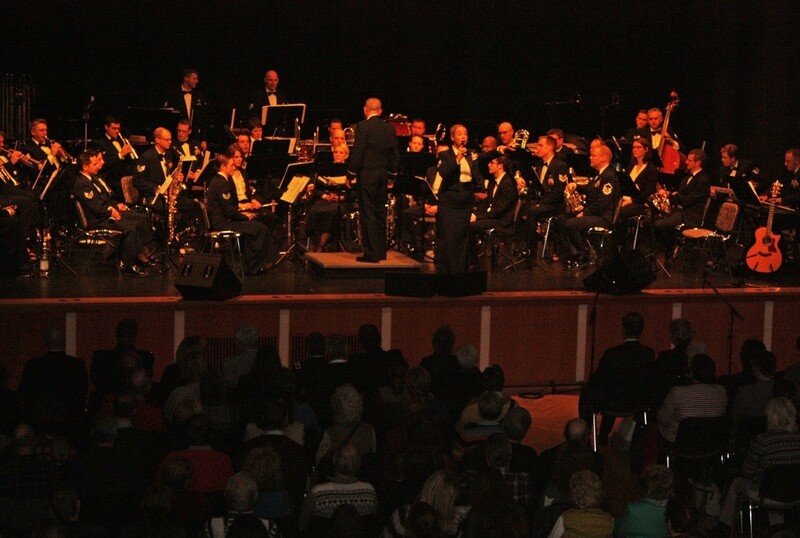 To a capacity crowd the 45 musicians played a rousing mix of Christmas Traditionals, Classical Music, Pop, Swing, and Rock. 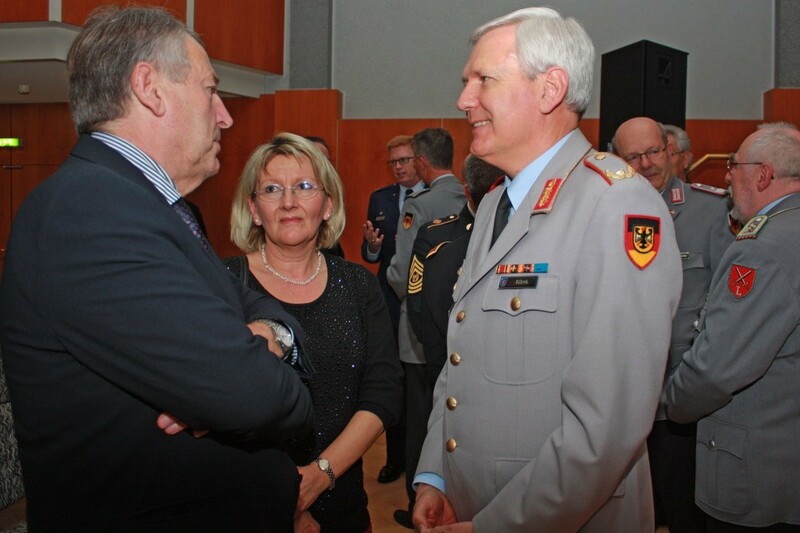 Among the audience were high-ranking representants of the German and American Forces. 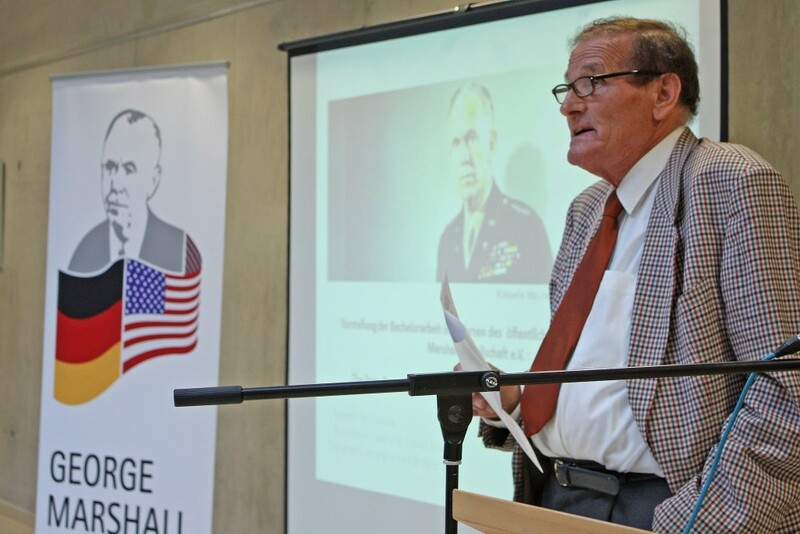 Prof. Dr. Dietrich Rauda and his son Patrick Rauda talked about the background of the Marshall Plan and the work of the War Claims Office. 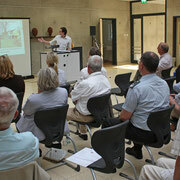 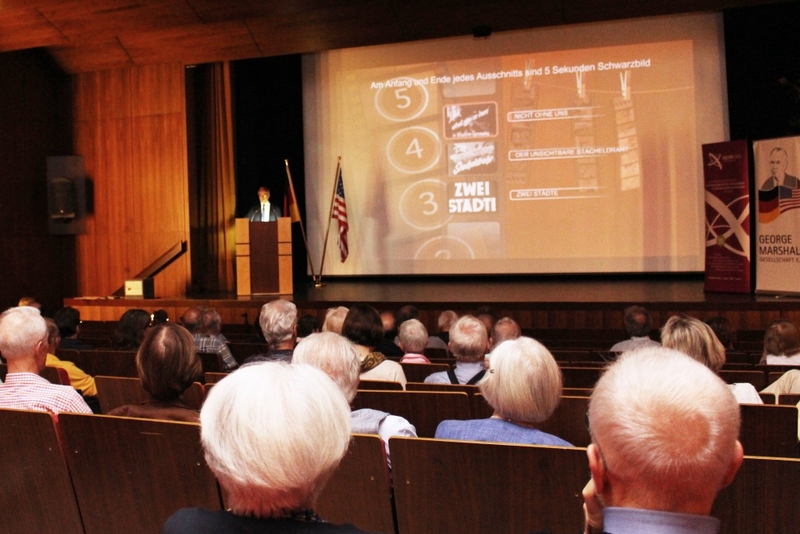 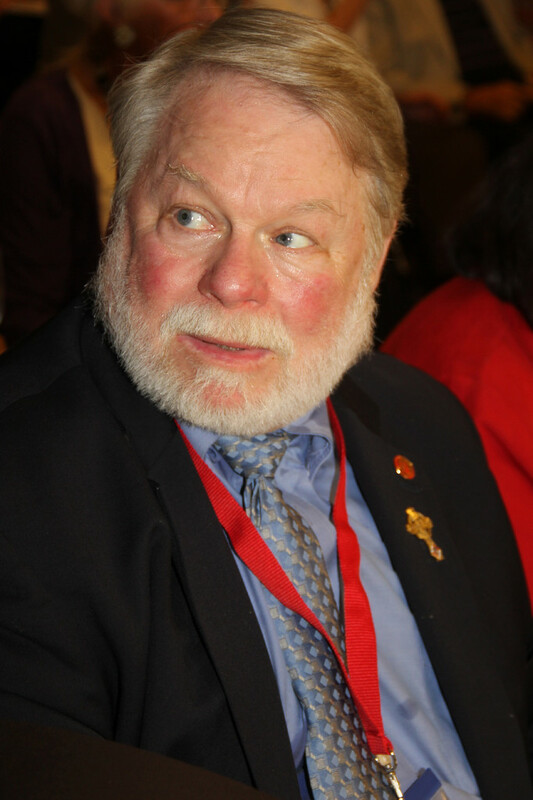 The double lecture was hosted by the George Marshall Society. 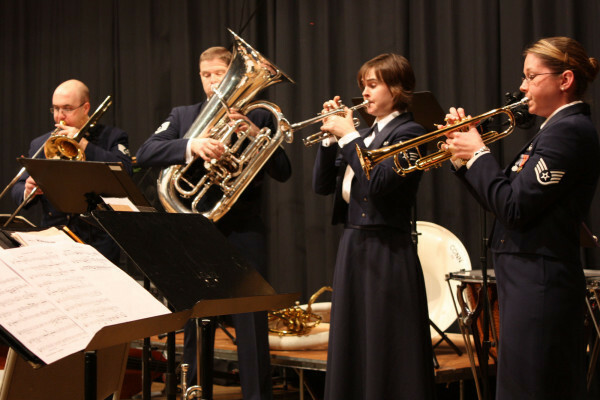 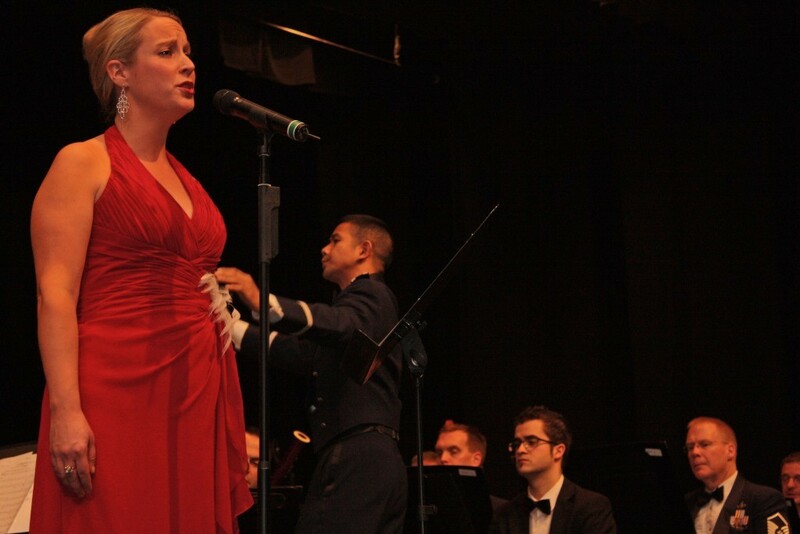 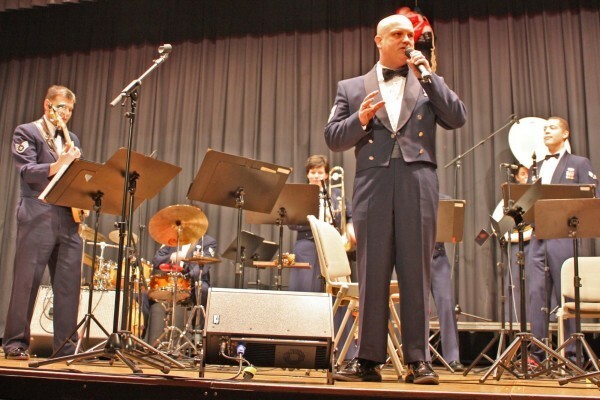 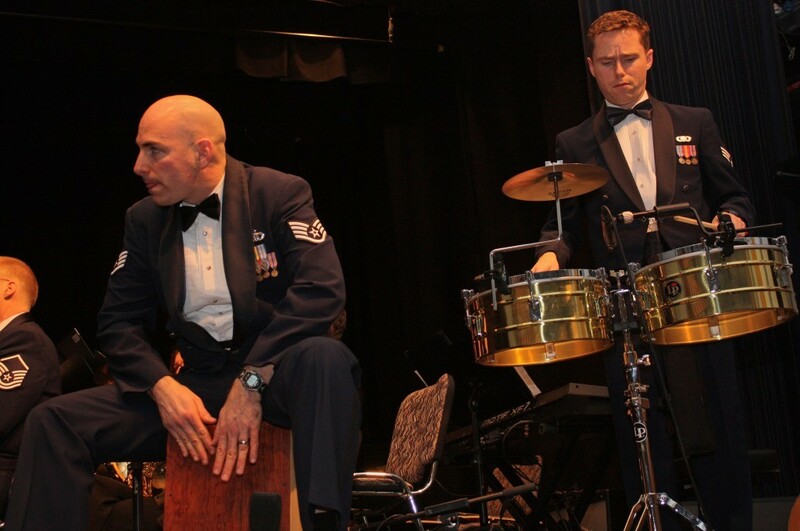 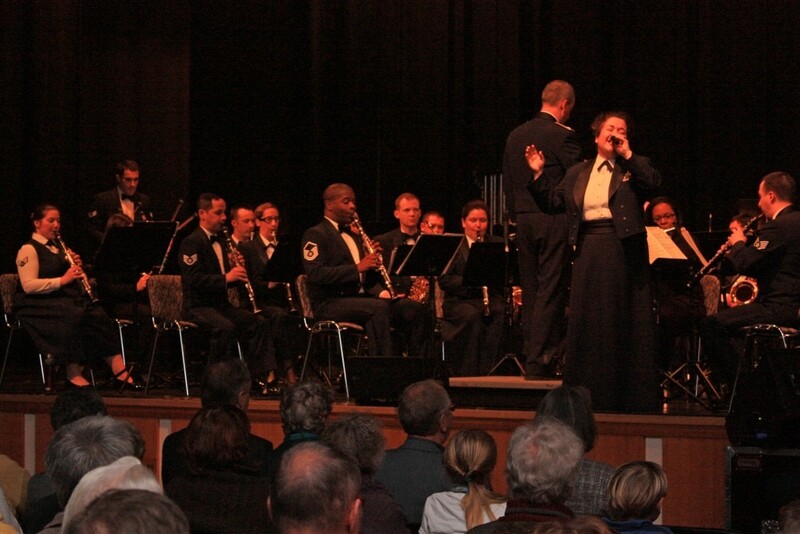 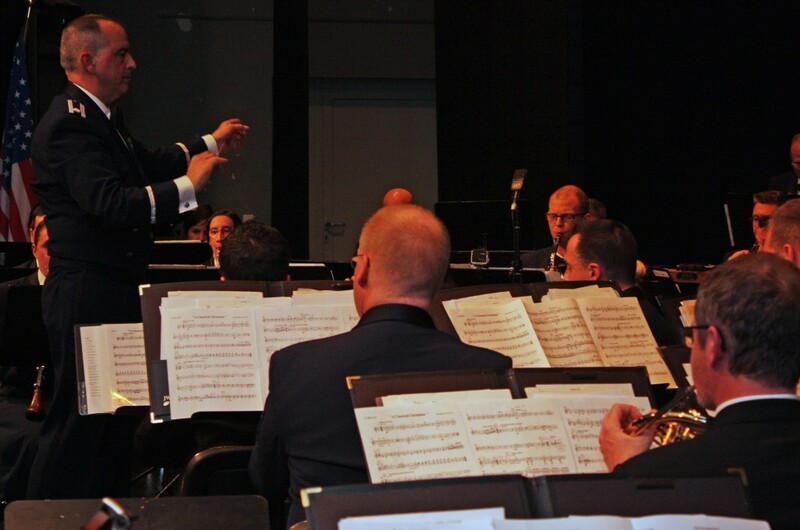 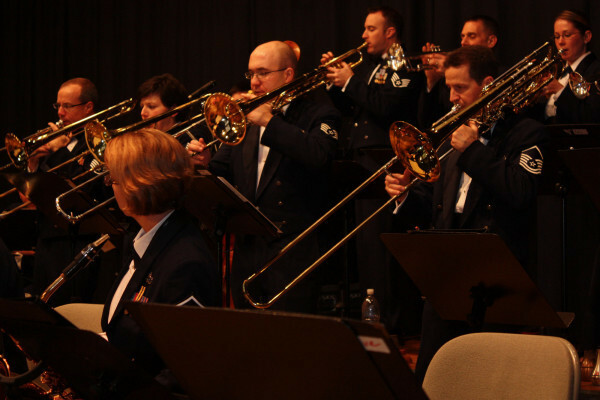 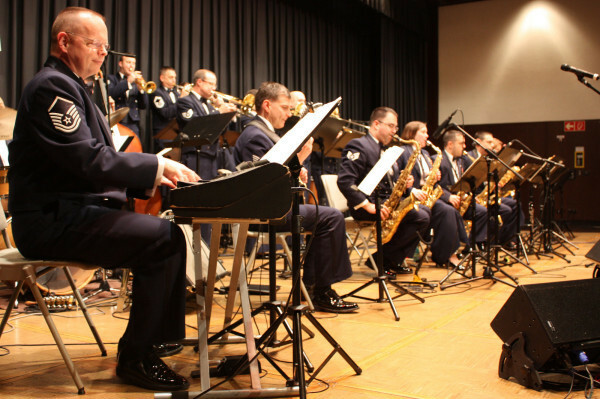 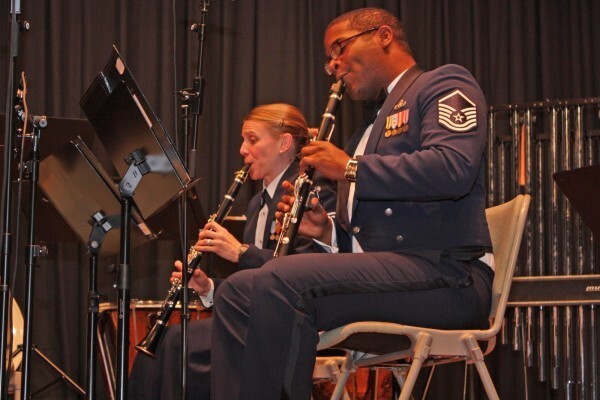 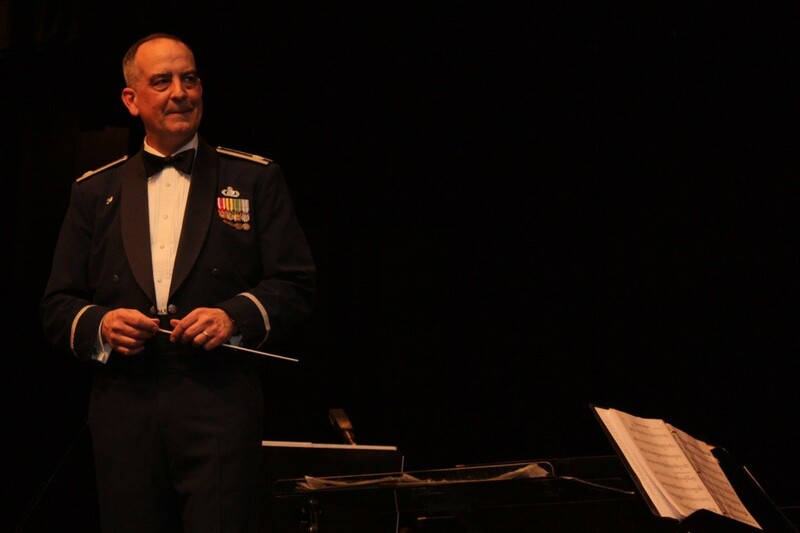 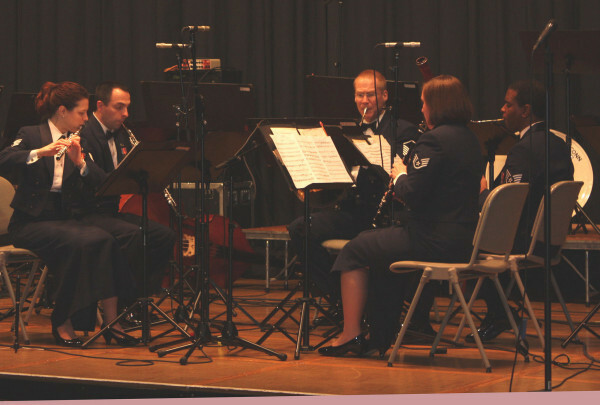 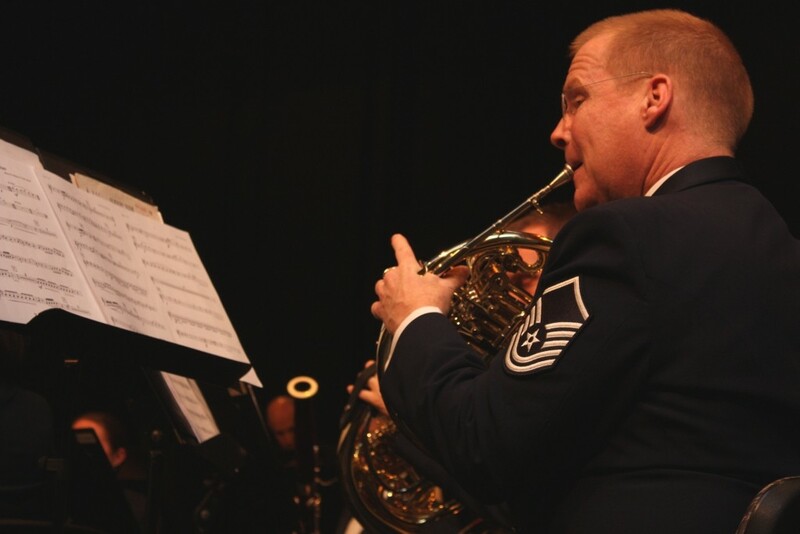 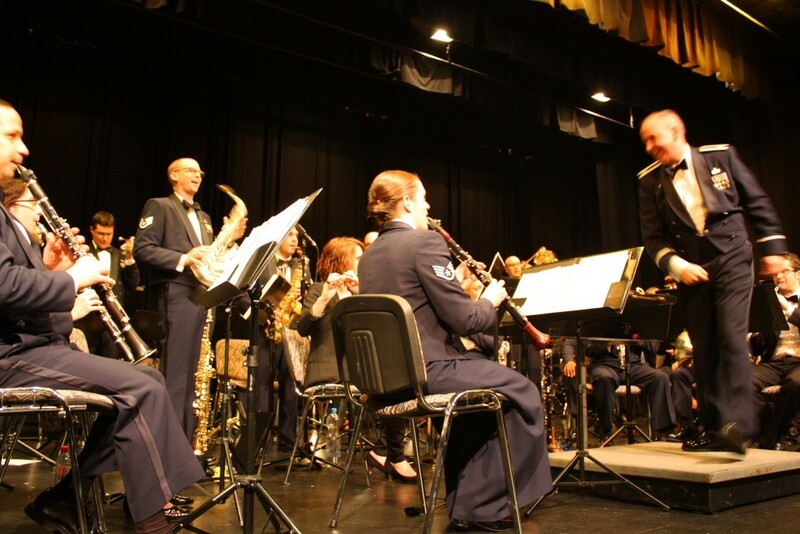 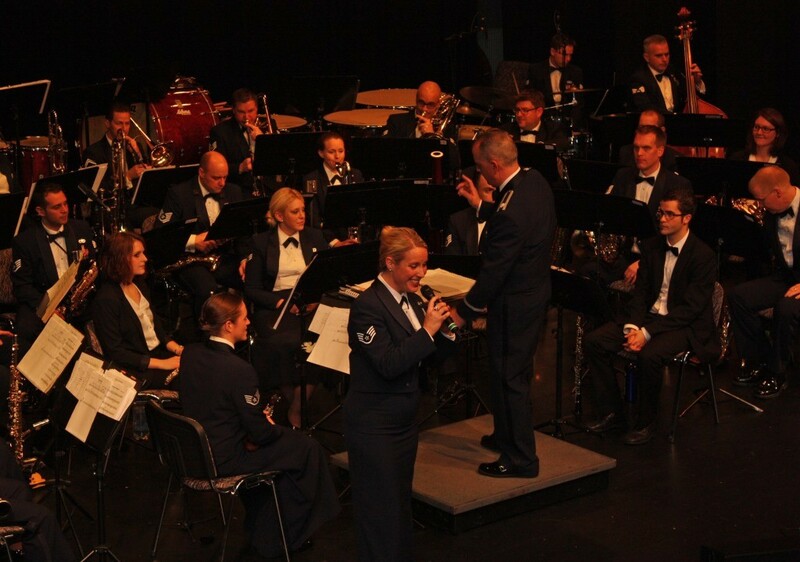 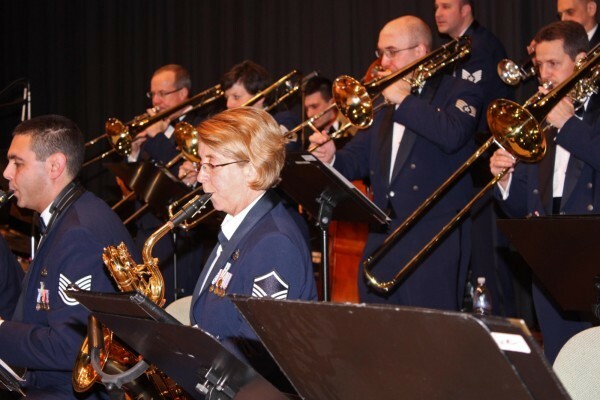 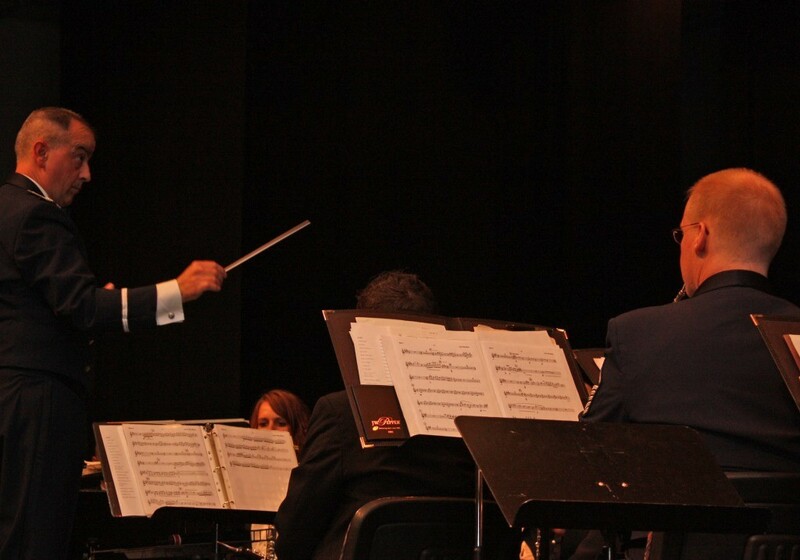 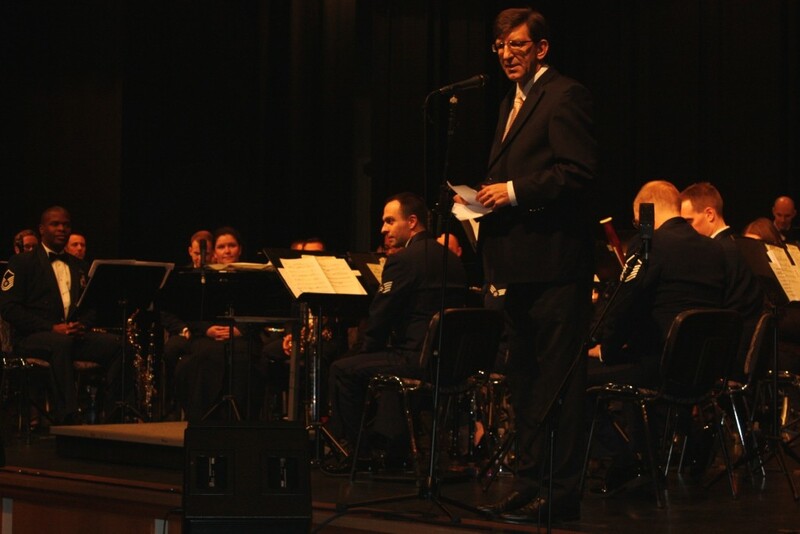 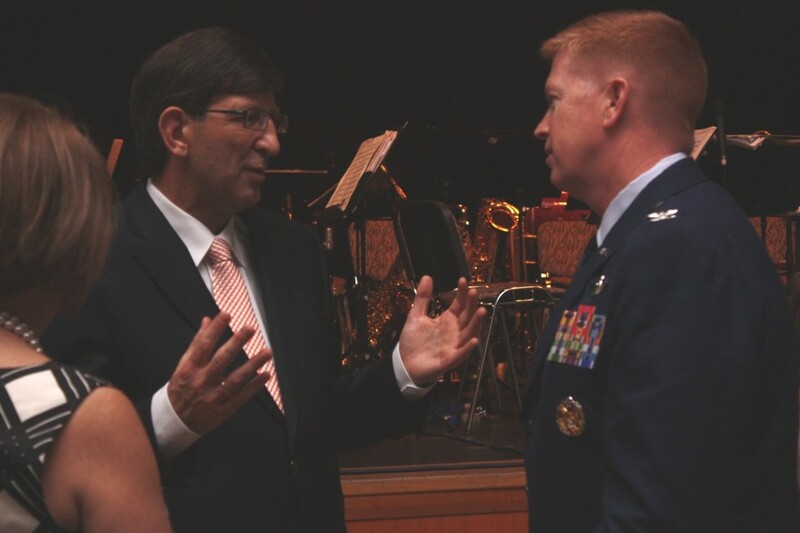 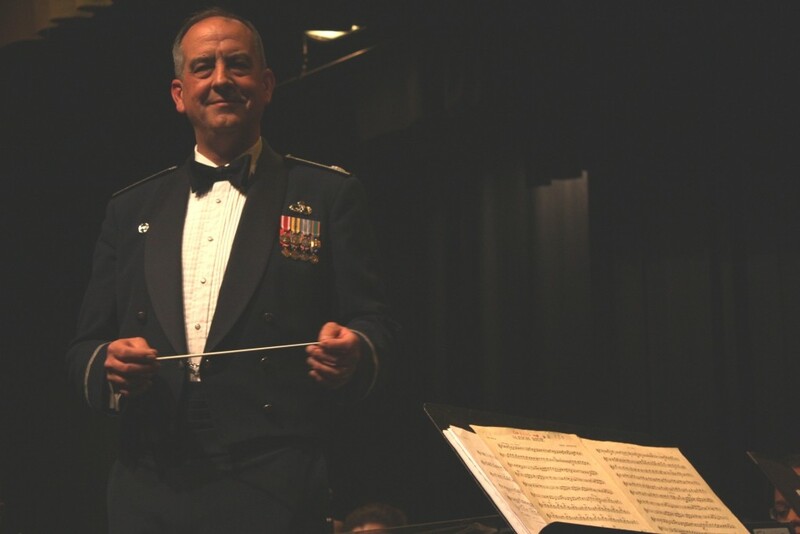 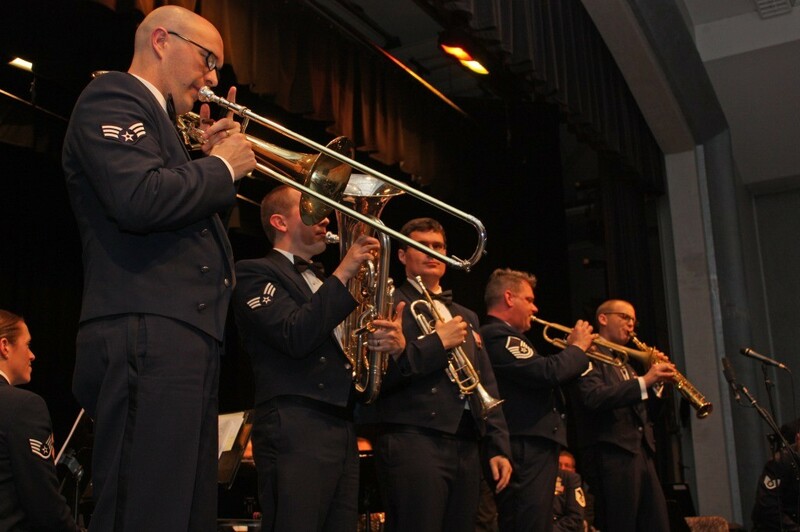 „Christmas Dreams in MTK“: By invitation of the George Marshall Society the Concert Band of the US Air Forces in Europe performed in the Kelkheim City Hall. 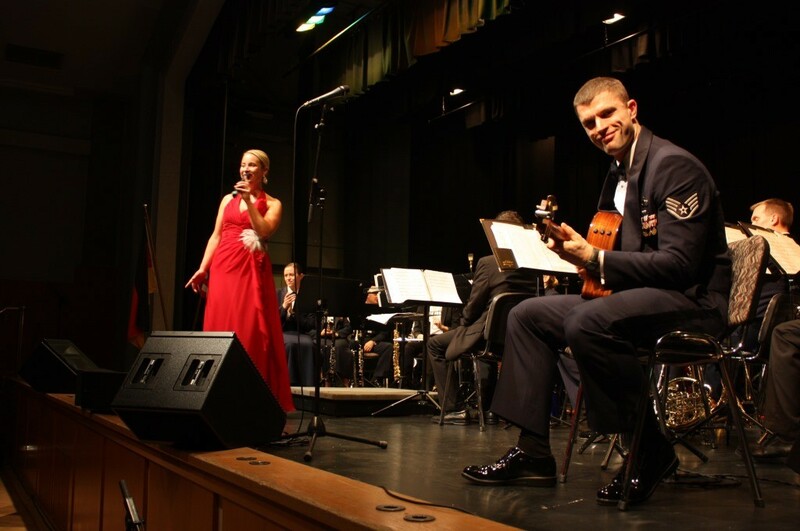 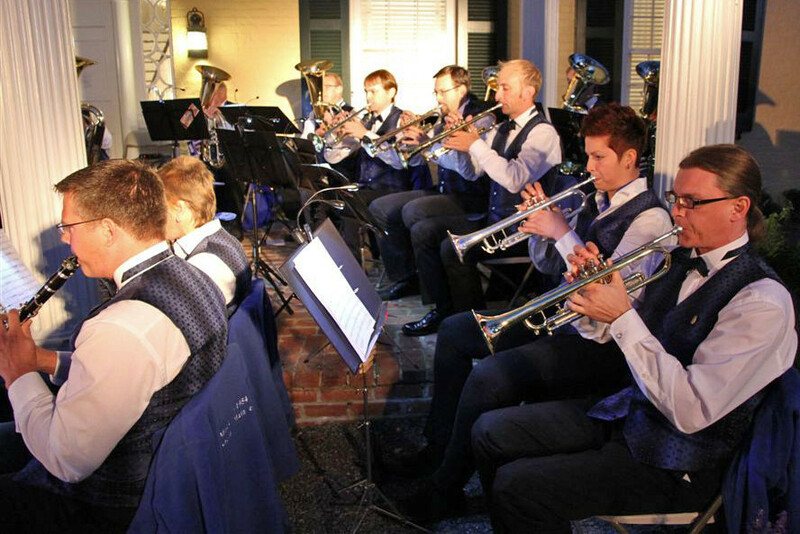 It was a true German-American event, and the musicians played to a capacity crowd. 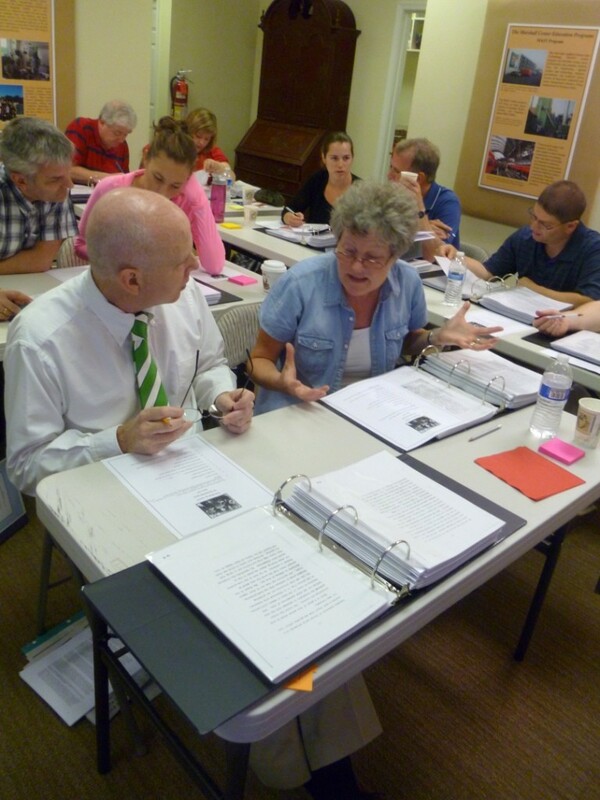 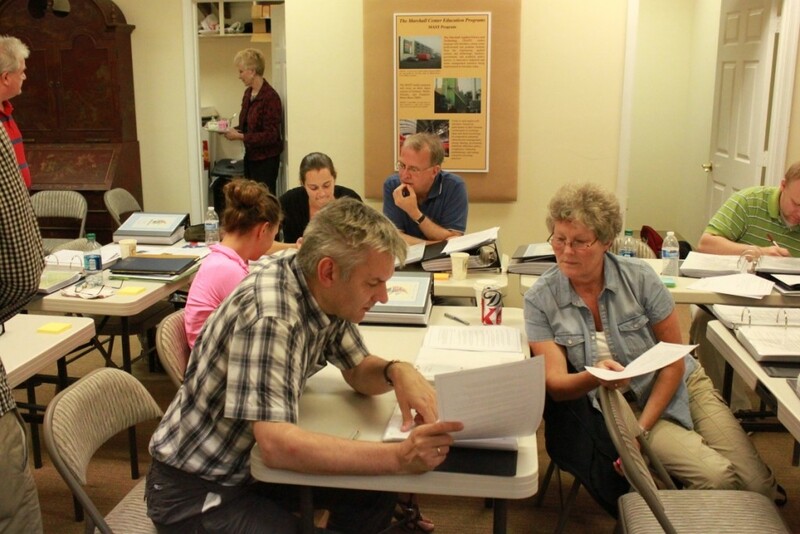 With support by the George Marshall Society, two teachers took part in a workshop in Virginia. 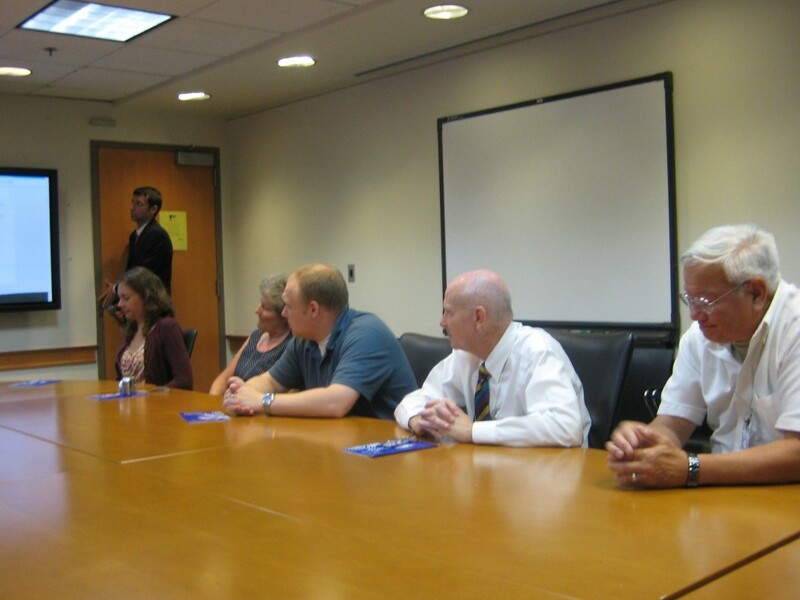 Part of the programme was a meeting with a former aide to Marshall and a visit to the US State Department. 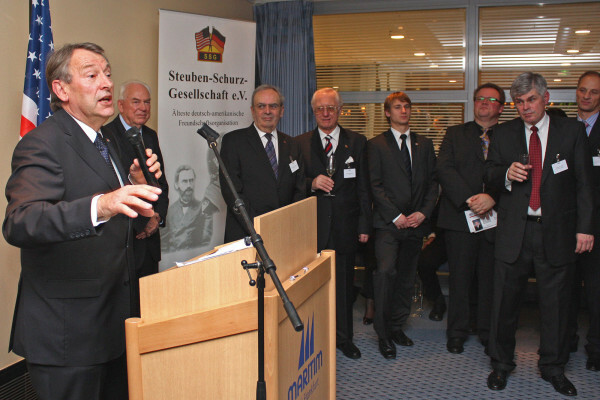 The Frankfurt Chamber of Commerce & Industry and the George Marshall Society give some remarks on the sculpture in downtown Frankfurt. 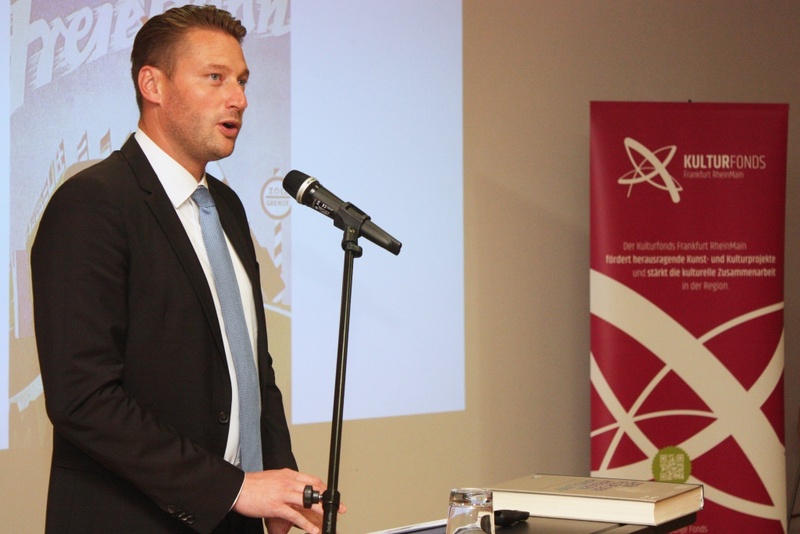 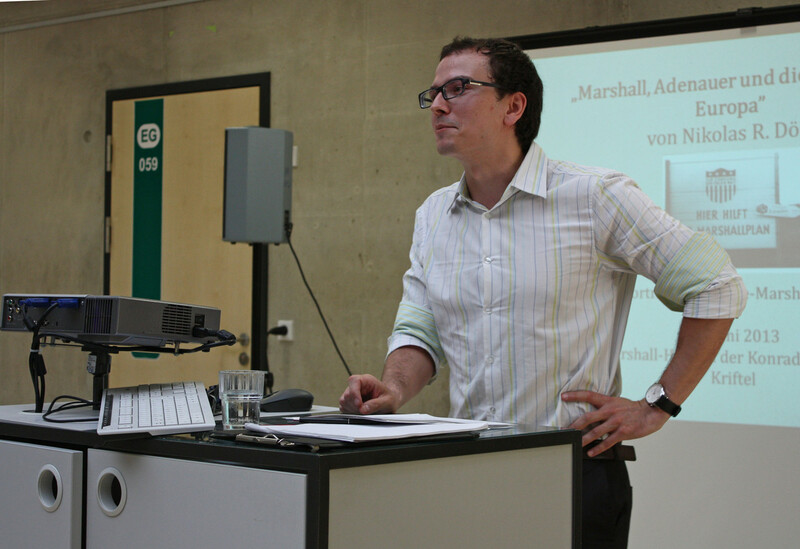 Marshall scholar Nikolas Dörr gave a lecture on the Cointainment Policy and the Marshall Plan in Europe. 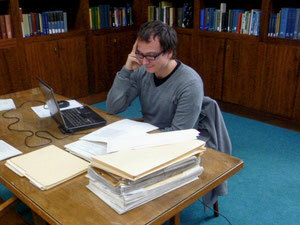 He has worked on studies at the sources in Virginia. 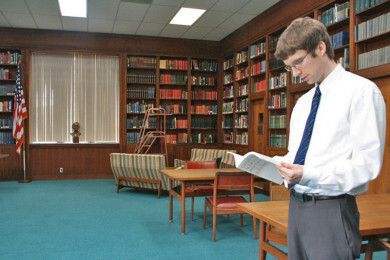 Nikolas Dörr studying in the Marshalll Library in Lexington, VA.
Marshalll scholar Nikolas Dörr talks about the Cointainment Policy in Europe. 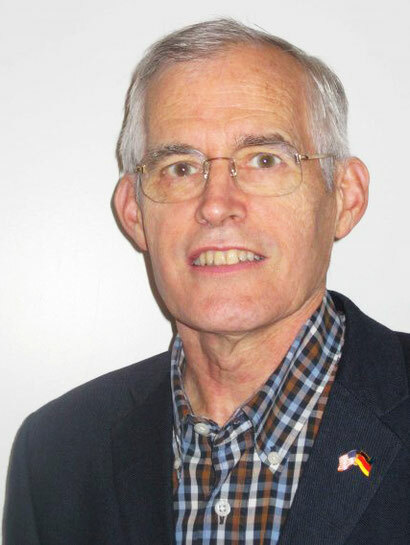 He has worked on studies at the sources in Virginia. 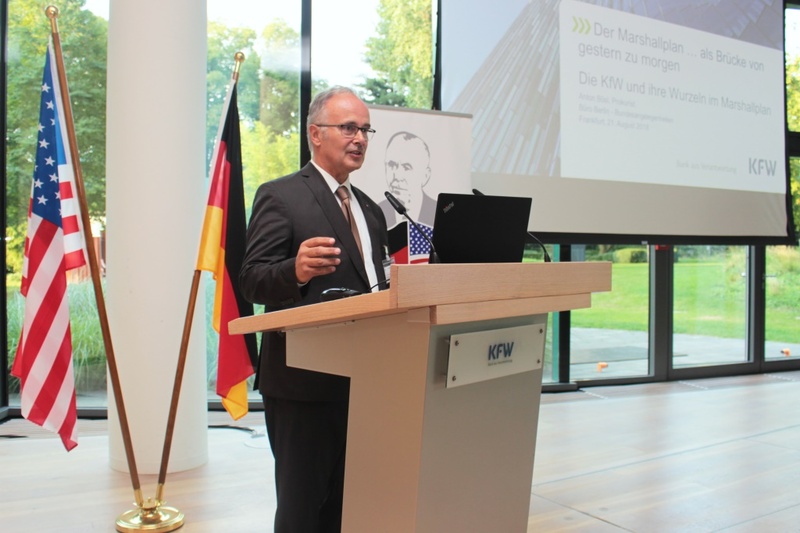 Kick-off of the event series „Marhsall Talks“: KfW’s Chief Economist Dr. Jörg Zeuner explained, how the Marshall Plan still functions through his bank’s credits. 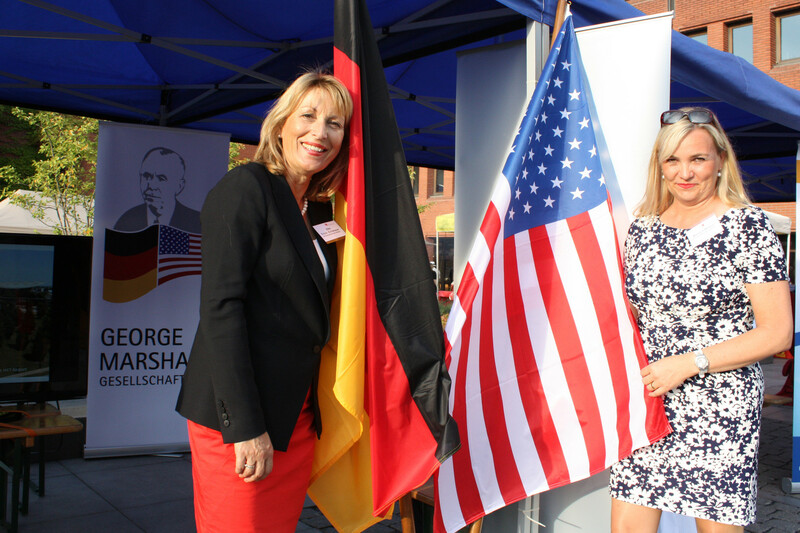 During his study visit, Nicholas Dörr was taken care of by experts Rachel Thompson (left) and Alisa Soderquist of the George C. Marshall International Center. 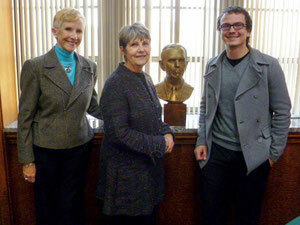 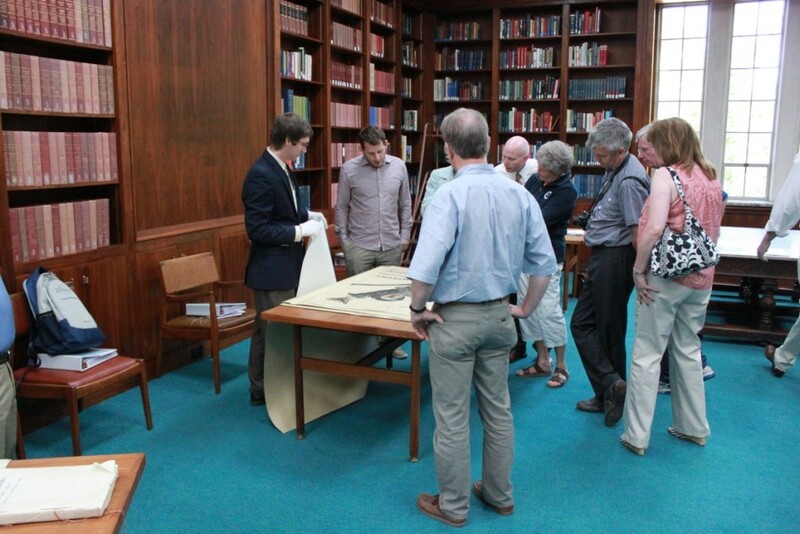 Nikolas Dörr, scholar of the George Marshall Society, has just returned from a study trip in the US. 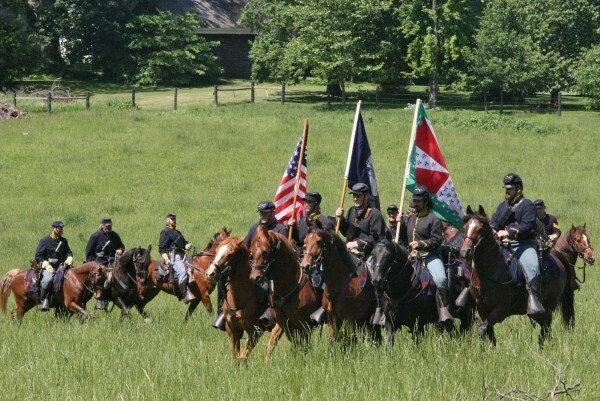 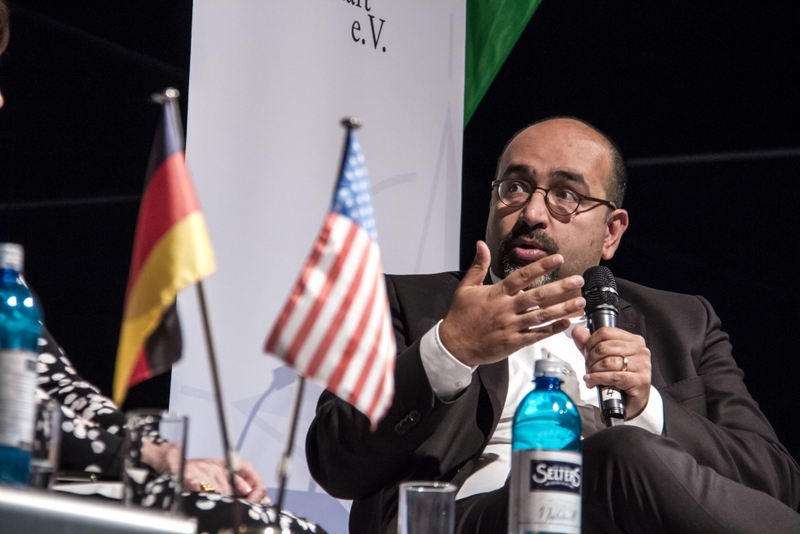 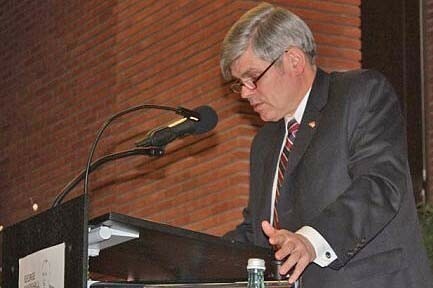 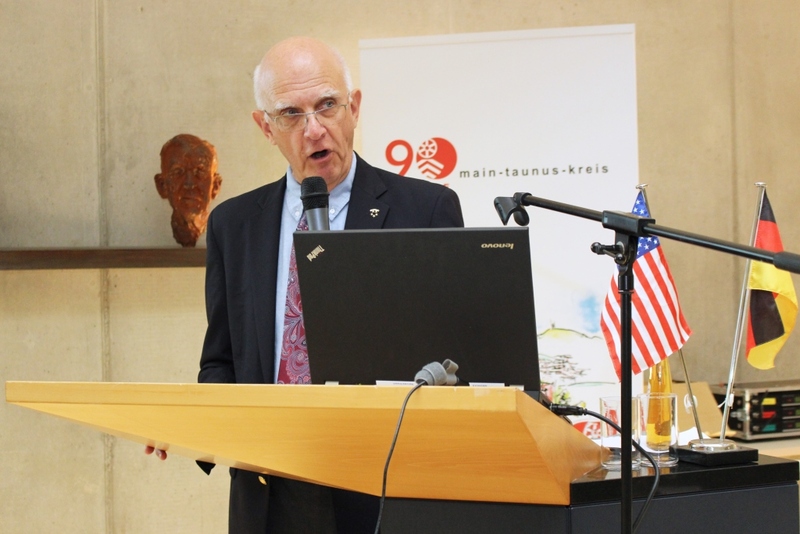 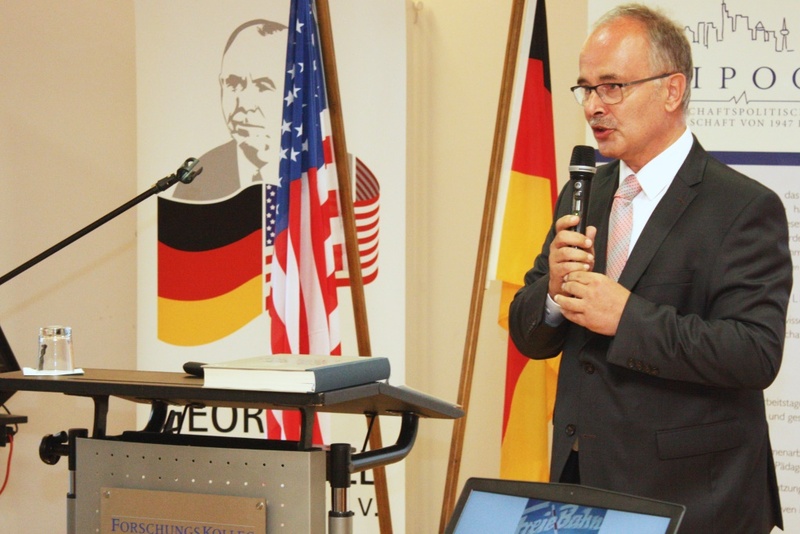 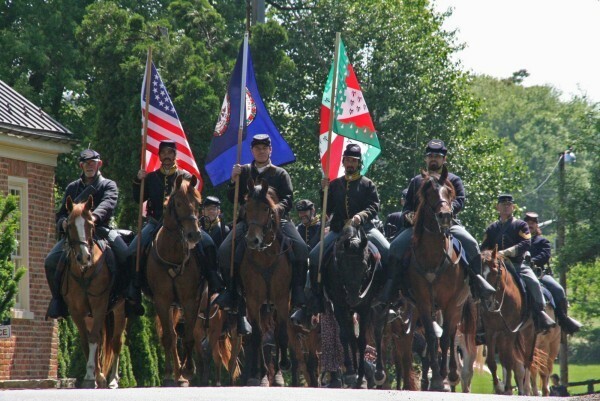 In 2013 the Society will support studies on Marshall and American-German relations. 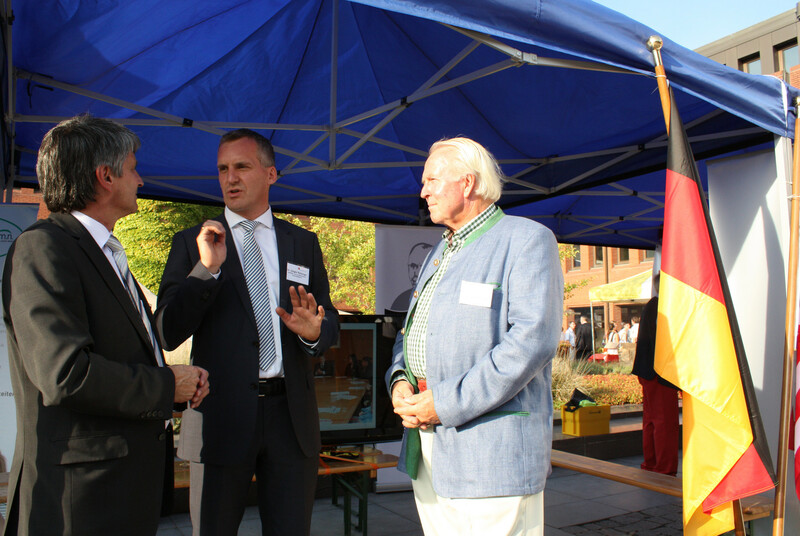 Virginia’s Secretary of Transport and representants of the Northern Virginia Regional Commission have been visiting the Frankfurt/Rhine Main region. 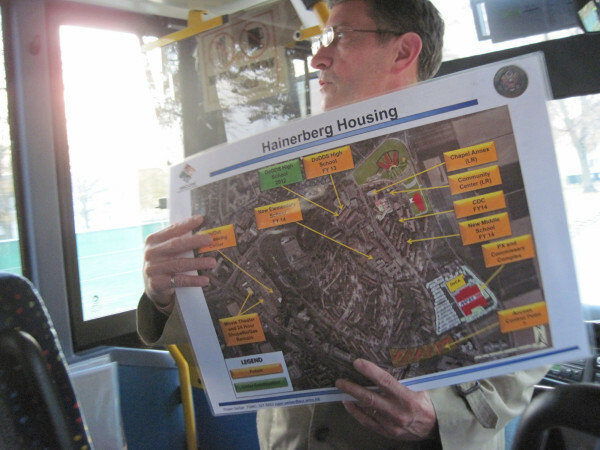 They collected information about regional planning, especially about zoning, public transport and environmental planning. 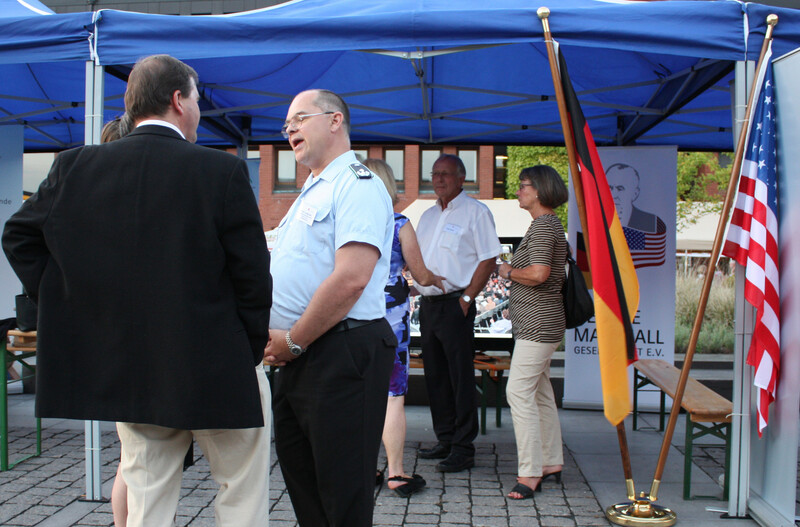 The visit was supported by the George Marshall Society and Main-Taunus Kreis. 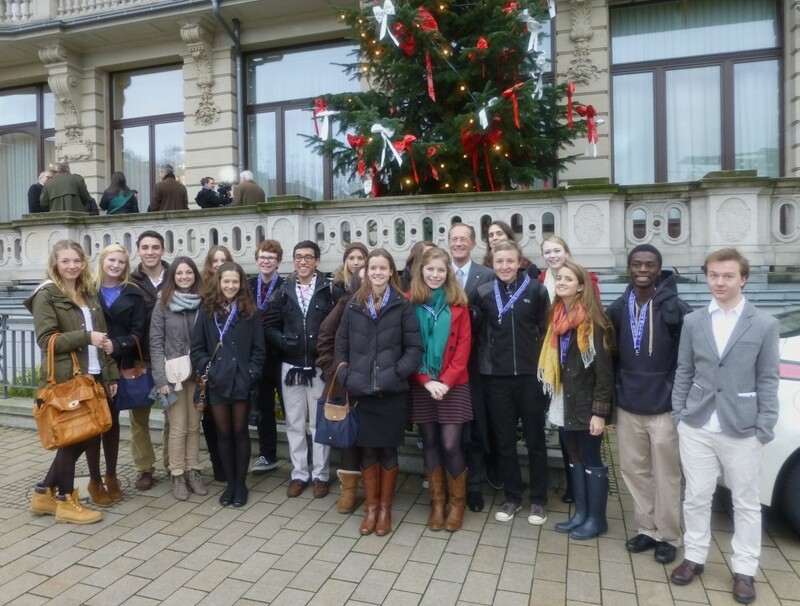 Supported by the Marshall Society, 14 Loudoun students had an insight into work and family life in MTK and the Frankfurt/Rhine-Main region. 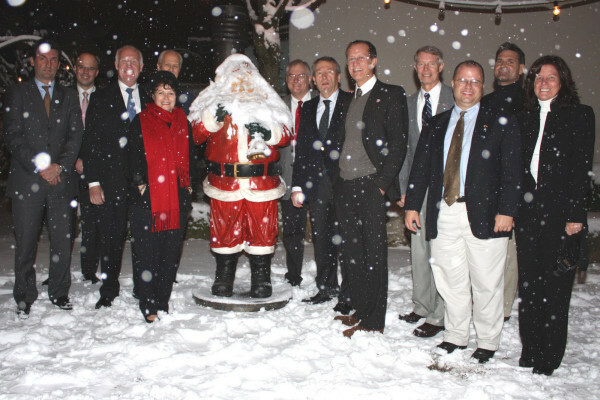 They stayed in host families, visited schools and did excursions to Xmas markets and the cities of Heidelberg and Frankfurt and others. 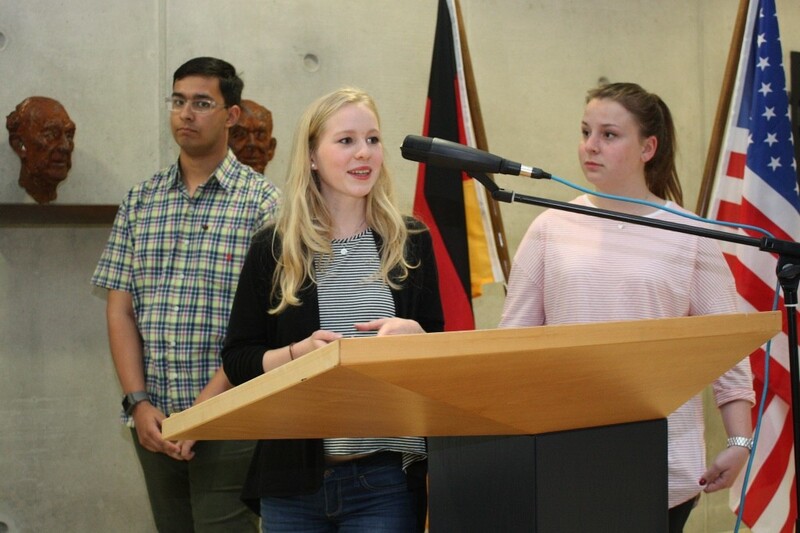 Furthermore, they visited the Hessian State Parliament at Wiesbaden, took a German language crash course and had the chance to career explorations on job sites with public services and private businesses. 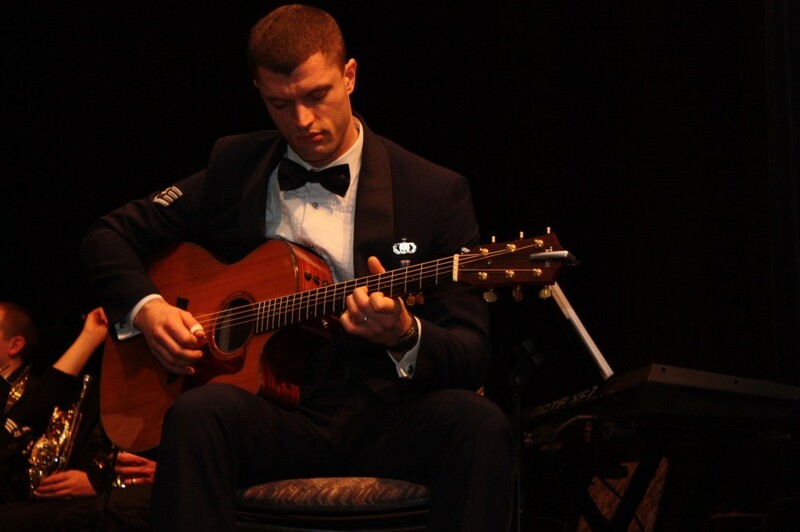 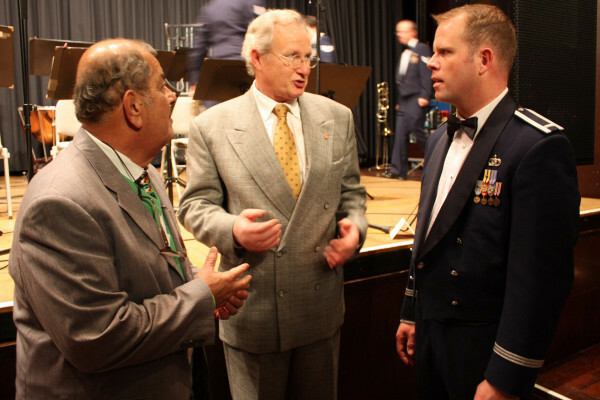 The program was managed in cooperation with the George C. Marshall Int’l Center at Leesburg, VA. 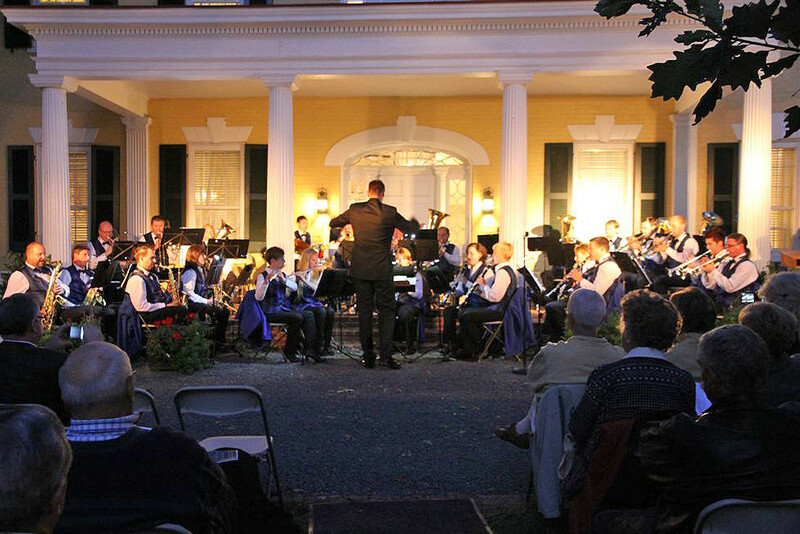 The Musikverein Flörsheim, an orchestra from Main-Taunus Kreis, has visited the East Coast and also performed in Loudoun County. 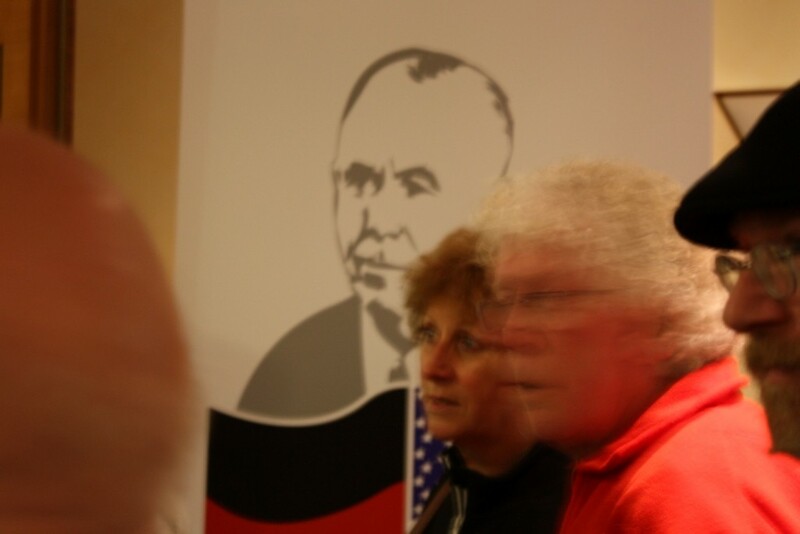 The trip has been supported by the George Marshall Society. 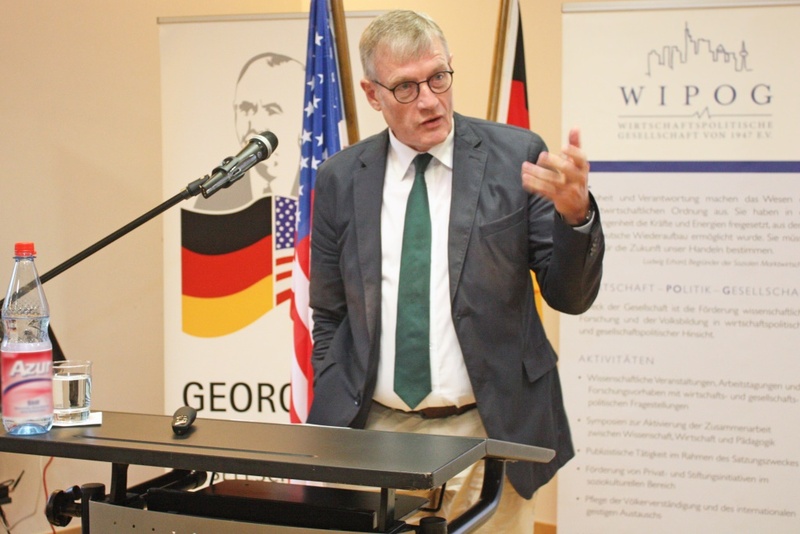 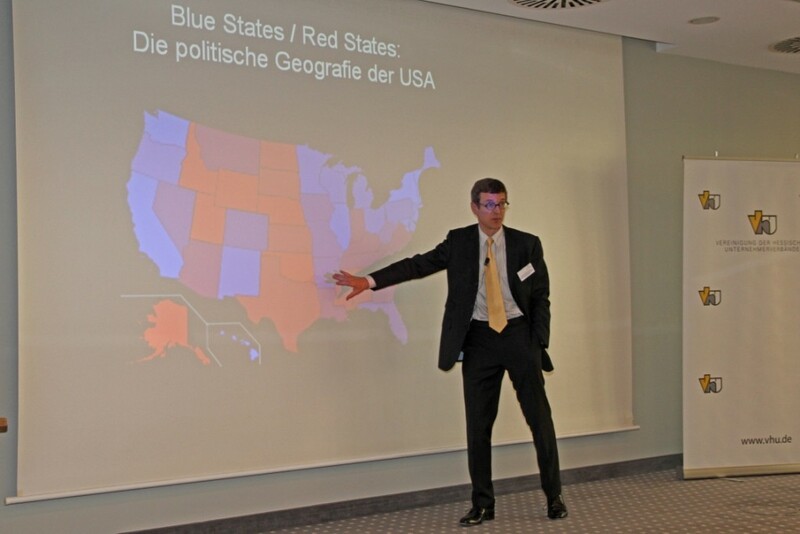 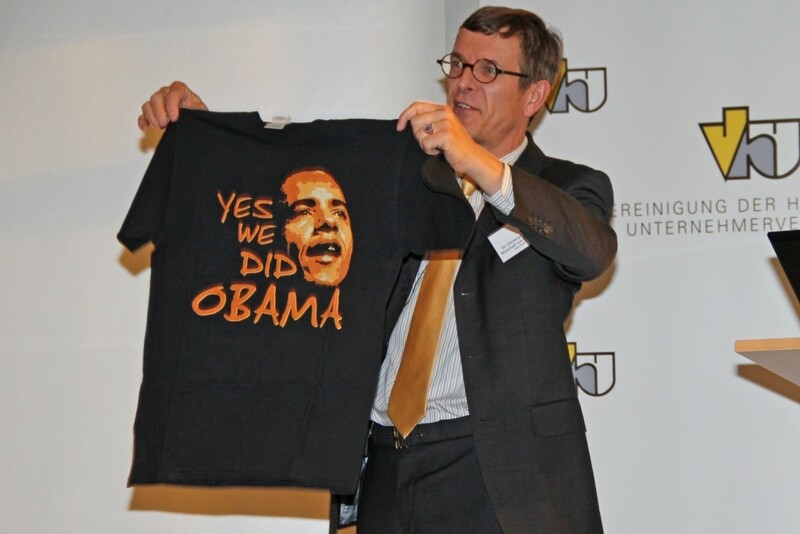 German journalist Dr. Christoph Freiherr Marschall von Bieberstein gave a lecture on the US presidential campaign recently in Wiesbaden. 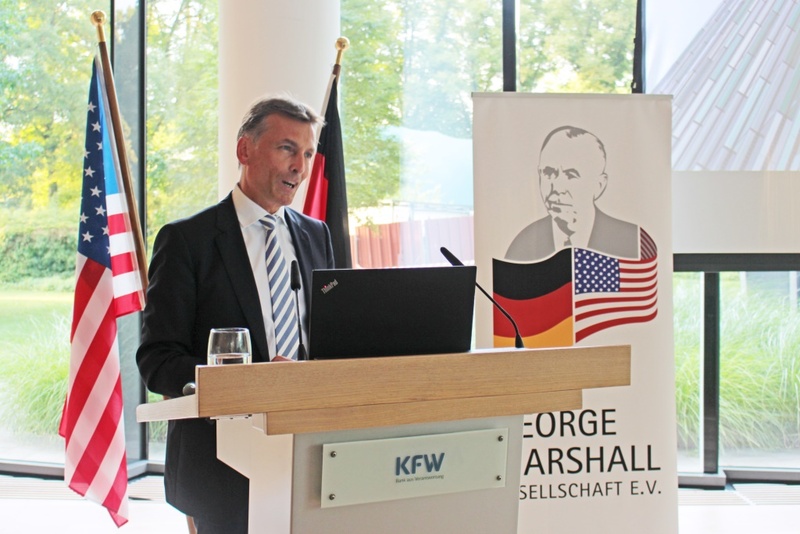 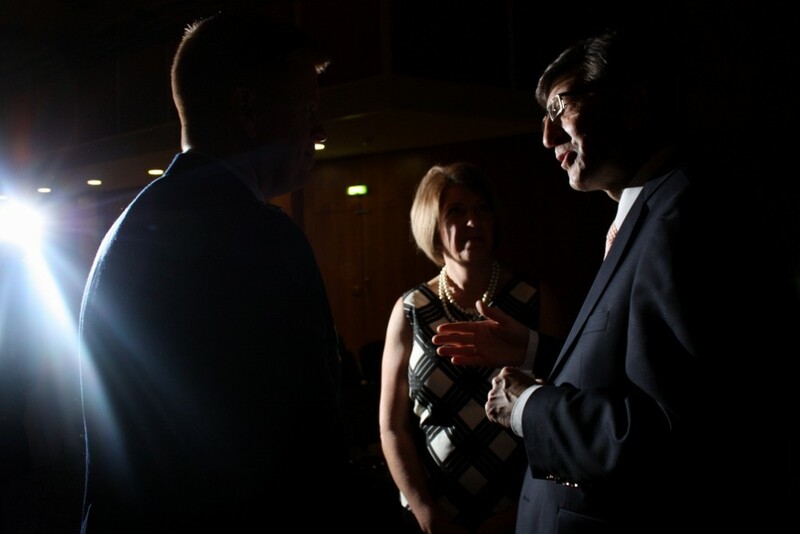 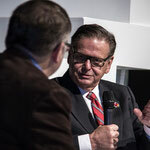 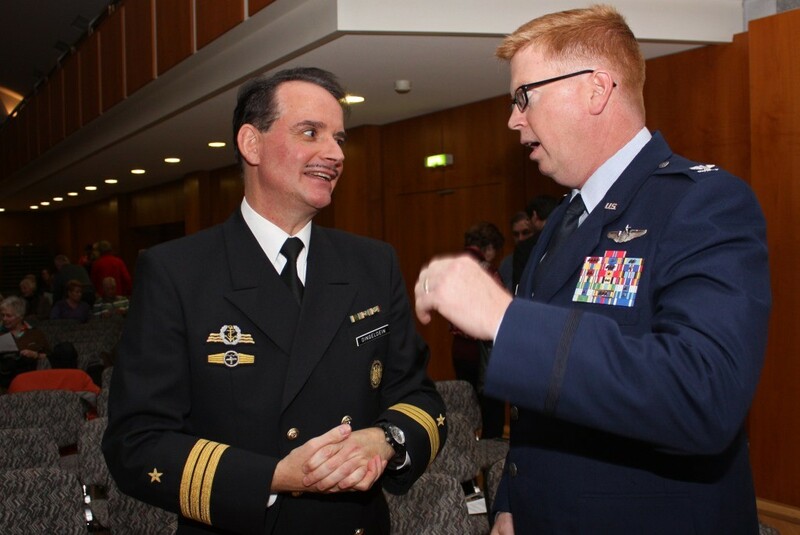 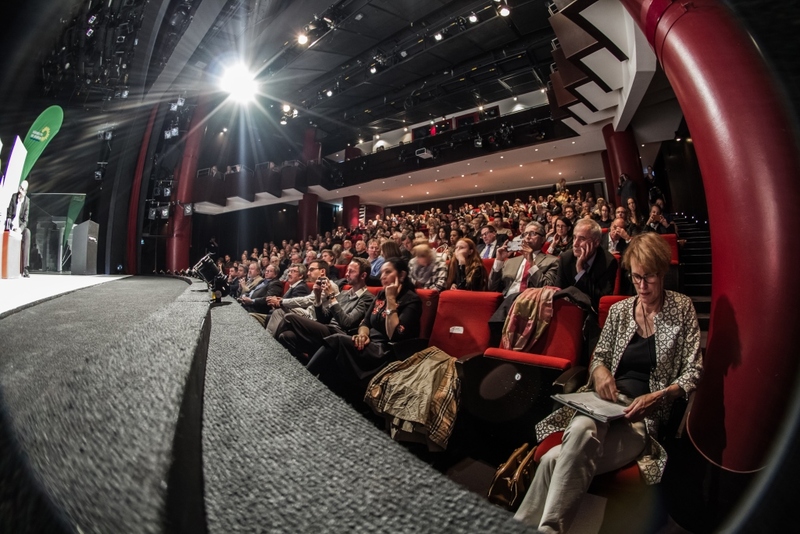 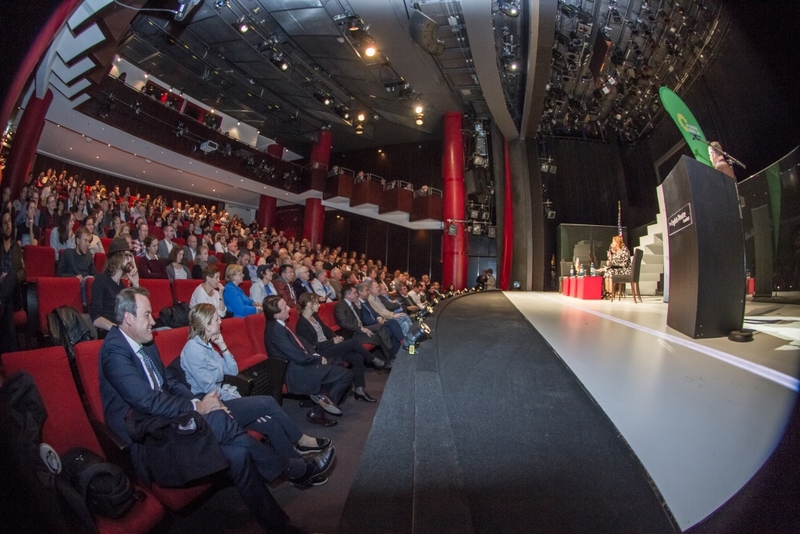 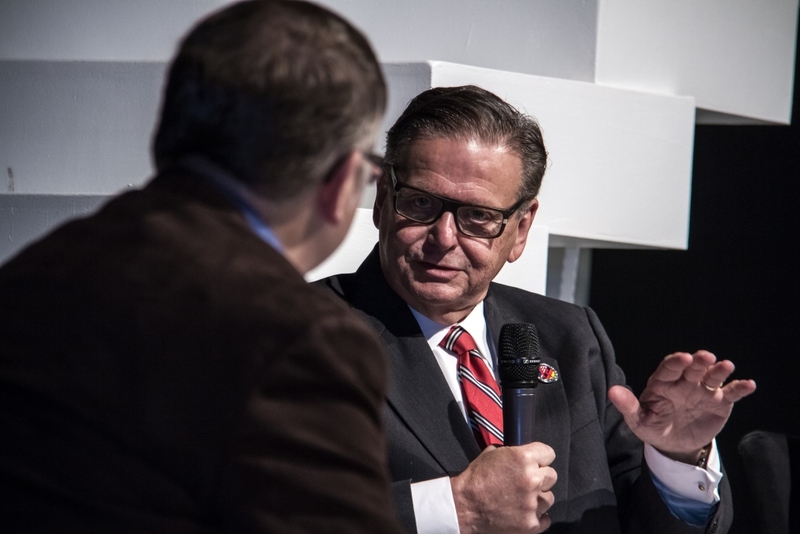 The event was organized by the Association of employers' associations in the State Hesse and supported by the George Marshall Society and other partners. 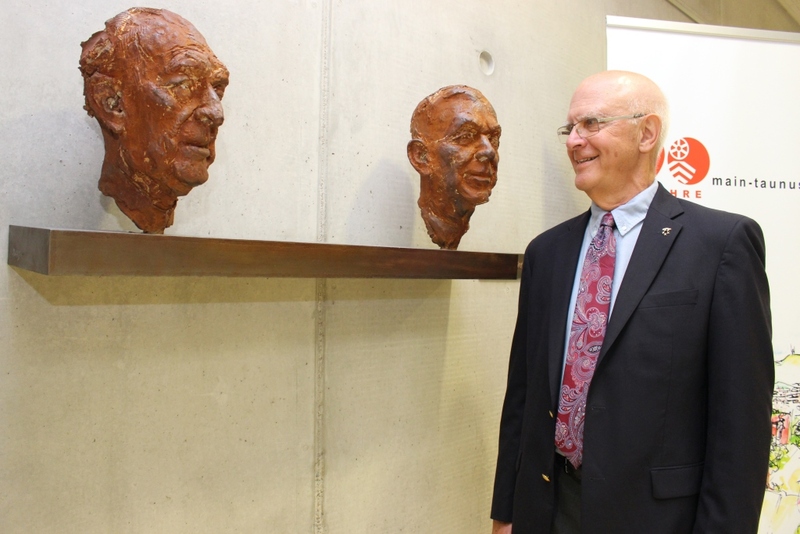 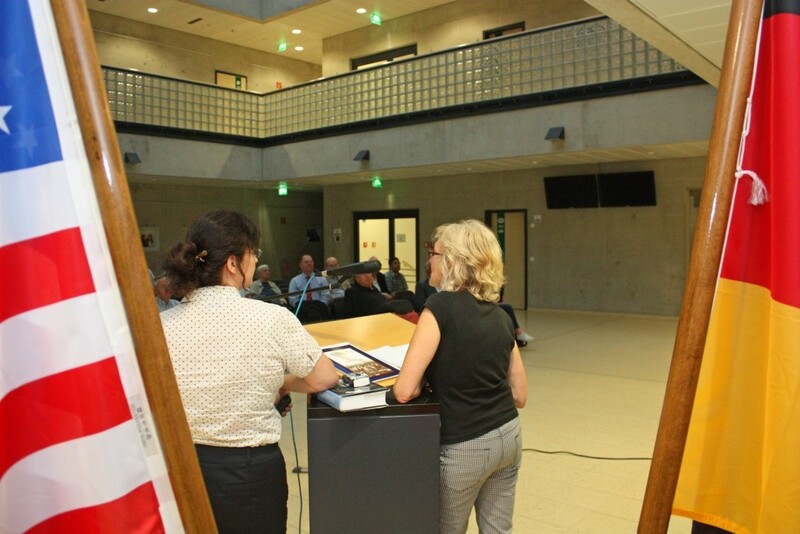 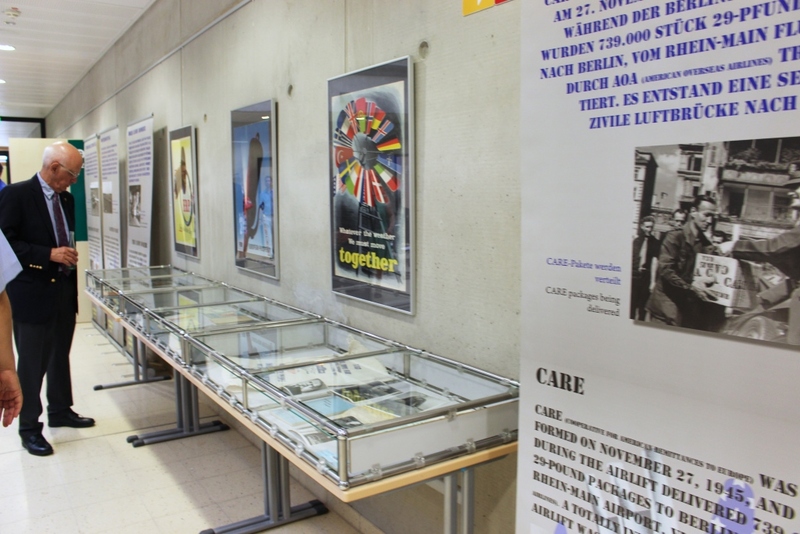 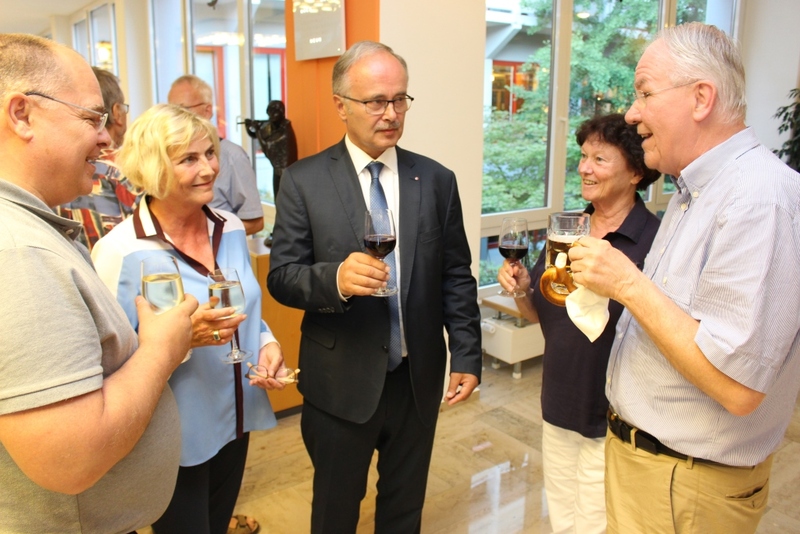 The German Marshall Society, the cultural community “Wallauer Fachwerk” on the one hand and the Franklin Park Arts Center from Loudoun on the other presented artworks from Loudoun County in the Main-Taunus county district administrative center in Hofheim. 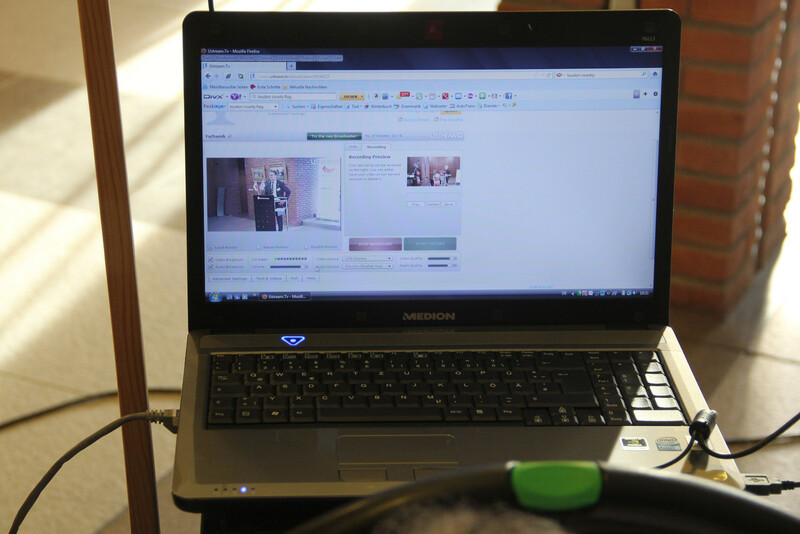 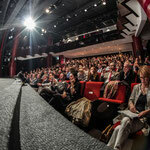 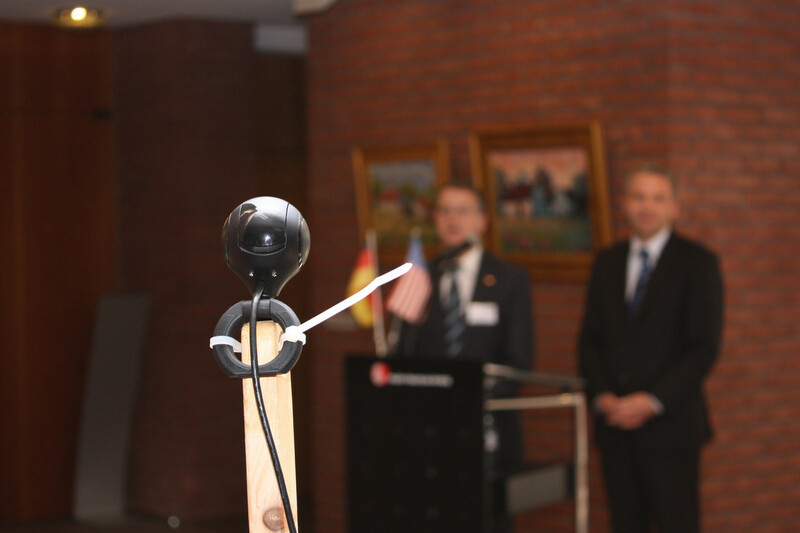 The vernissage was broadcasted live via internet. 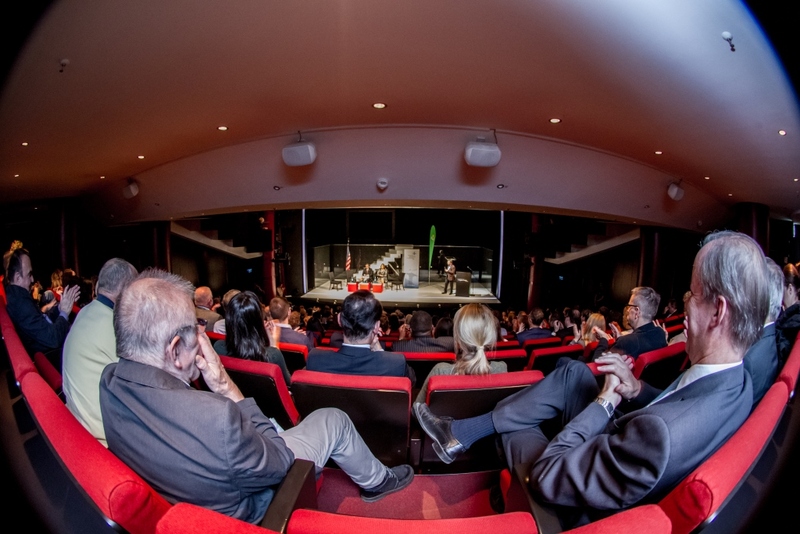 At the same time, the Franklin Arts Park Centre was broadcasting their “public viewing” to Hofheim, so both sides could meet via videoconferencing. 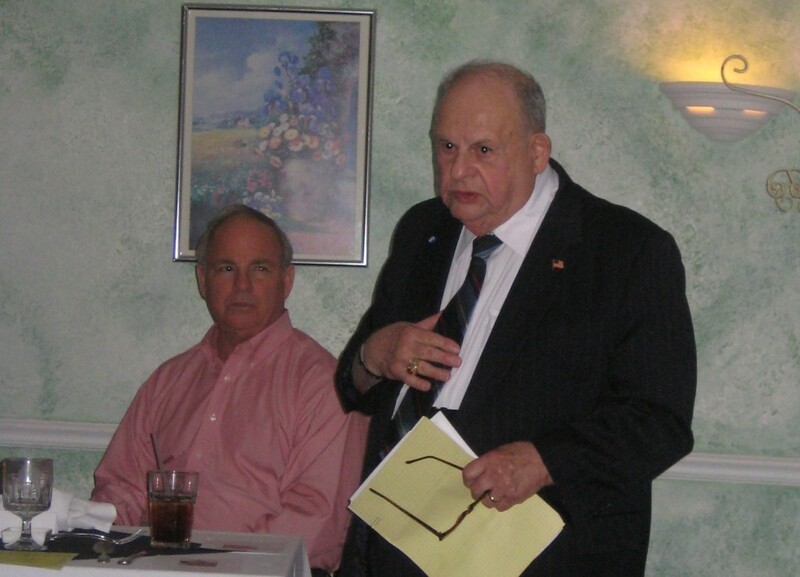 County Chairman Michael Cyriax stated that this was “the first parallel transatlantic sister county party” of Loudoun and MTK. 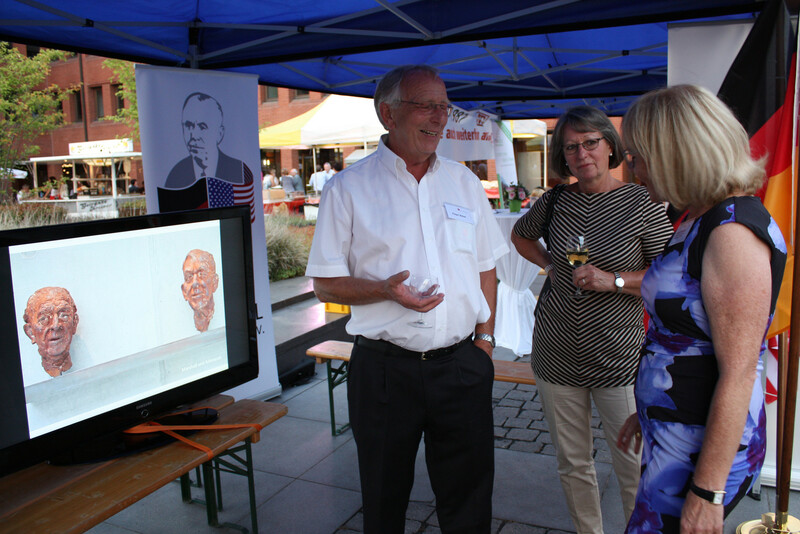 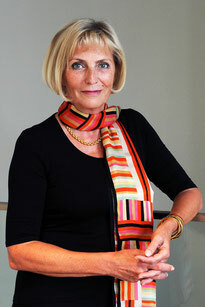 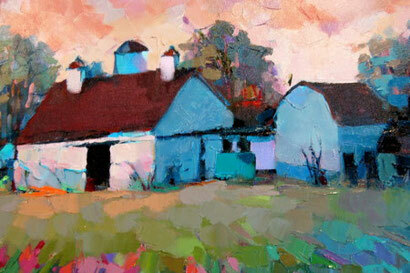 Priscilla Godfrey represented the artists of Loudoun County on the vernissage in Hofheim. 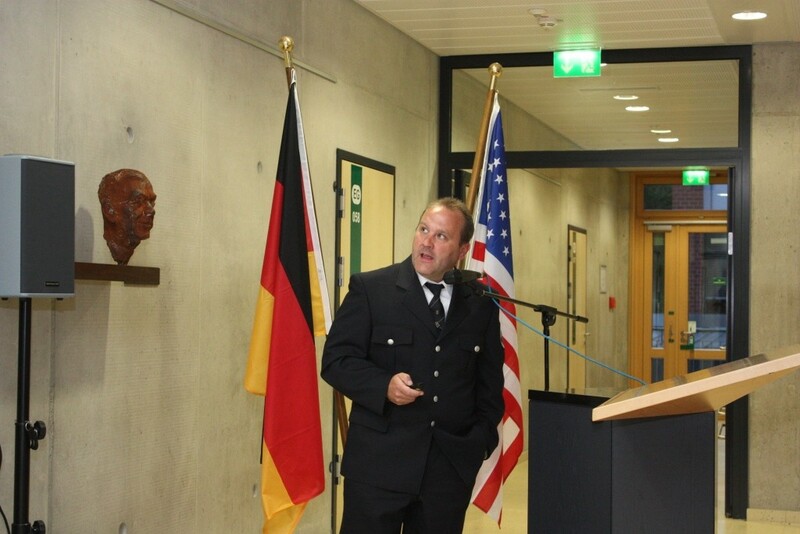 Special guest at the opening was Consul Jeffrey Hill from the US Consulate in Frankfurt. 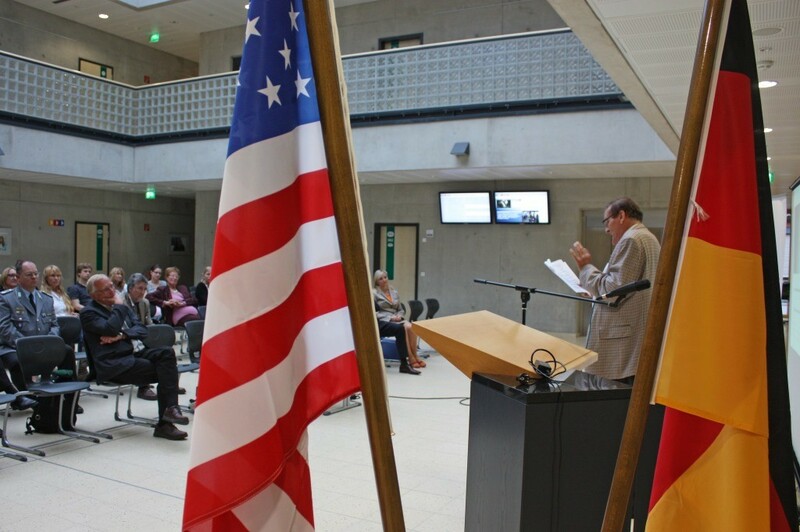 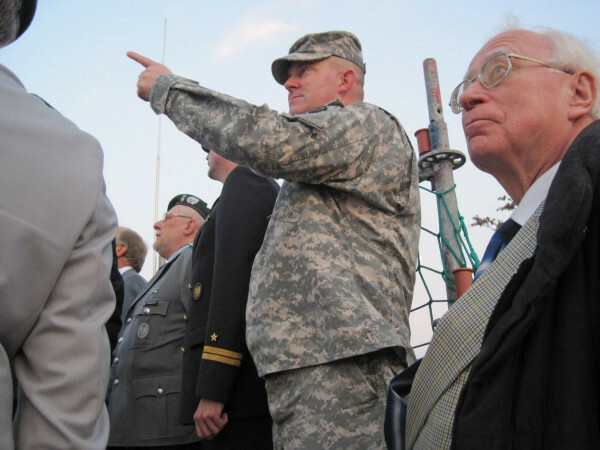 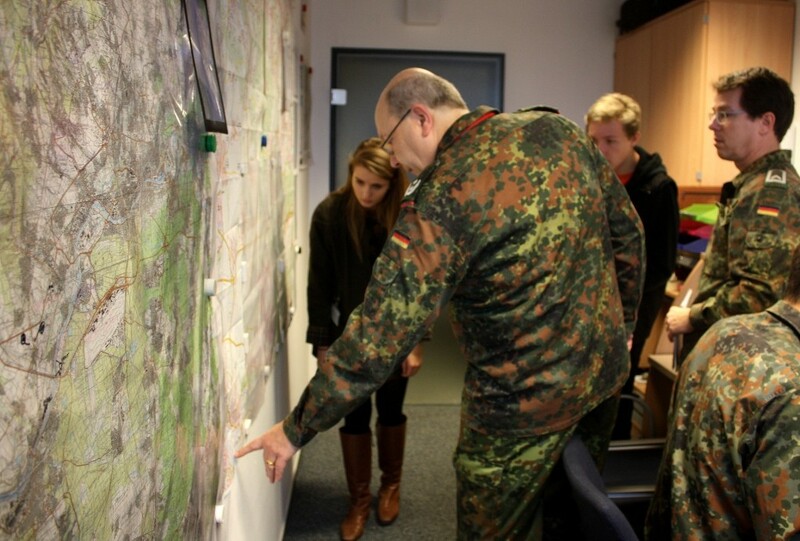 Members of the George Marshall Society and representants of the German Bundeswehr had a look in the future of the US Army in the area around Wiesbaden. 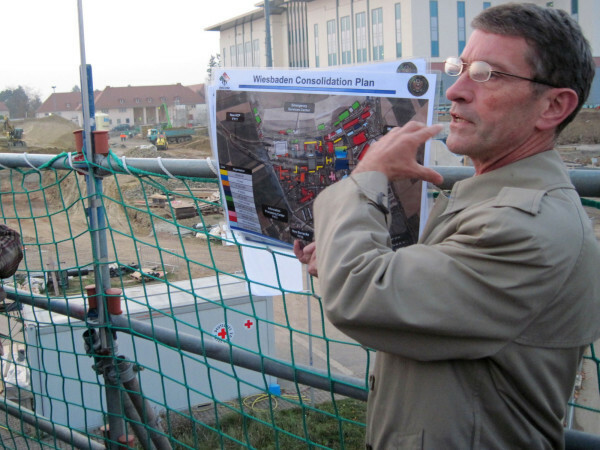 There the US Forces are building up their HQ of all American ground troops in Europe. 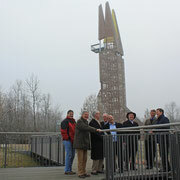 Colonel Jeff Dill and Director Roger Gerber took the members on a trip across the widespread area. 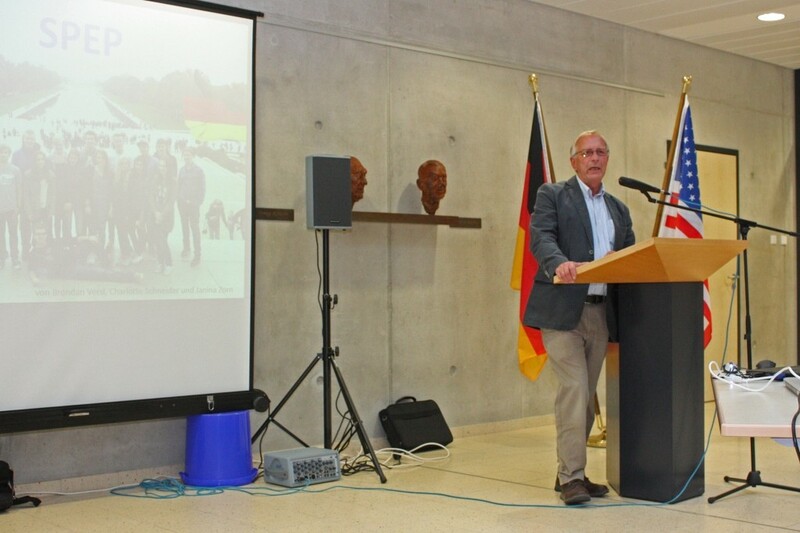 Oberstleutnant Wolf-Teja von Rabenau of the Bundeswehr gave a short presentation of plans for the Bundeswehr structure which recently has been reformed. 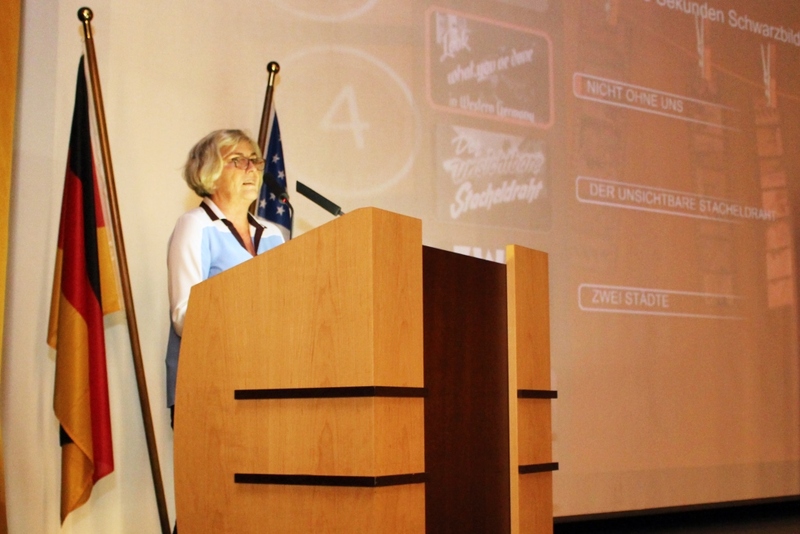 "The Atlantic does not divide - it brings people together"
16 students from MTK have recently visited Loudoun County under the shield of this year's SPEP program. 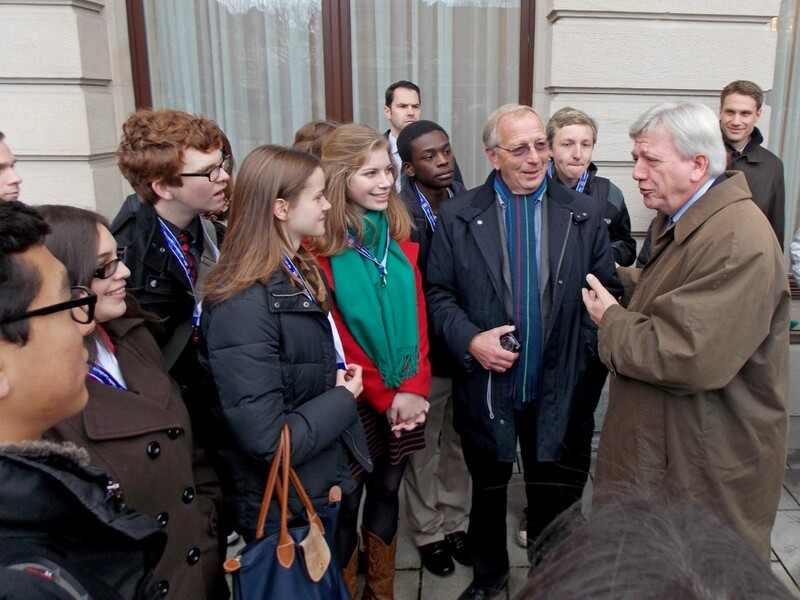 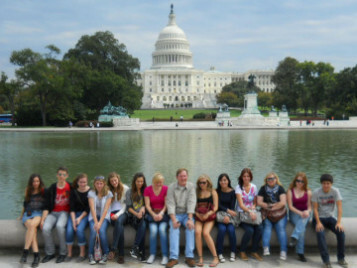 The young people stayed in host families, visited schools, and had to do workshadowing in various companies and institutions to get a first-hand impression of daily life in the US. 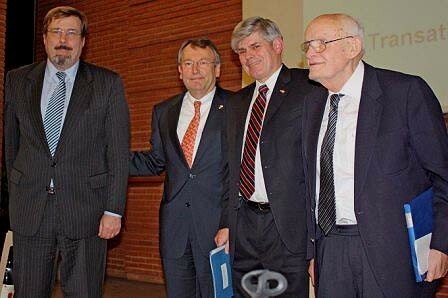 Furthermore they developed lots of personal friendships. 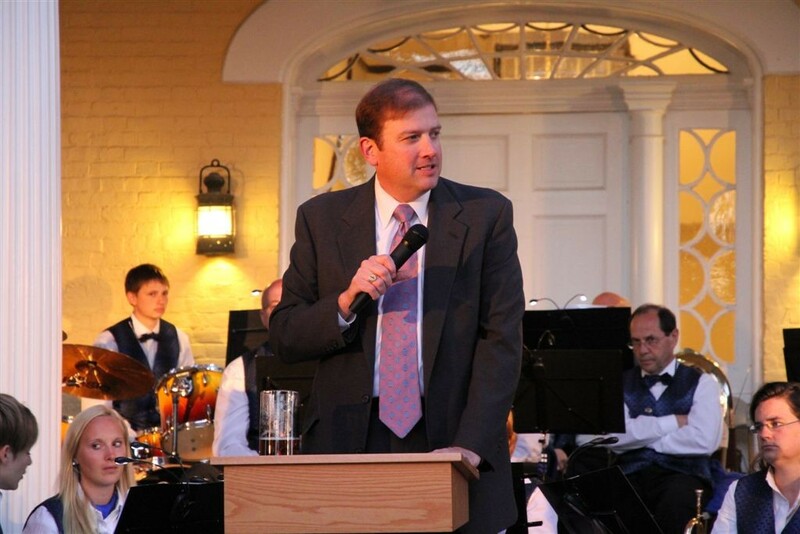 As the newly elected County Executive of MTK, Michael Cyriax, puts it: "The Atlantic does not divide - it brings people together". 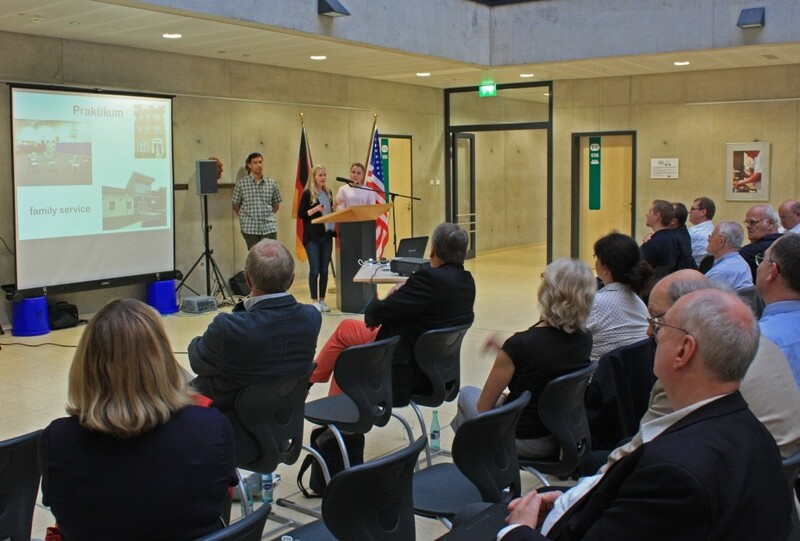 In November, Loudoun students will make their way to MTK to make, thanks to SPEP, the same experiences on the German side. 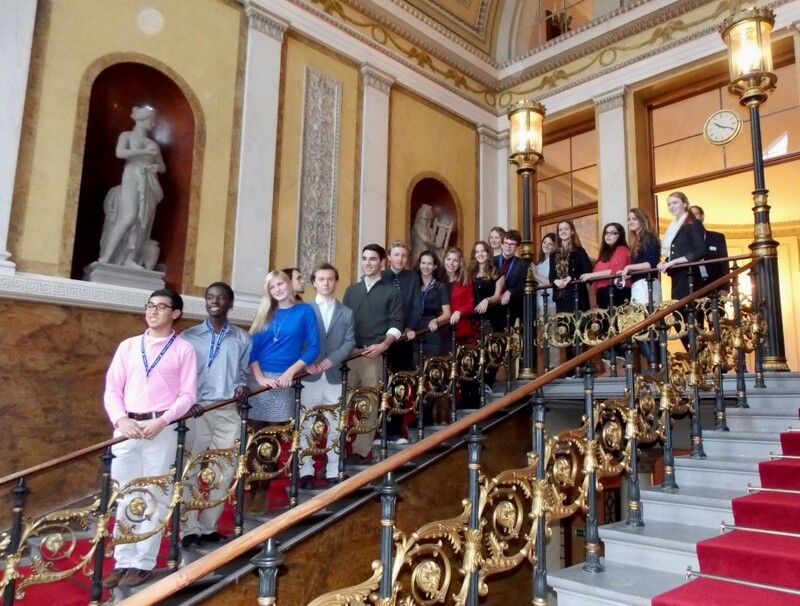 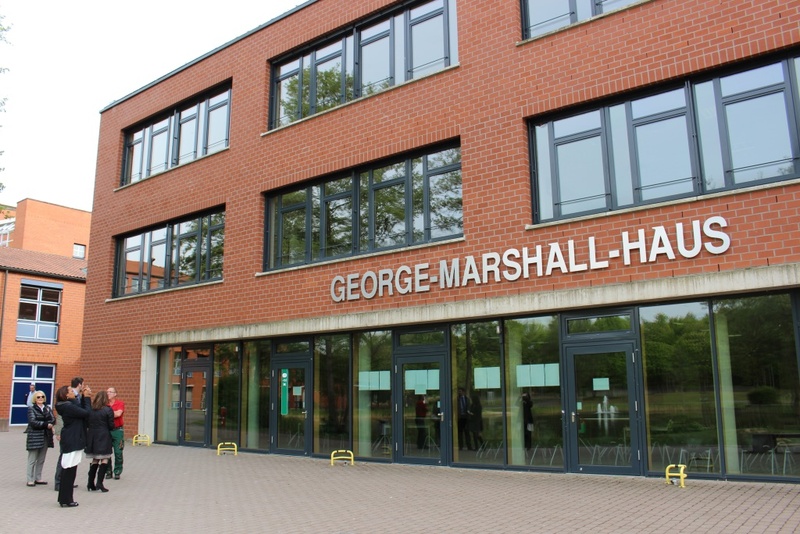 The George Marshall Society, in cooperation with the George C. Marshall International Center in Leesburg, VA, offers a George Marshall Stipend for students and young scientists doing research on transatlantic relations and the Marshall Plan. 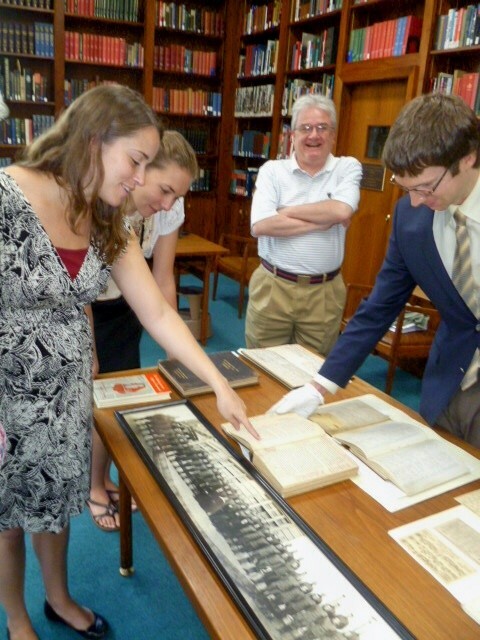 The Stipend covers a field trip from Germany to Dodona Manor in Leesburg, and the Marshall Foundation Library in Lexington. 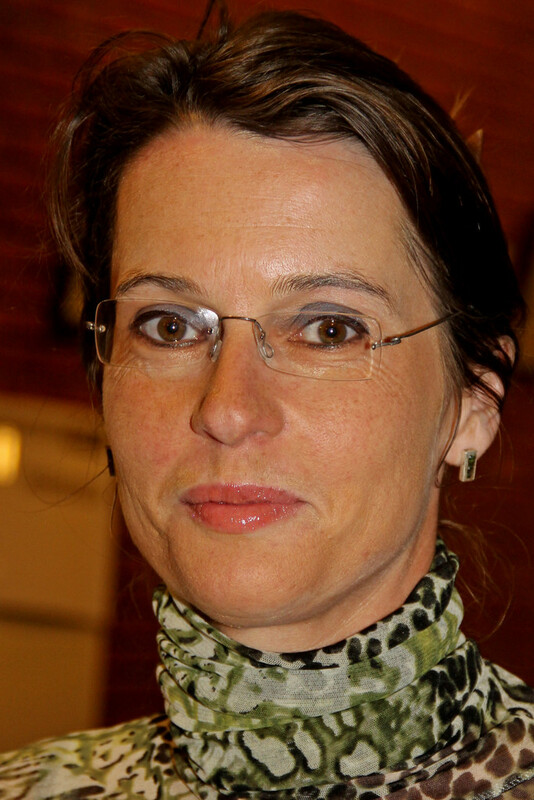 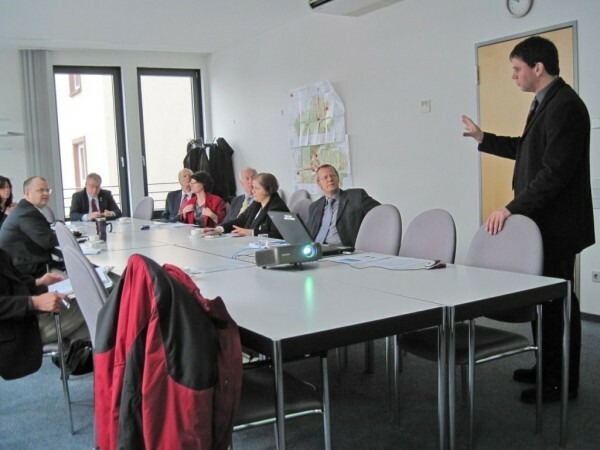 Candidates have to live in the Frankfurt/Rhine-Main area, if they wish to apply for the grant. 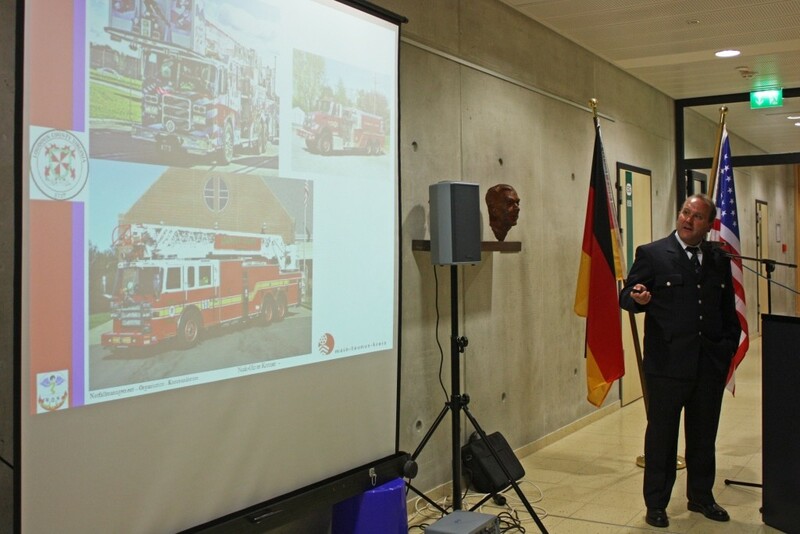 A delegation from Main-Taunus Kreis has explored further fields for partnership activities during a visit to Loudoun County. 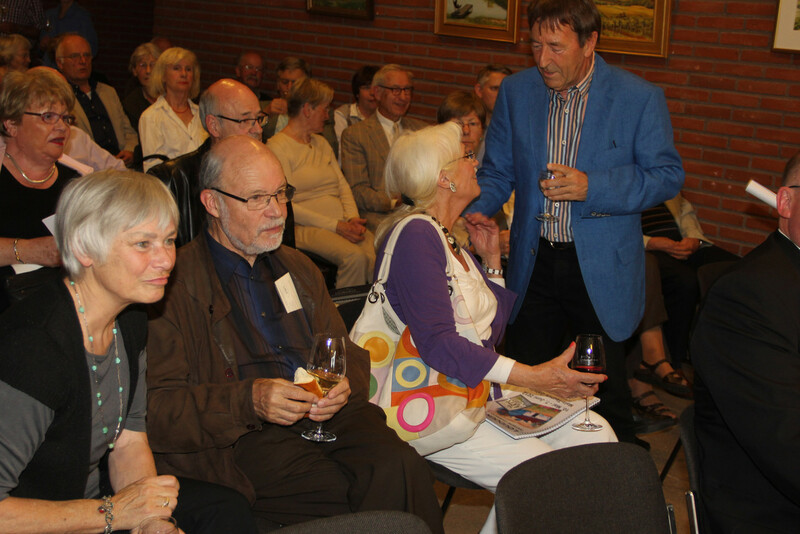 Also during the visit MTK County Execuitve Berthold Gall's elected successor Michael Cyriax, who will take office on October 1, 2011, introduced himself to various representants and institutions in the partner county. 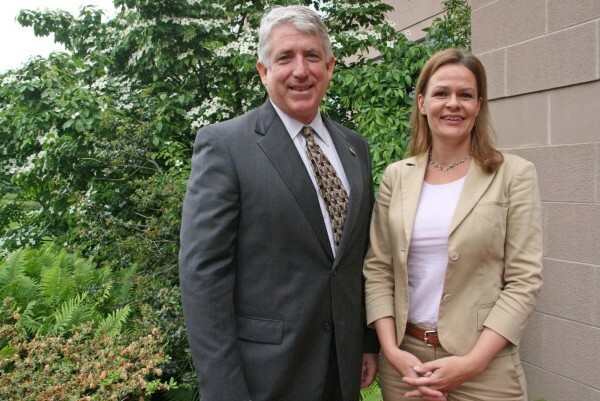 Beside talks with representatives from various businesses in Loudoun, the delegation also met with Senator Mark Herring (VA). 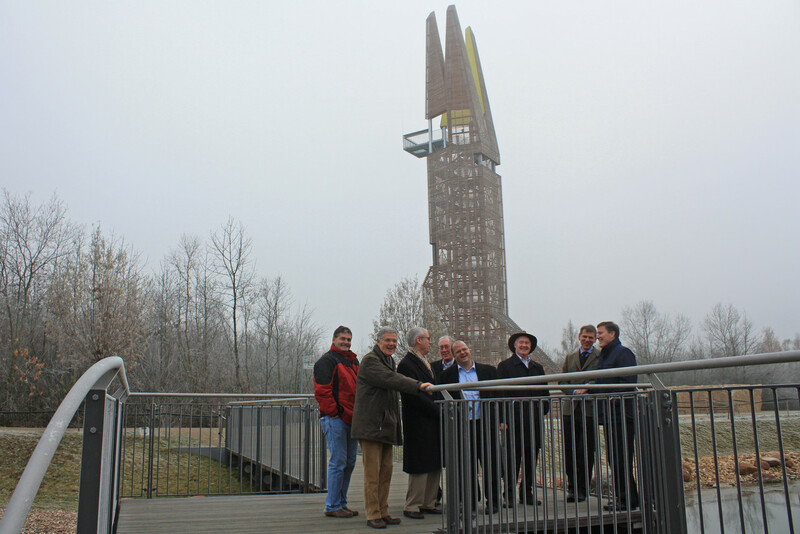 Also the group discussed tourism development opportunities with the Loudoun County Visitor's Association. 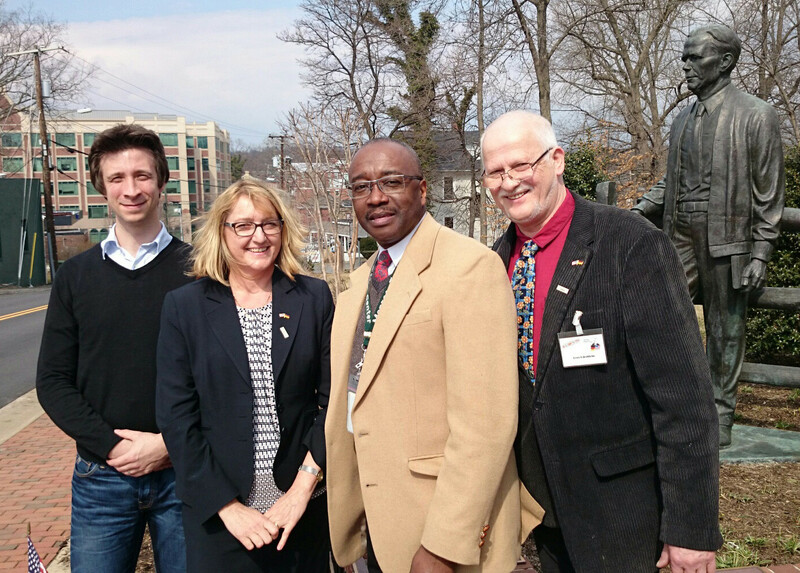 A further stop was at the George Washington University, where nurses are being trained in simulated hospital rooms. 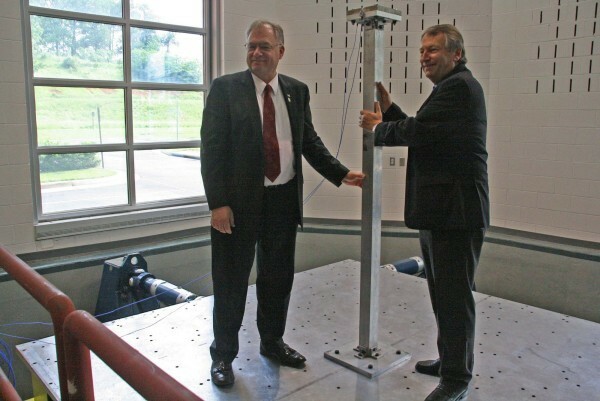 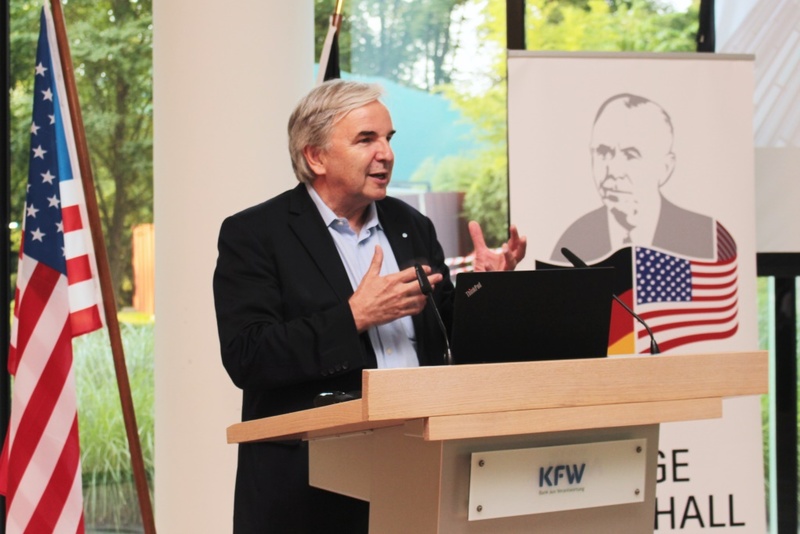 At the CS Monroe Technological Center they discussed the school's partnership with MTK's Konrad Adenauer school - a unique transatlantic link between two vocational schools. 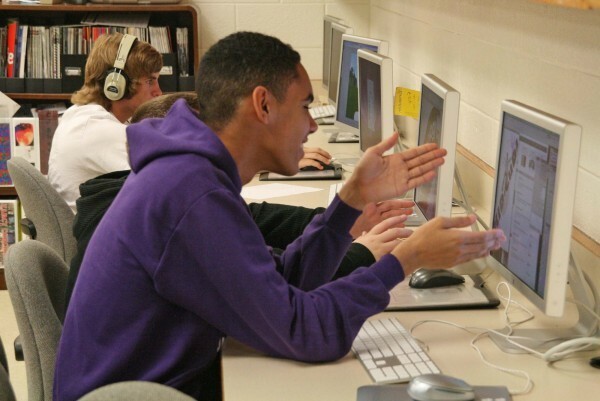 Under the shield of the student exchange program SPEP and various school-to-school links already around 300 students have been traveled between the two Counties. 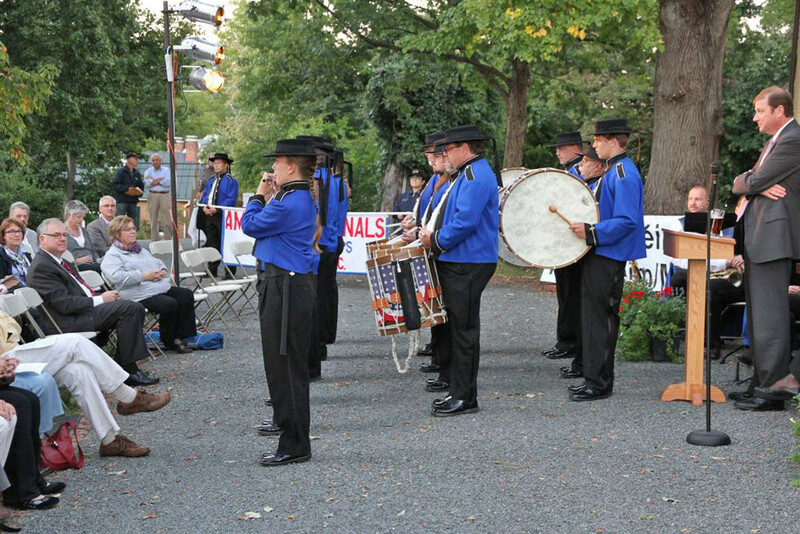 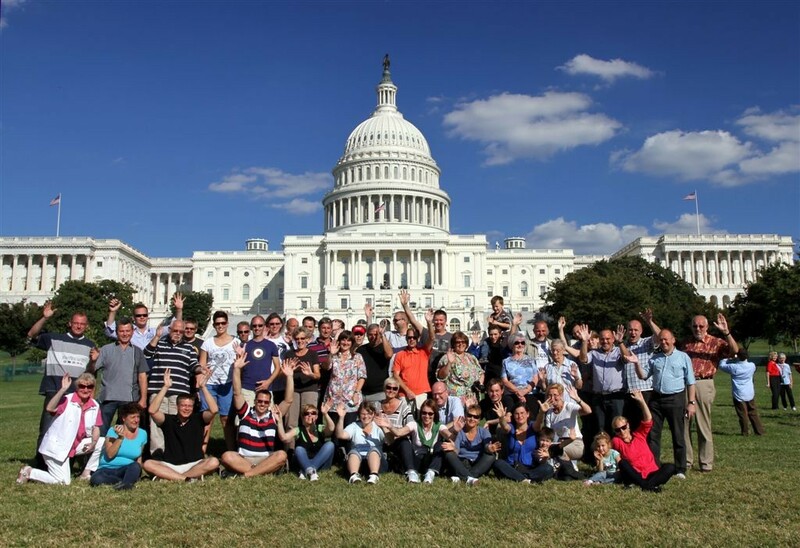 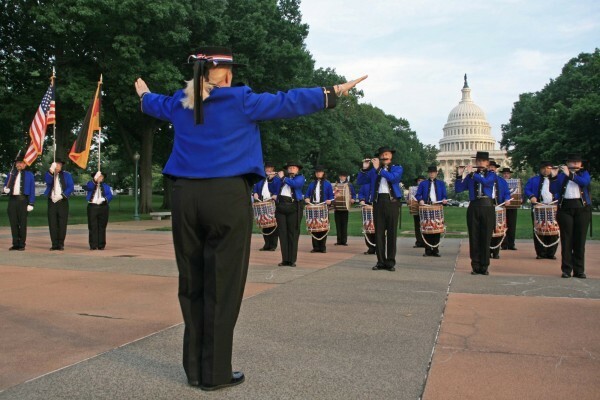 An open-air concert of the American Originals Fife and Drum Corps at Capitol Hill in Washington DC to honor the German visitors demonstrated that the partnership is not only a connection between Counties, but also between friends. 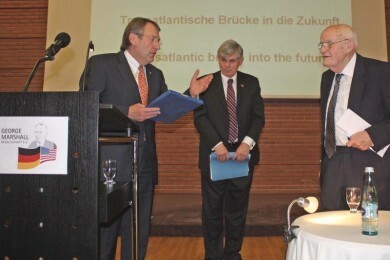 The Sistership Main-Taunus Kreis - Loudoun County, VA has been awarded the most active town/county partnership by the Frankfurt-based Steuben-Schurz Society. 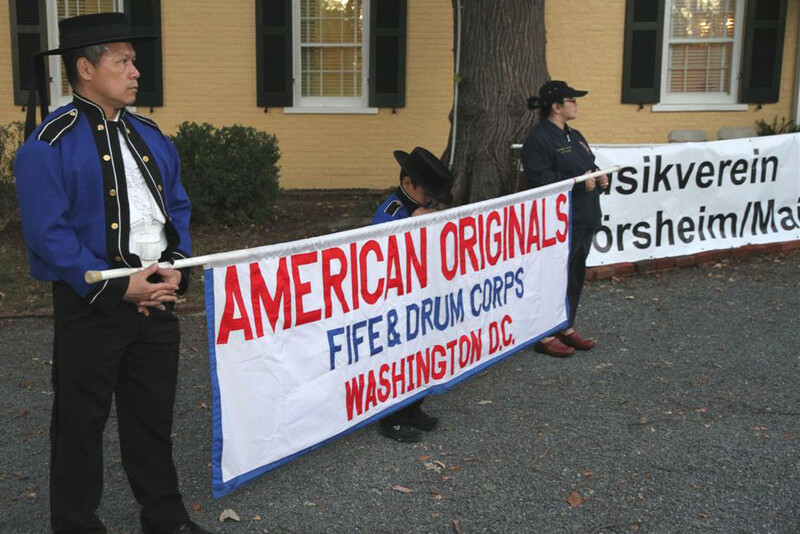 The oldest German-American friendship organization especially recognized the engagement of the George Marshall Society. 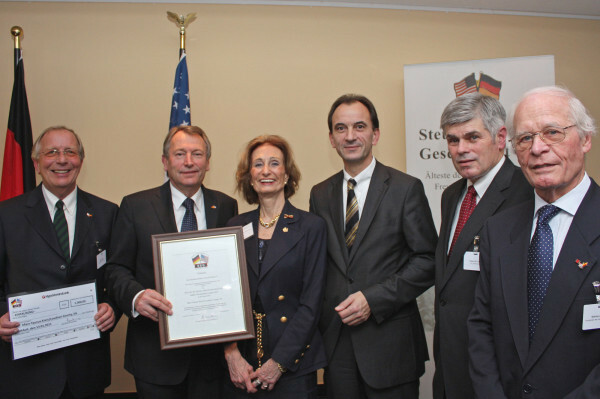 In a ceremony in the city of Frankfurt The Steuben-Schurz President Dr. Ingrid Gräfin zu Solms-Wildenfels (top, left) handed over the award to MTK's County Executive Berthold Gall, also Chairman to the Marshall Society (top, right). 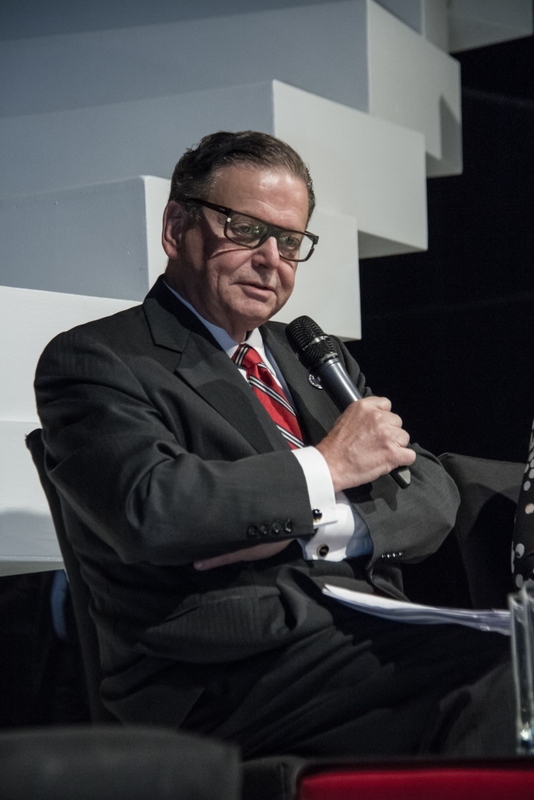 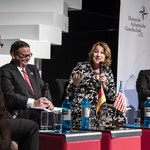 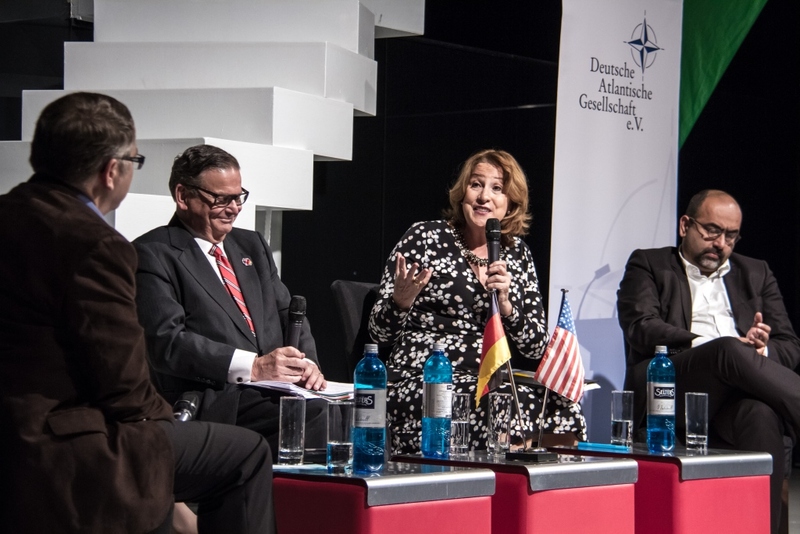 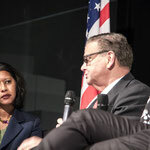 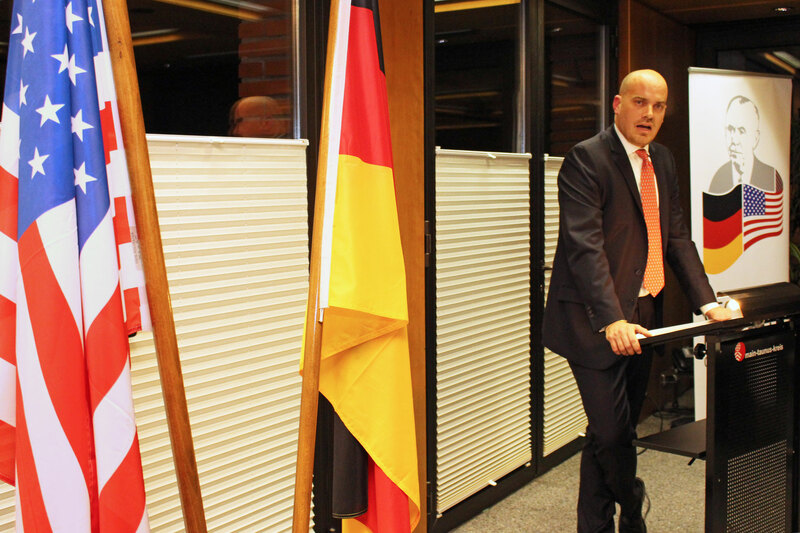 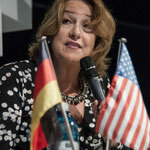 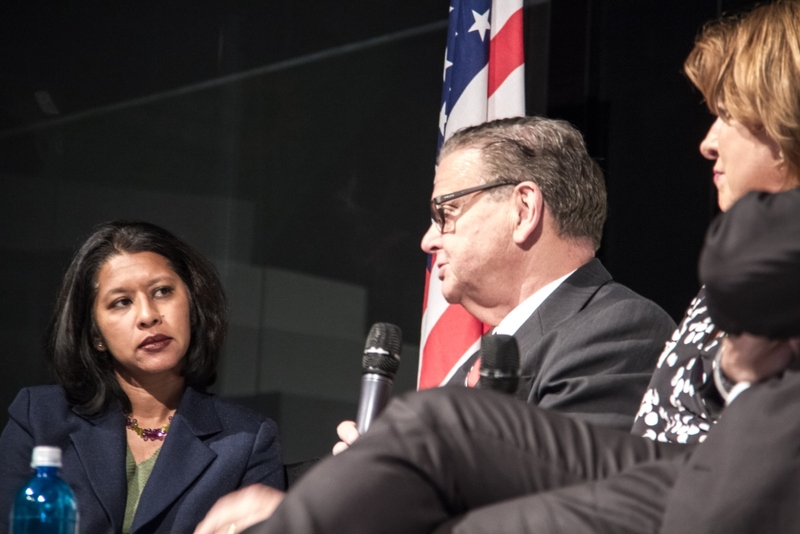 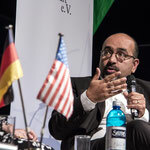 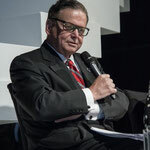 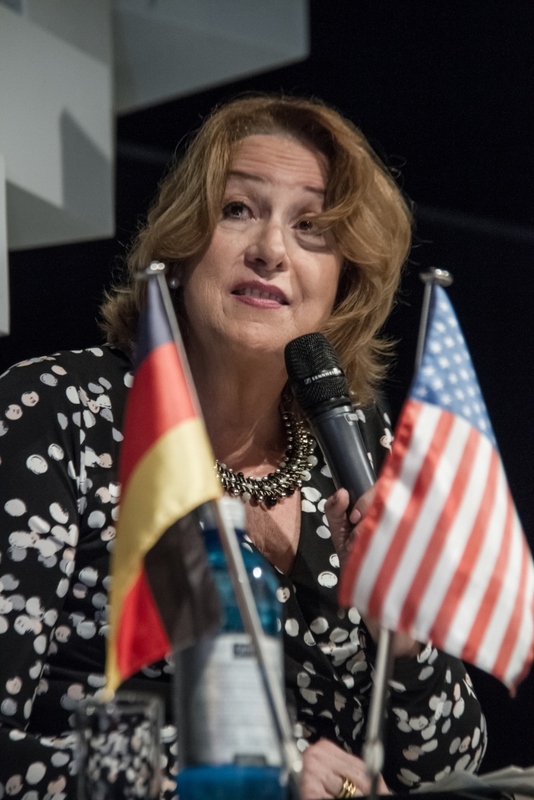 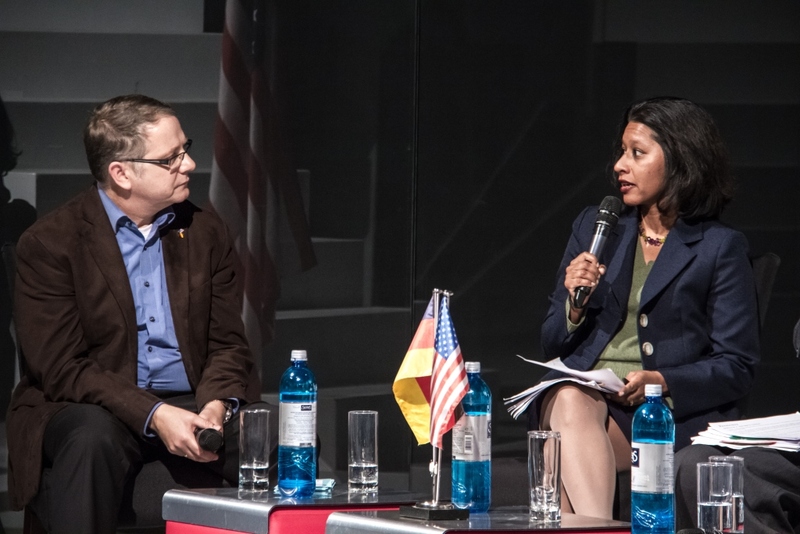 In speeches, US Consul General to Frankfurt, Edward Alford, and the State of Hessen Minister Michael Boddenberg referred to the crucial roll of good US-German relations. 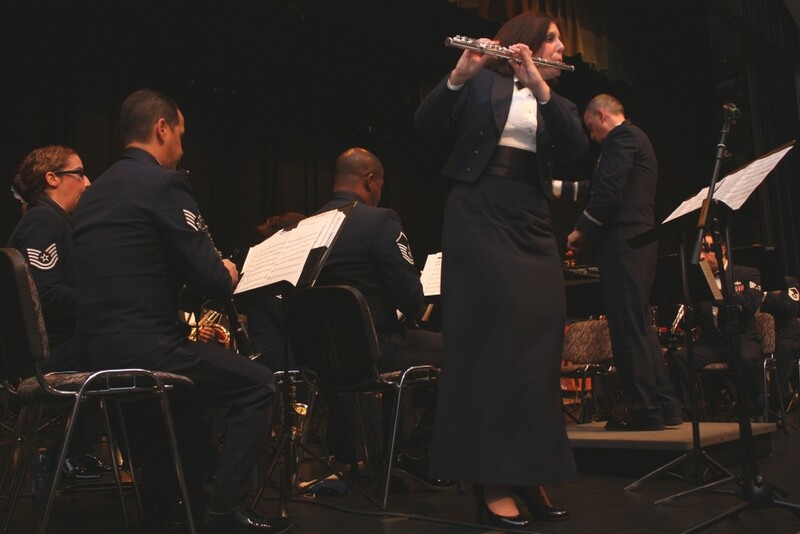 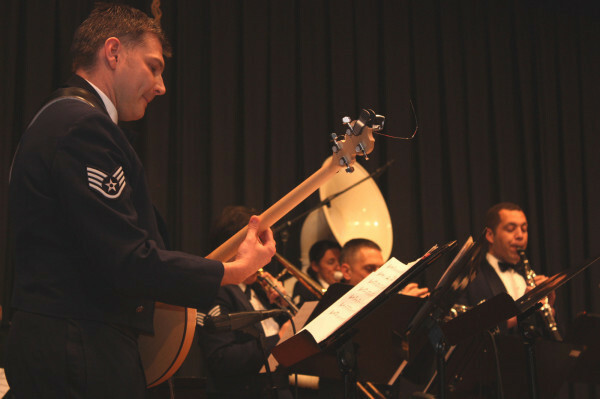 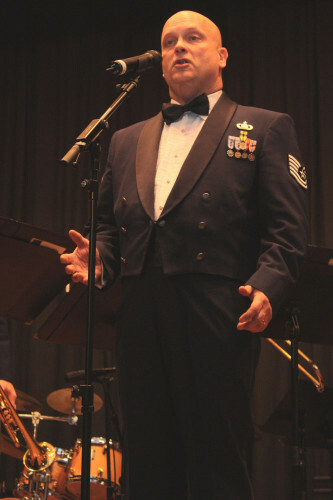 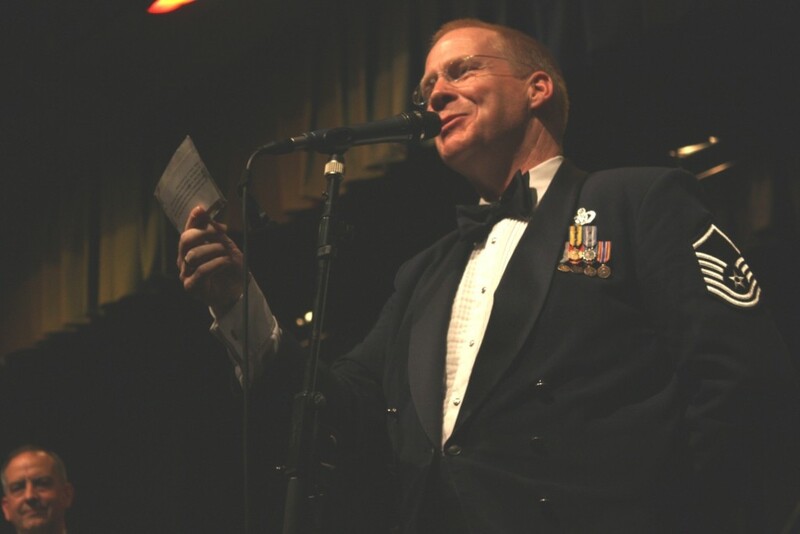 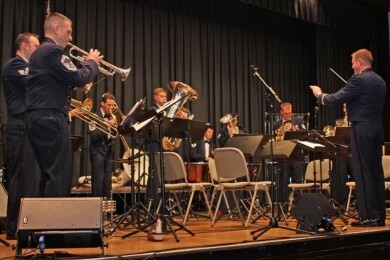 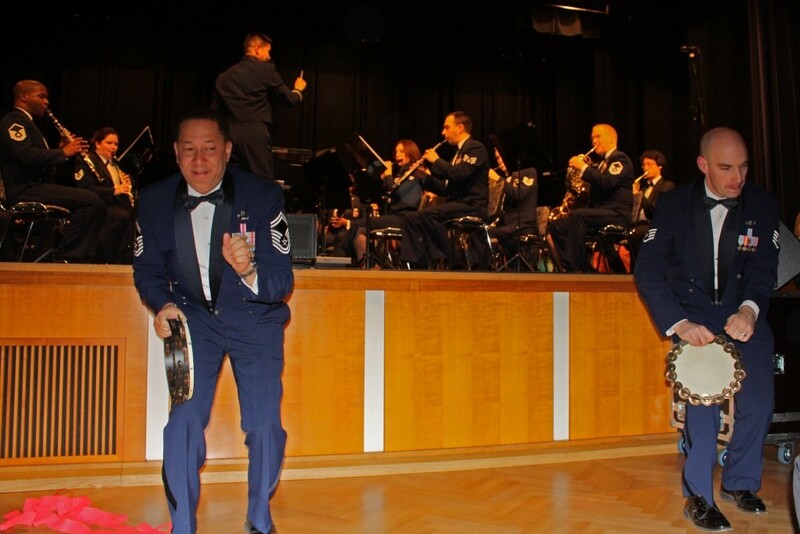 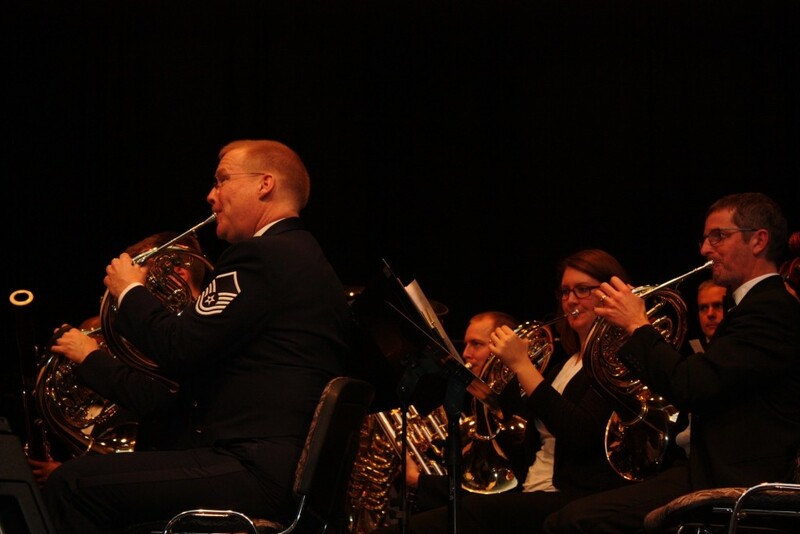 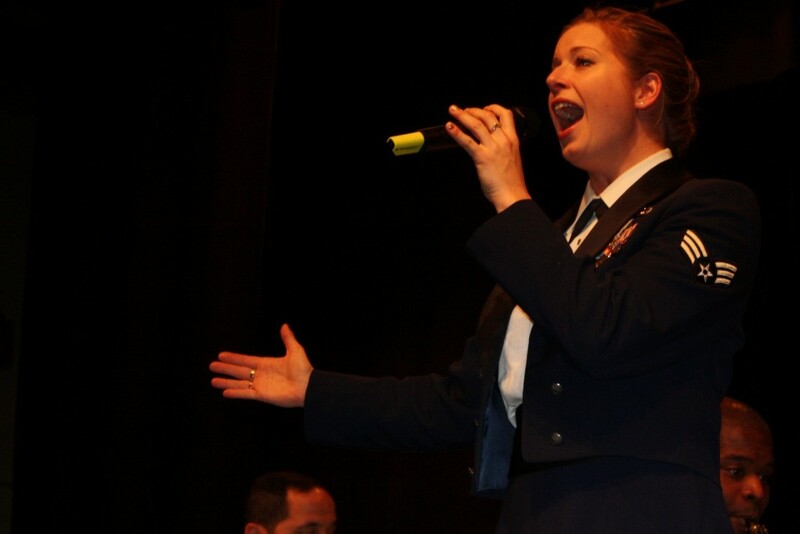 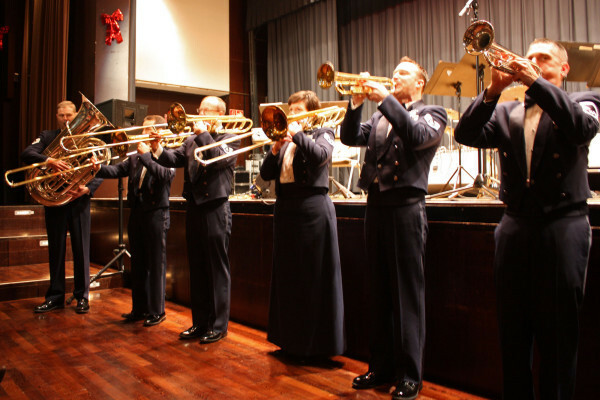 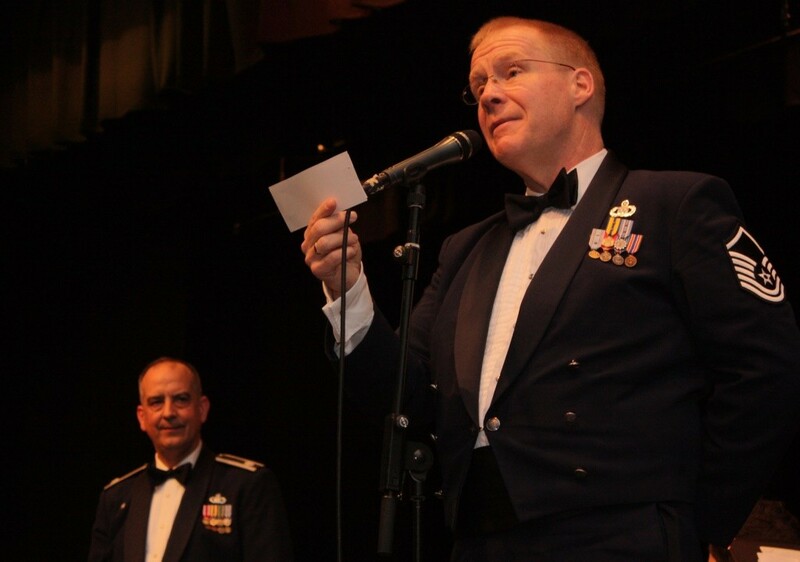 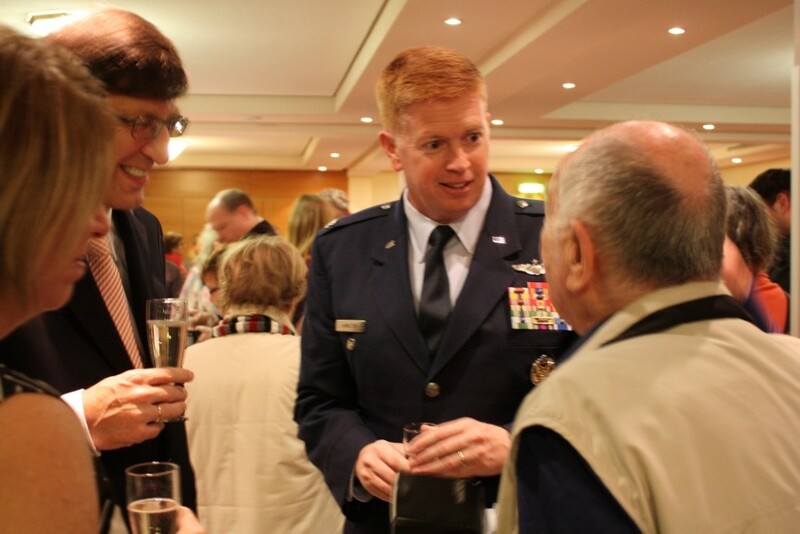 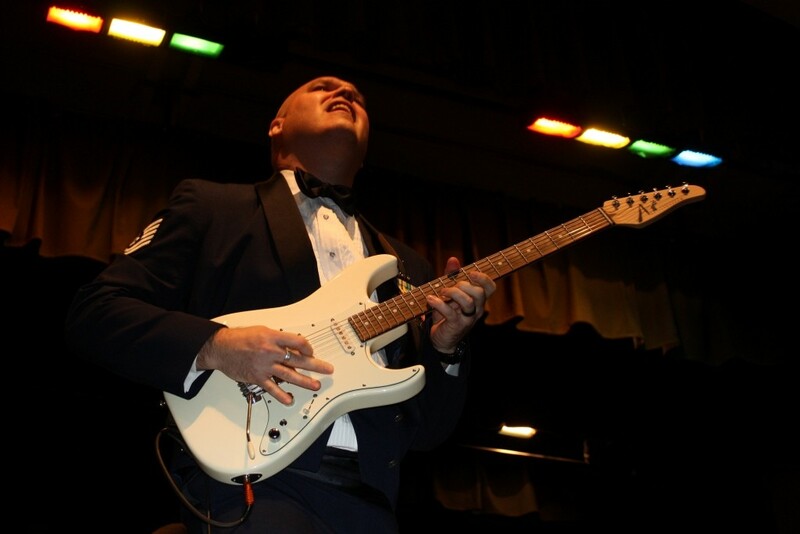 By invitation of the George Marshall Society the Band of the US Air Forces in Europa has performed in the City of Eschborn on Dec 8, 2010. 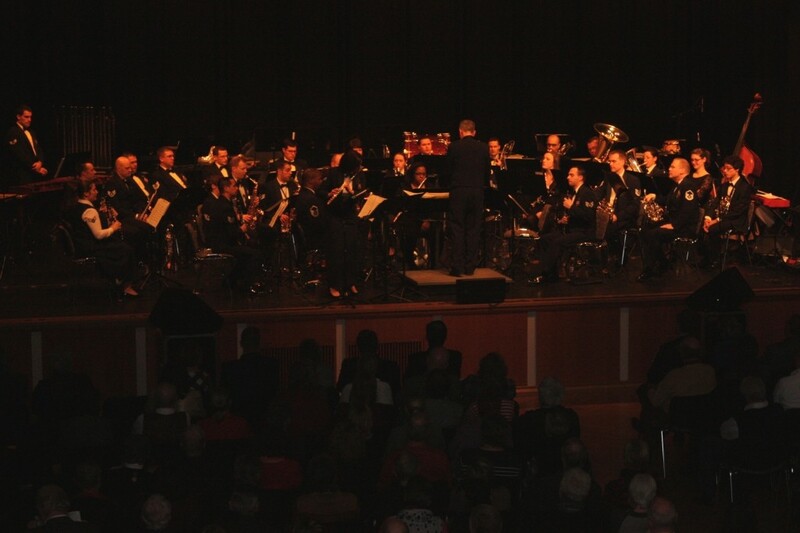 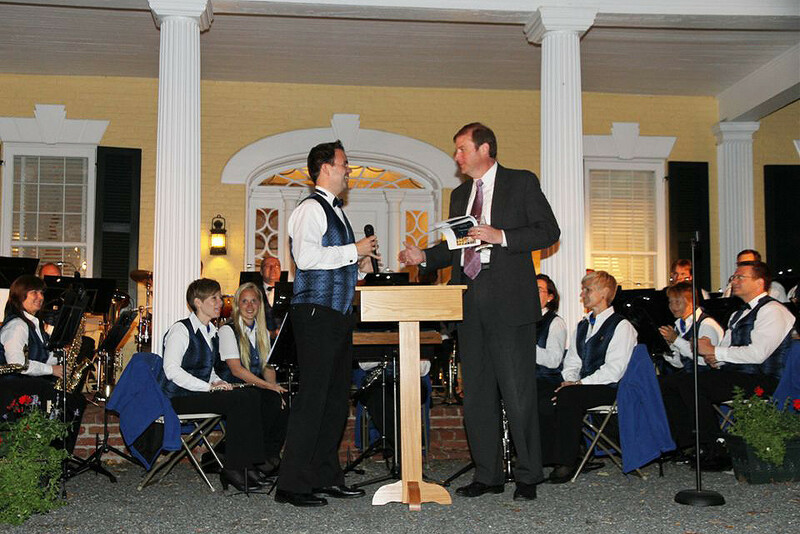 The Band's program with Christmas songs in various styles was a highlight for the audience. 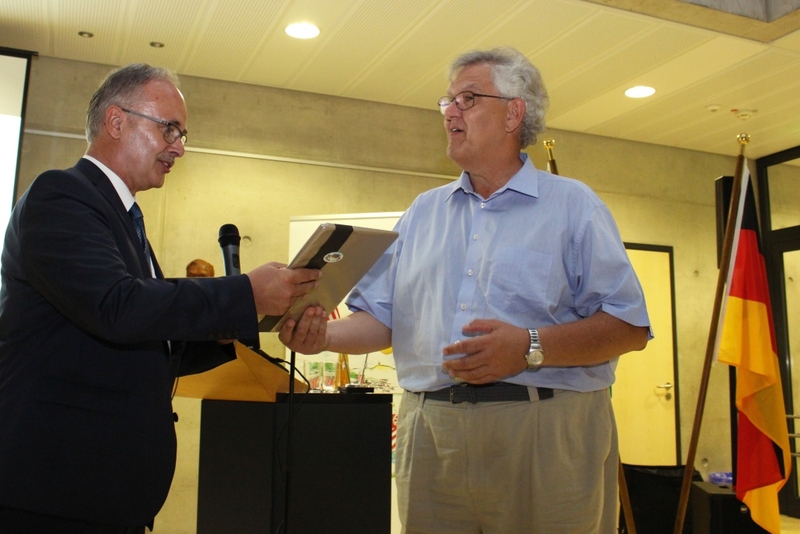 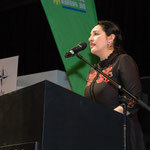 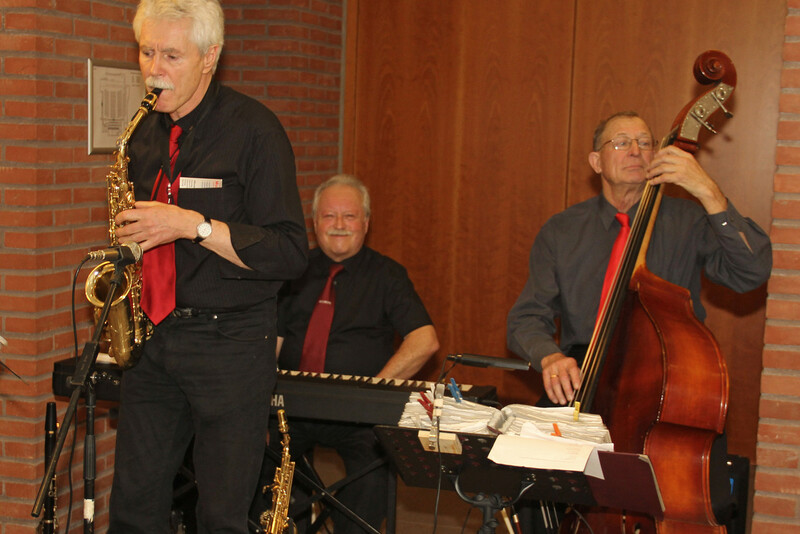 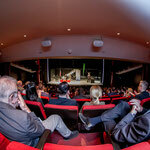 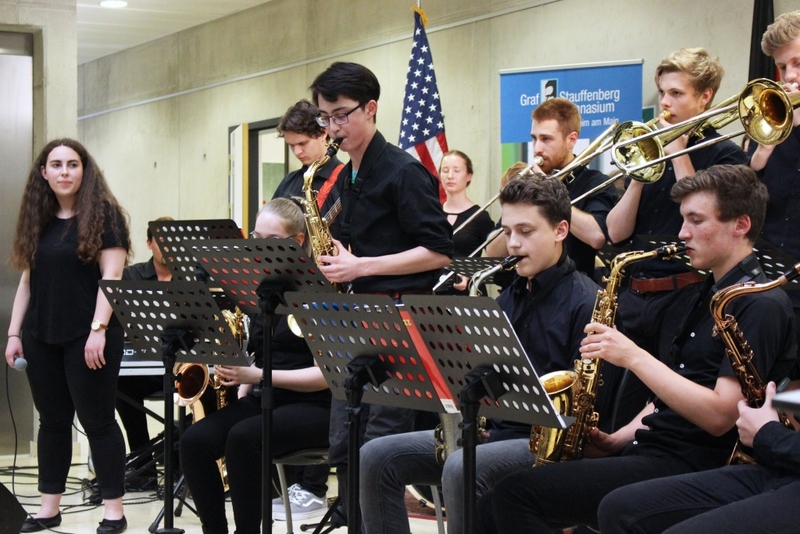 The concert was made possible thanks to the cooperation with the City of Eschborn whose Deputy Mayor Matthias Geiger spoke a few greeting words. 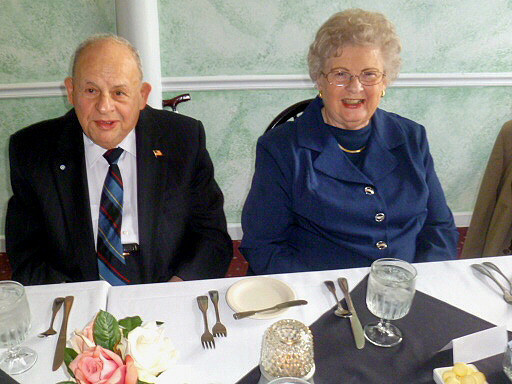 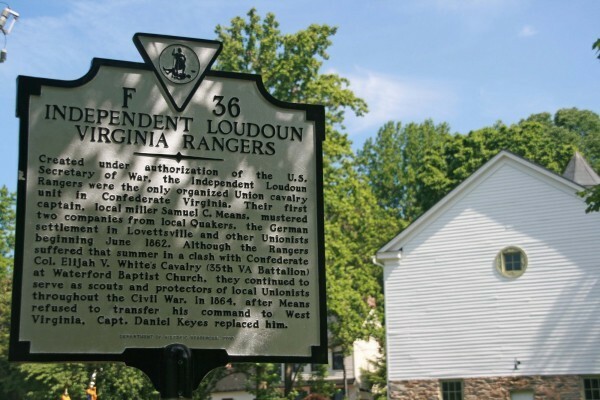 The Marshall Society will intensify its cooperation with the George C. International Center at Dodona Manor in Leesburg, VA. 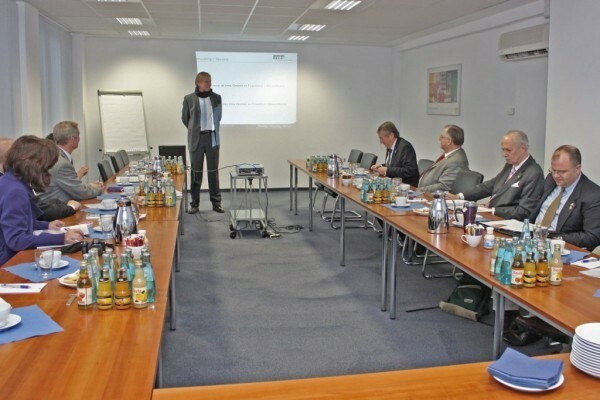 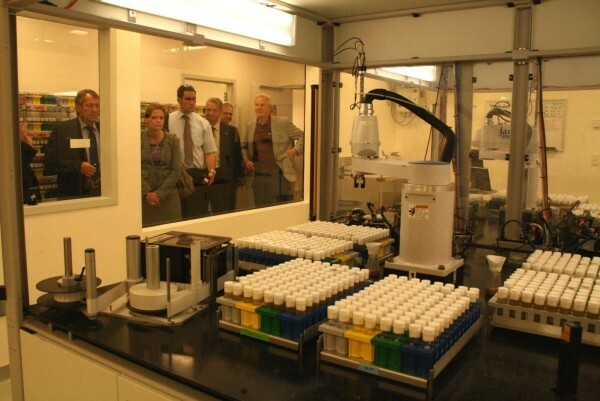 This was discussed with representants from both institutions during a visit to Hofheim, MTK. 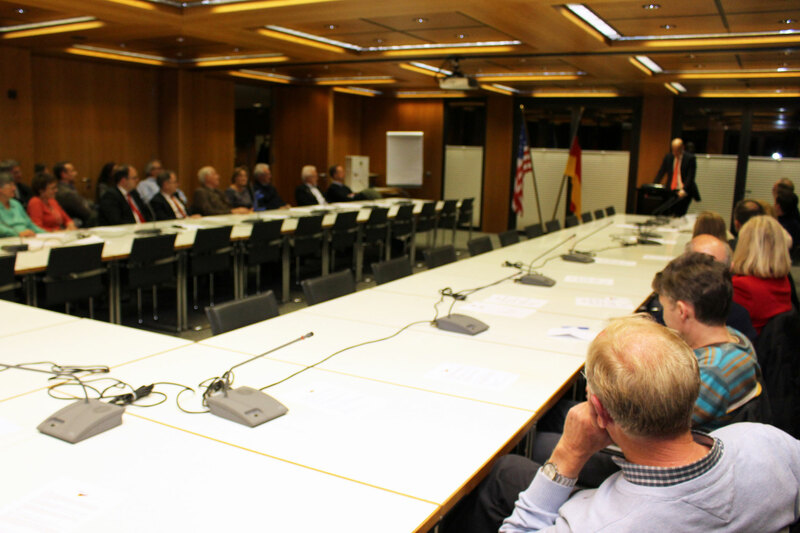 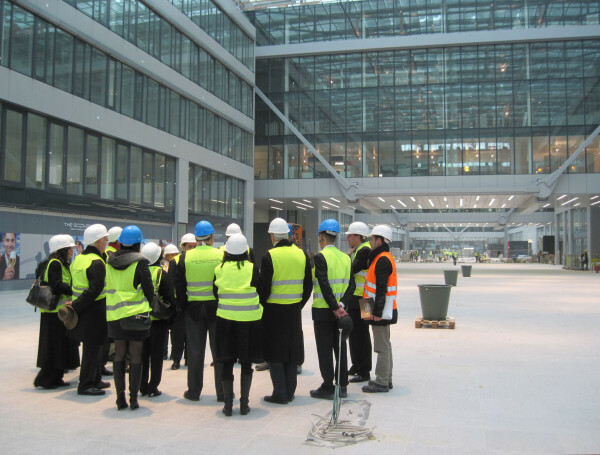 A delegation of the Northern Virginia Regional Commission headed by its Chairman Hal Parrish and its Executive Director Mark Gibb explored the public transport network during a visit to the Frankfurt region. 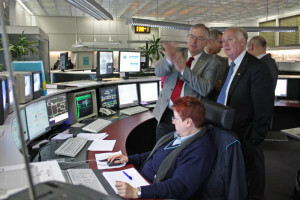 The visit provided insights in the local transport management, ticketing systems and links between air and rail. 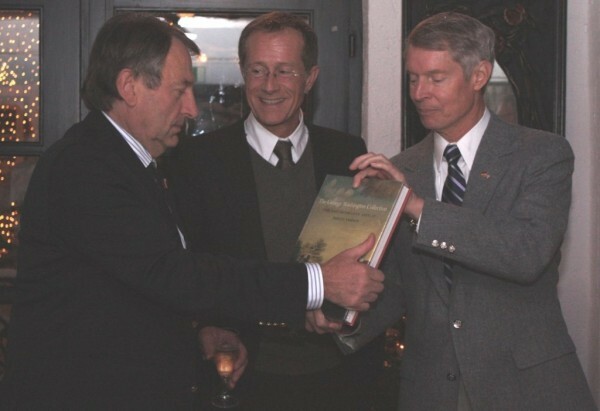 Members of the George Marshall Society were involved in the preparation of the visit, which was a result of a delegation visit to the DC region in May 2010. 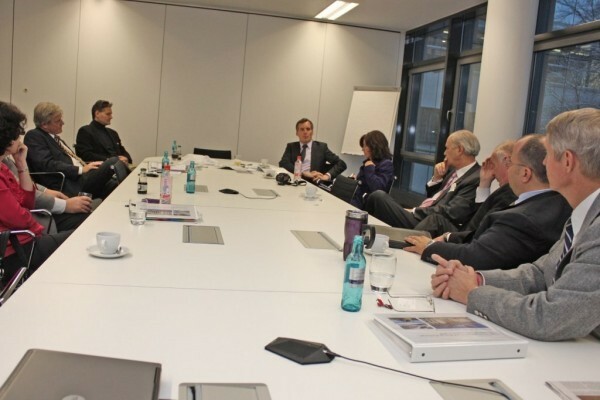 The NVRC delegation relied on public transport during their stay which gave the travelers an opportunity to get first-hand experience about the rail network in the region, especially while the onset of winter brought lots of snow to Frankfurt's streets. 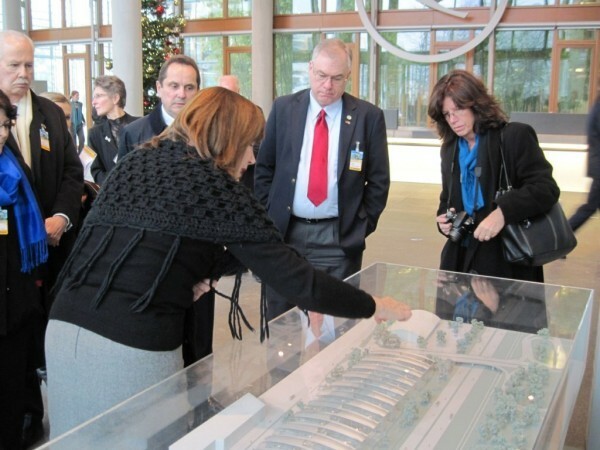 Loudoun County's Chairman of the Board of Supervisors Scott York was joining the NVRC delegation visit. 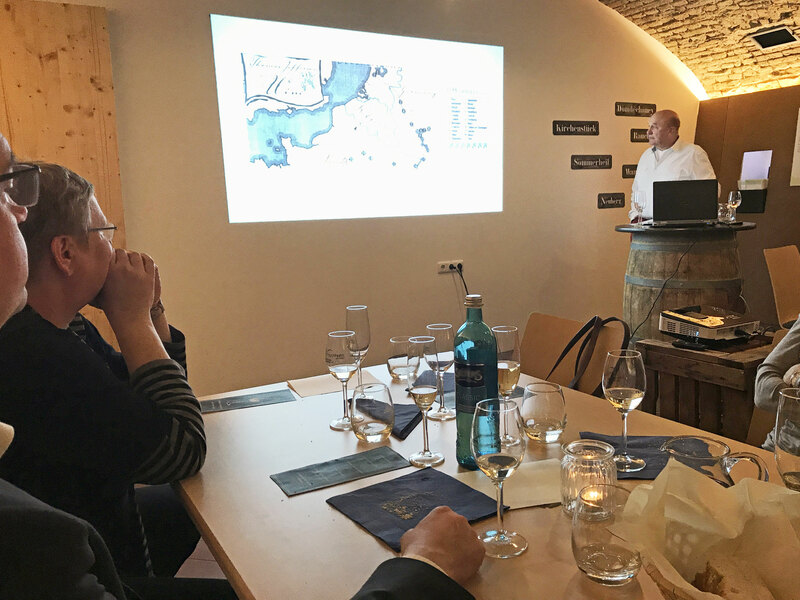 During a visit to Frankfurt, representatives of the Virginia Tourism Corp took the chance to promote the Capital region as a tourism destination. 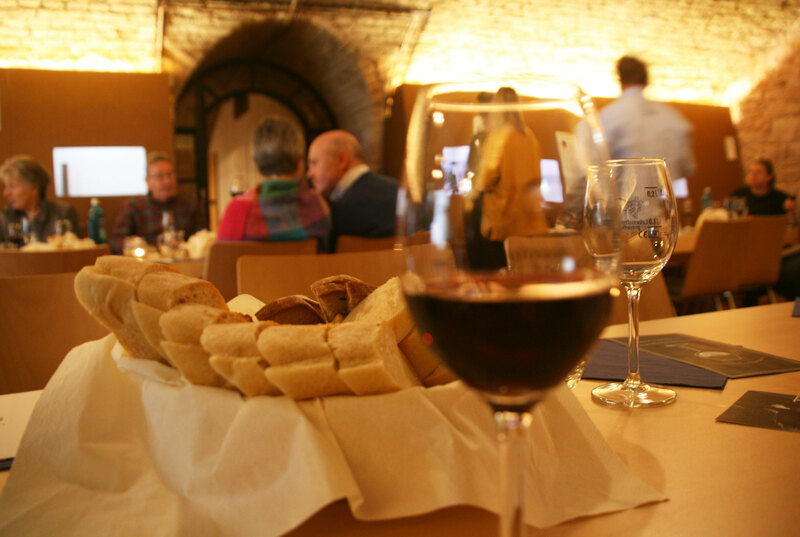 The main focus was wine. 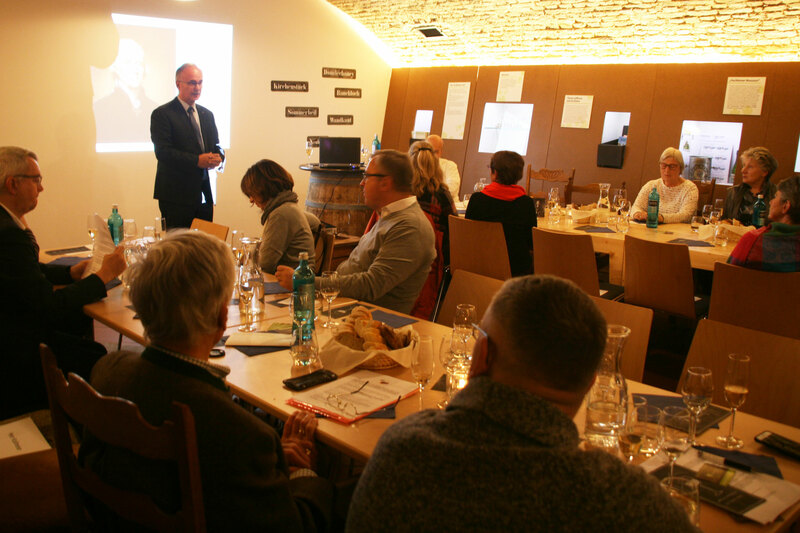 Johannes Latsch, Managing Chairman of the Marshal Society, participated in a meeting with media and tourism representatives of the Frankfurt region. 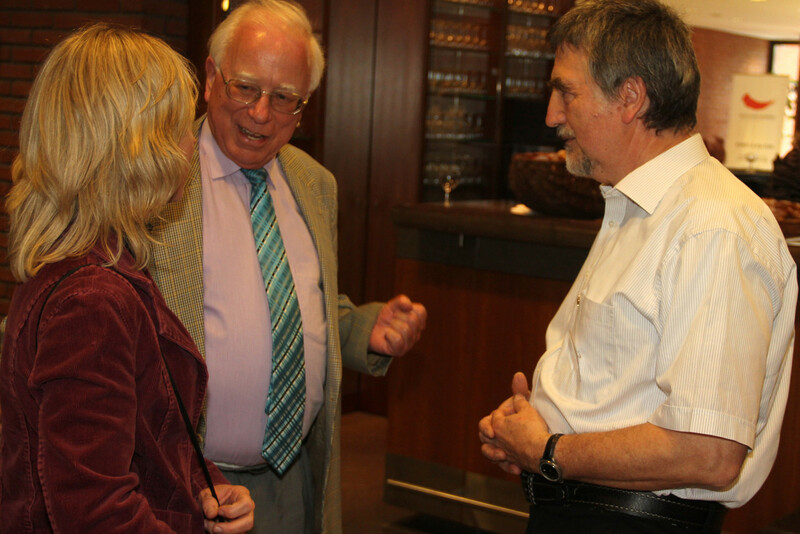 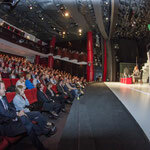 In talks with the guests from the Capital Region some perspectives for tourism between the two regions were discussed. 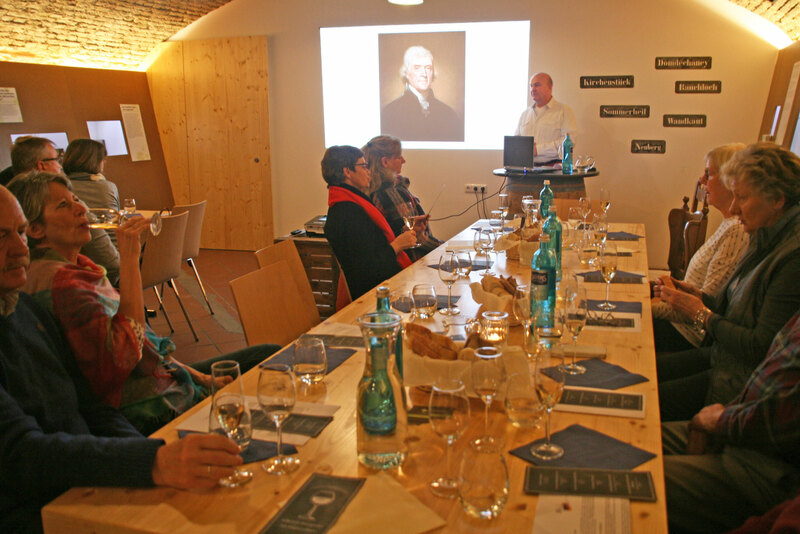 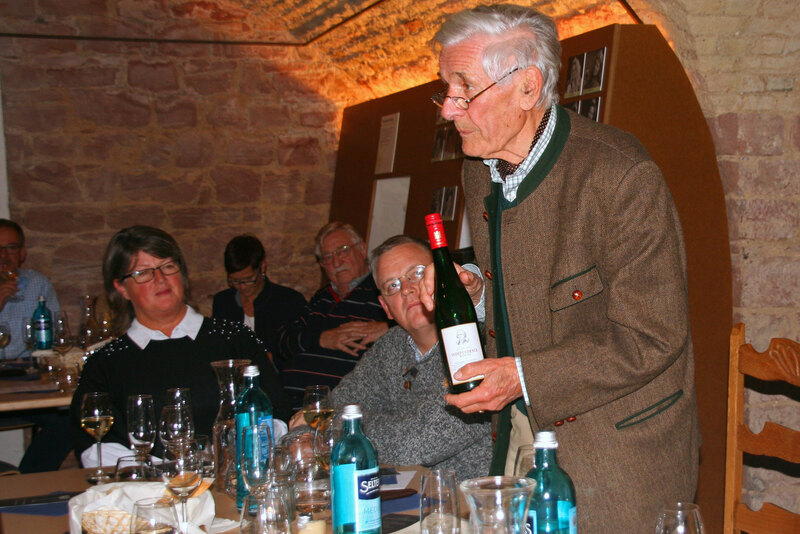 An interesting historic connection is the wine travels that brought former US-President Thomas Jefferson also to the Frankfurt and MTK region. 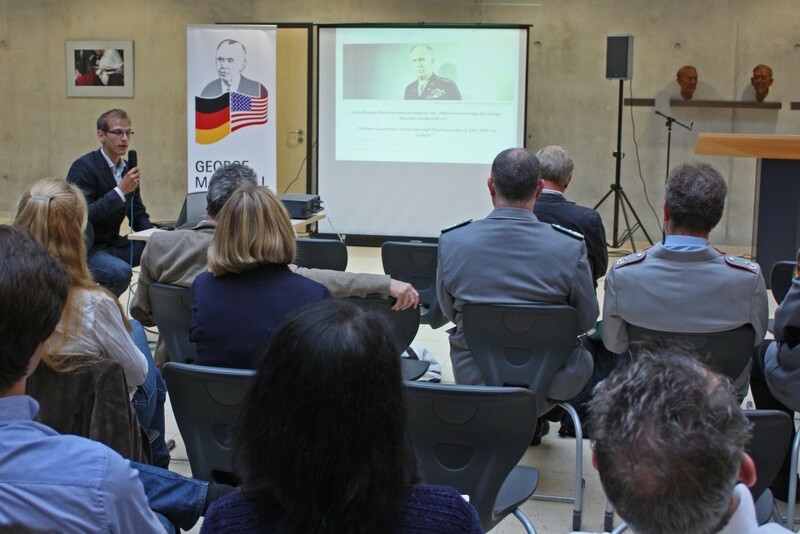 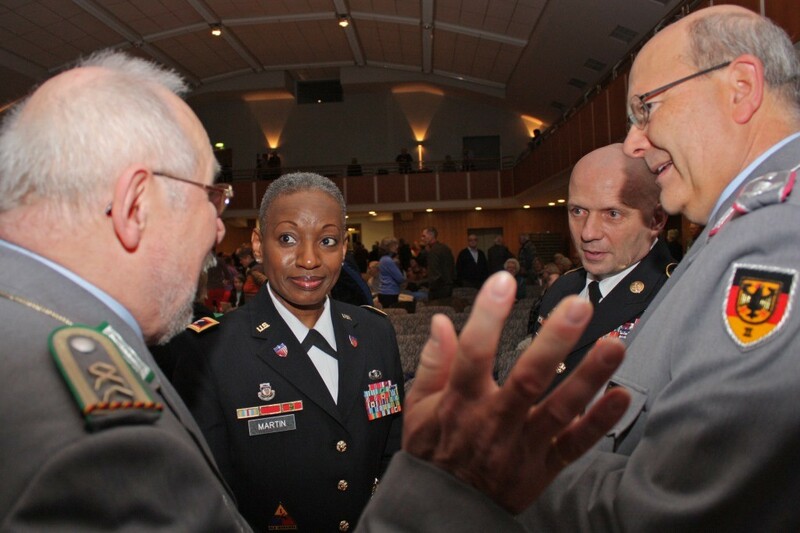 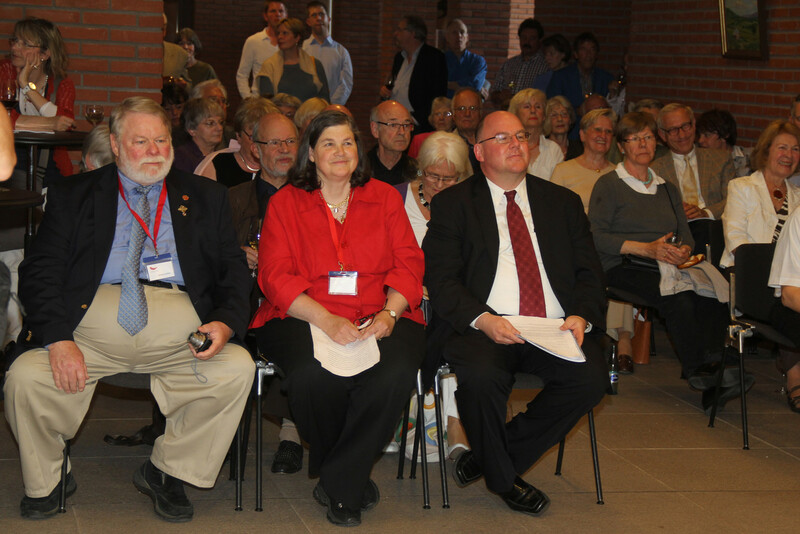 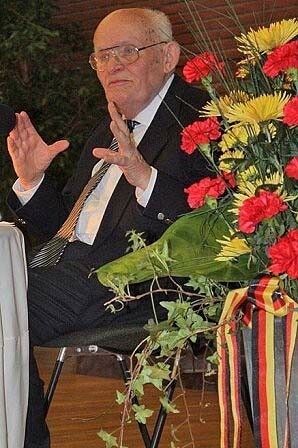 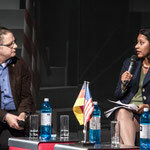 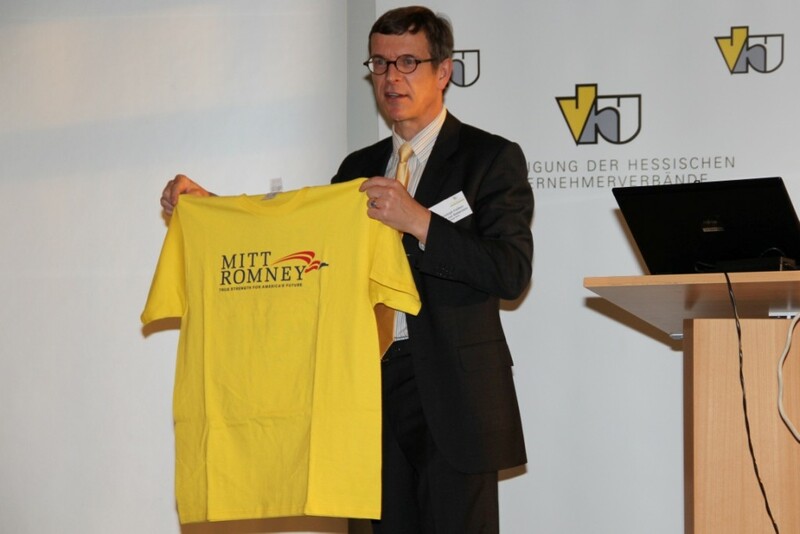 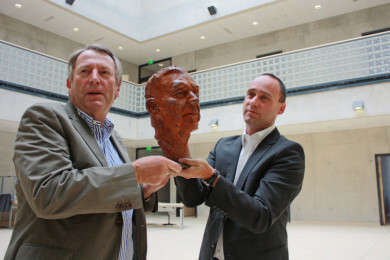 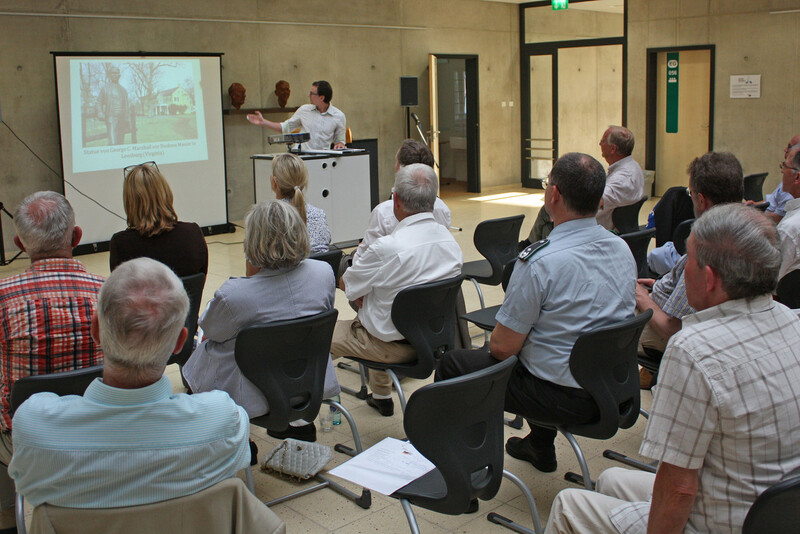 The George Marshall Society took part in a public event titled "Brühlwiesengespräche" (Brühlwiesen Talks) at the vocational school Brühlwiesenschule in Hofheim, Germany, on May 10, 2010. 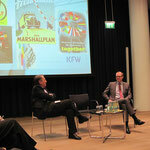 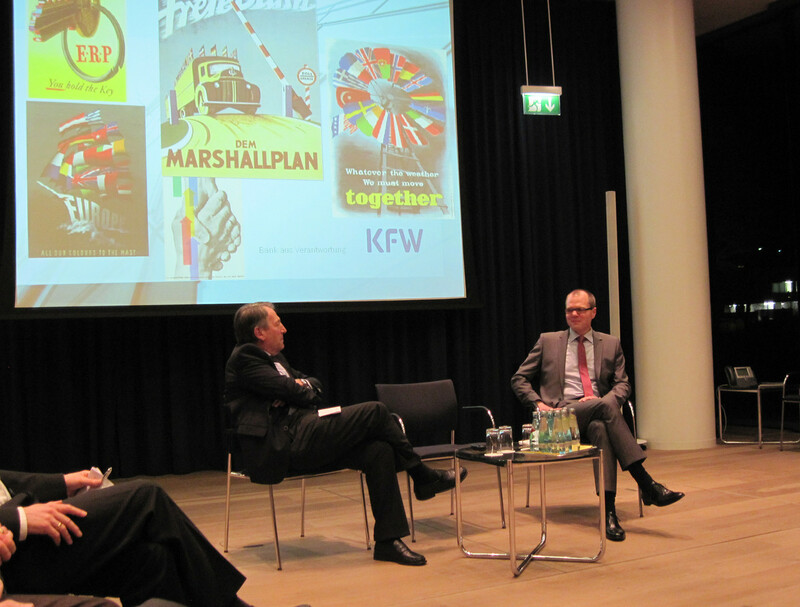 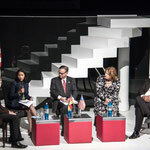 The event focussed on the Marshall Plan and its influence on the unification of Europe. 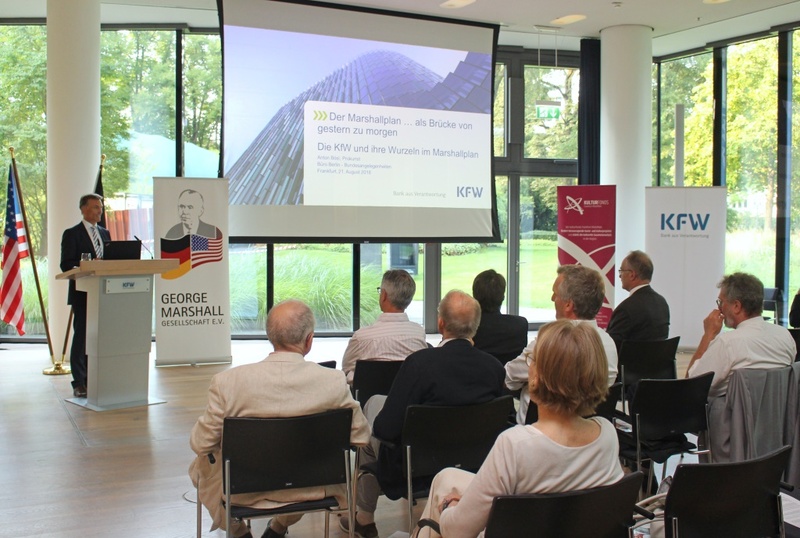 Members of the Marshall Society also took part as a representative of the KfW Bank (an institution founded as a result of the ERP).